Since people started to go on holidays, millions are coming to France for tasting Bordeaux wines, for shopping in Paris or for sunbathing on the Mediterranean beaches, for skiing in the Alps, for experiencing the Burgundy kitchen or for exploring the villages of the Provence. 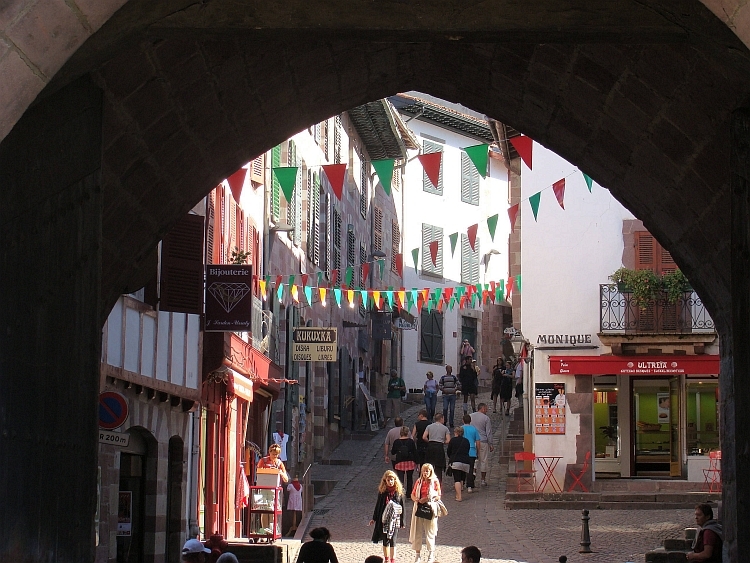 Every year, millions of people are visiting the villages and towns, the mountains and beaches in France. Yet there are still large parts of France that hardly see any visitors. What is the story of the villages and towns of these regions? The coming weeks Willem Hoffmans and I will explore these regions of the "unknown France" by cycling to Spain through these regions. French Flandres, Picardy, Normandy, the western Loire area, Limousin, Auvergne, Cantal and Languédoc. Then we will cross the Spanish border for a grand tour through the Spanish and the French Pyrenees. A stiff westerly wind is blowing across the polder. Large cumulus clouds are rolling over with breakneck speed from horizon to horizon. After just a few miles we have to find shelter under a bridge in the uninspiring suburbs of Nieuwegein. When the downpour has finished, we resume the ride. Marit, Edith, Inge and Marijn are accompanying us during the first hours of our trip. We are riding westward over the winter dike on the north bank of the River Rhine. We are facing strong headwinds but at least it is dry. We find ourselves in a classic Dich setting with a large river, a dike, half cloudes skies, strong winds and cyclists facing those winds. Only the windmills are missing. We reach Ameide with its stately, sober dark brown mansions on the River, a scenery that surely does not affect the traditional Dutch atmosphere. After a lunch stop Marit and Edith return to Utrecht. Marijn, Inge, Willem and I carry on westward along the River Rhine. The wind is gaining still. 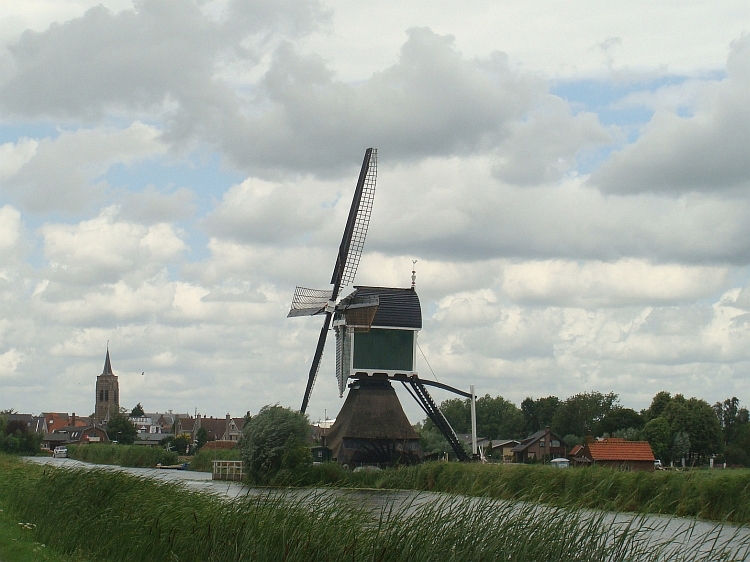 We leave the River Rhine at Groot Ammers, where the windmills make their introduction in the Dutcher than Dutch landscape. We keep on going in a westerly direction through a lush green polder landscape. The flat land is filled with lawns, ditches and rows of trees. And windmills. Ever more windmills as we are cycling through the windmill wonderland of Kinderdijk. We are cycling through leagues of Japanese, Italian and American tourists in this apotheosis of Dutch nostalgia. After a dinner in the center of Dordrecht and Inge and Marijn also return to Utrecht by train. Only Willem and I remain. With limited success we try to find an efficient route through the suburbs of Dordrecht and Zwijndrecht. In the process we get lost and not much later I have lost willem too. Eventually we find each other and we find the way and finally we are able to return to open landscapes. It is late now and in Heerjansdam we find a camping. "The harder it blows, the louder our Dutch Prime Minister Jan Peter is pedaling." During the recent election we have heard it over and over from several celebrities of the Christian party. Unfortunately, in reality it does not seem to work that way. At least not for mere mortals like Willem and me. From dawn in the national landscape of the Hoekse Waard we are facing headwind. We have not had breakfast yet and we cannot count on it either. It is Sunday and then there is Sunday rest in theses regions. We cross the vast plains of Hoekse Waard and reach the Hollands Diep. We cross the Haringvliet with the Haringvliet Bridge and reach the island Goeree Overflakkee. Here is nothing to eat either. A long straight road cuts through the landscape that is flat as a billiard cloth. There is nothing that interrupts the emptiness. Still meditative moods do not have a chance because of the wind and the growing hunger. Finally we reach the Grevelingendam, a new bridge of a few miles long, that brings us on the island Schouwen Duiveland. In Bruinisse we finally manage to find a cafe where we can eat something. It may be clear that we will plan our logistics more carefully next time, I pledge myself. With fresh energy we resume our struggle against the wind. We cross the island and now we find ourselves on the dike that is heading toward the Oosterscheldedam. The views over the dike, the dunes and the Oosterschelde with the Oosterscheldedam in the distance: These stunning views are Zeeland in a nutshell. The wind on the dike is quite a problem. The harder the wind blows, the harder I seem to get myself in motion. I am definitely pedalling ant harder, that is for sure. We finally reach the Oosterscheldedam. For the first time on this trip we do not have headwind ant more. The wind is from the side now. Cycling is relatively relaxed way. 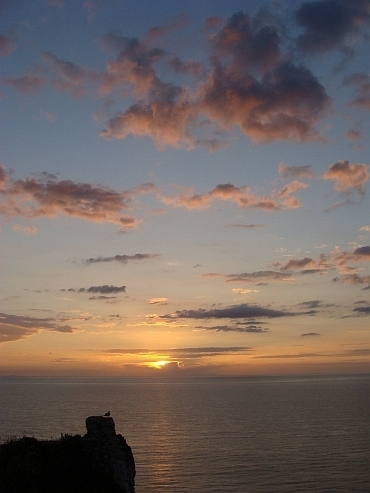 It is an experience to be on the Oosterscheldedam and the barrier island Neeltje Jans. 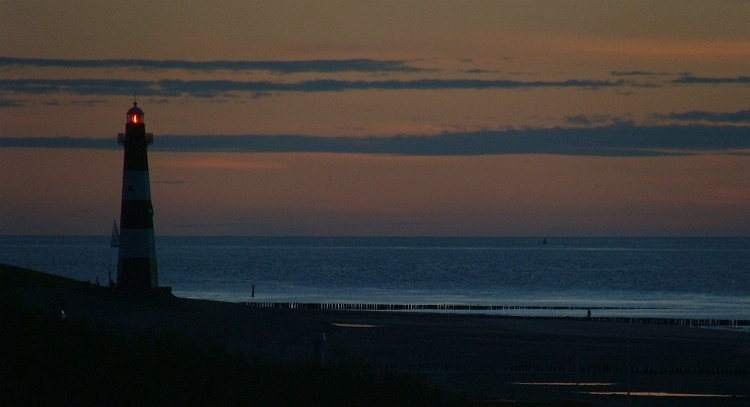 We reach North Beveland and not much later we reach South Beveland. We are passing the dolls houses tourist village of Veere and continue to Middelburg and Vlissingen. With the ferry we reach Breskens in Zeeuws Vlaanderen, where we find a campsite. The sun shines over the cornfields. Zeeuws Vlaanderen is quiet and pretty this Monday morning. 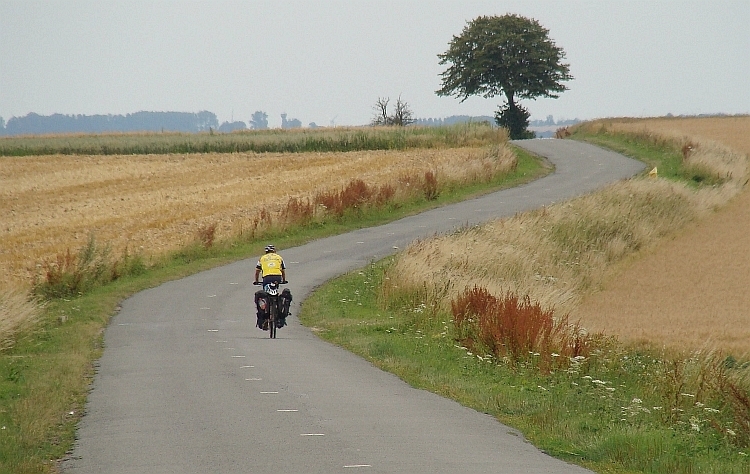 In fact the countryside with its neat meadows and straight treelines offers great scenery for cycling. In Sluis we leave the countryside and we cross the Belgian border. A long and narrow channel leads to Bruges. We cycle along the channel and into the historic city. After lunch we proceed in the direction of Ieper. Soon after Bruges the first signs of relief in the landscape are visible and shortly afterwards palpable. Climbs of 10 meter altitude difference, not much later 20 meter and eventually even 30 meter altitude difference, this is not exactly a Himalaya playground but still it is hillier than I expected. Initially we ride on asphalt, but later on we get some short cobbled lane stretches. Not too difficult, but fun whatsoever. It is still a little more challenging than just plain pavement. We reach the beautiful town Ieper. In the distance the hills of the Flemish Ardennes are visible. The last kilometres of today are the best. We are cycling on small winding roads toward the wooded hills of the Flemish Ardennes. The village of Kemmel lies at the foot of one of the most famous hills of the Flemish Ardennes: the Kemmelberg, a notorious place for cyclists because of the steep cobblestone lane that is leading to the top of the mountain. We save the strip of cobblestones for tomorrow. We put the tent on a campsite on the slopes of the Kemmelberg with beautiful views of the village Kemmel and the Flemish plains. We end the day with Belgian fries and Belgian beer in the beautiful village of Kemmel. In the village of Kemmel the road starts to climb to the Kemmelberg, the infamous cobblestone climb of the cycling classic Gent-Wevelgem. To our surprise, the cobbles soon make room for comfortable asphalt. 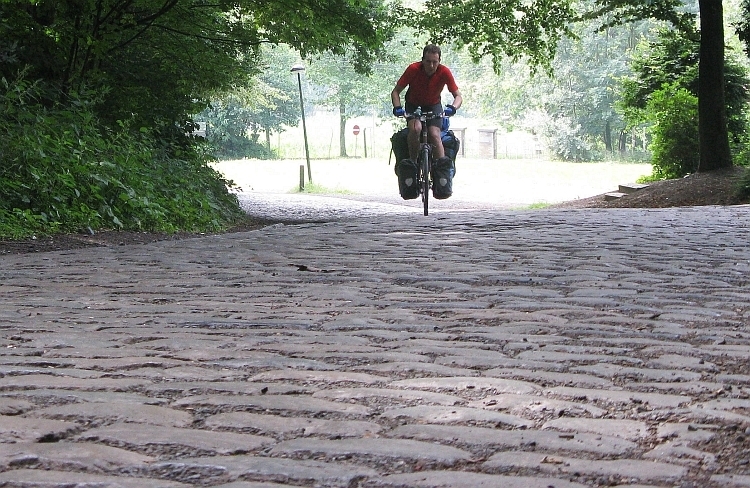 Only the last few hundred meters of the climb are composed of cobblestones again. These meters are steep but all in all the climb was easier than expected. The descent is more exciting though. The round stones shine like fresh eels. It must be incredibly slippery when it rains. Fortunately it does not rain. Itt is dry but still we descend slowly. The last part of the descent I do not have to brake and I let the bike run. After the exciting bouncy descent, we climb against the Rode Berg - the Red Mountain - and the Zwarteberg - The Black Mountain - and sooner than expected we have crossed the Flemish hills and we descend into France. The far north of France is not exactly a tourist trap and certainly not an economic hot spot either. Most villages are completely deserted. No sign of life. The supreme silence is not the only characteristic today. It is hot and humid. The sky is heavily overcast but the sun appears through the clouds whatsoever. It is so moist that even at low effort, sweat production is working at full speed. Nice for lovers of saunas maybe but not exactly my cup of tea. In a sauna at least there is a bathtub with cold water for the required cooling. There is thunder in the air but surprisingly not even a speck of rain is coming down from the clouds. The weather is not fine, but the thousands of flies that stick in the sweat, makes things really nasty. When we reach the campsite of Vironchaux we are all too happy to conclude the trip for today. The rolling landscape between Vironchaux and Machy is empty and deserted. The dark clouds are rolling over the fields and accentuate the atmosphere of Picardy. I wonder if we will see more people today. Perhaps at the coast. It is as cloudy as yesterday but it is a lot cooler today. 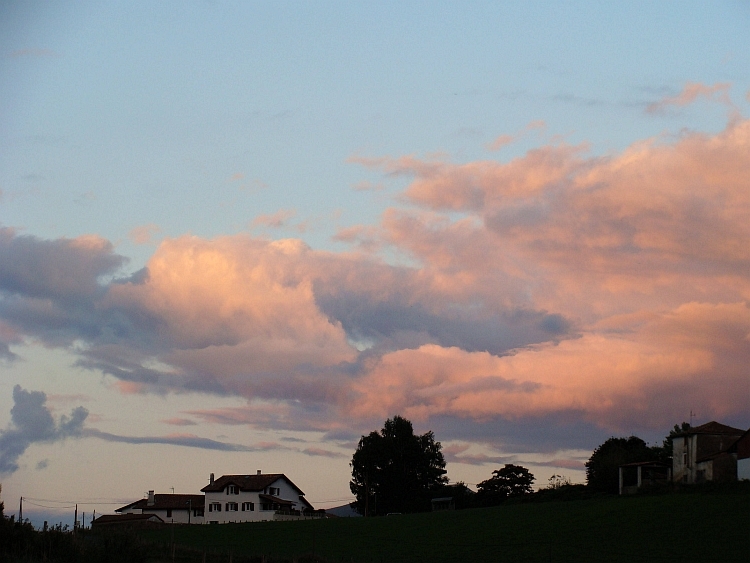 The clouds have have decent colours and shapes, unlike the gray soup of yesterday. All in all I am not unhappy about the change in weather. From Machy we cycle through a vast forest to Nouvion. There is one last ridge we cross before we descend into the delta of the Somme. 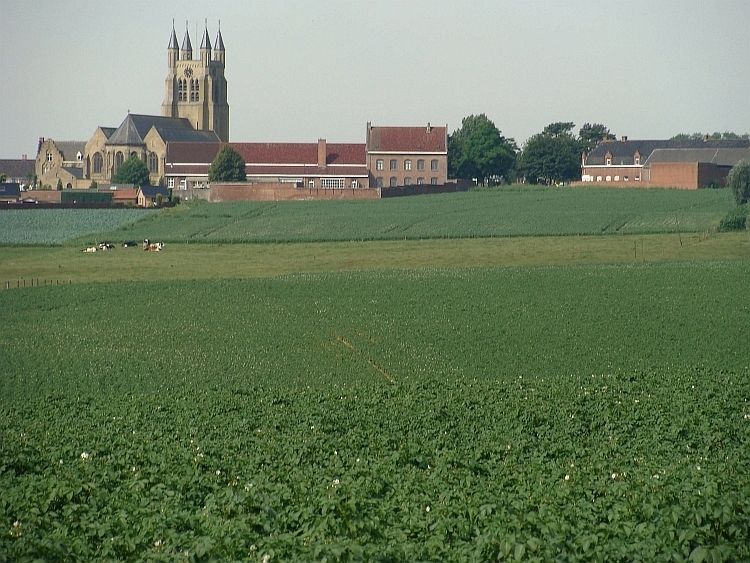 We cross the swampy plains and reach Saint-Valery-sur-Somme, a pleasant town along the mouth of the Somme in the Atlantic Ocean. The medieval walled town lies against a slope, in the lower town is the touristic center with restaurants and bars, directly at the mouth of the Somme, with superb views of the wild dunes on the other side of the mouth. After the coffee break we cycle through a natural area to Le Hourdel at the point where the Somme flows into the sea. From there we ride south to Cayeux sur Mer through a landscape of windswept dunes. The road is largely covered by extensions of the dunes, reason for the authorities to block the road for all motorized traffic. This is an extremely attractive route. Even better still is the gravel road from Cayeux to Ault. The pebbled road runs right along the coast. In the distance the town of Ault is already visible, steeply perched against a hill. 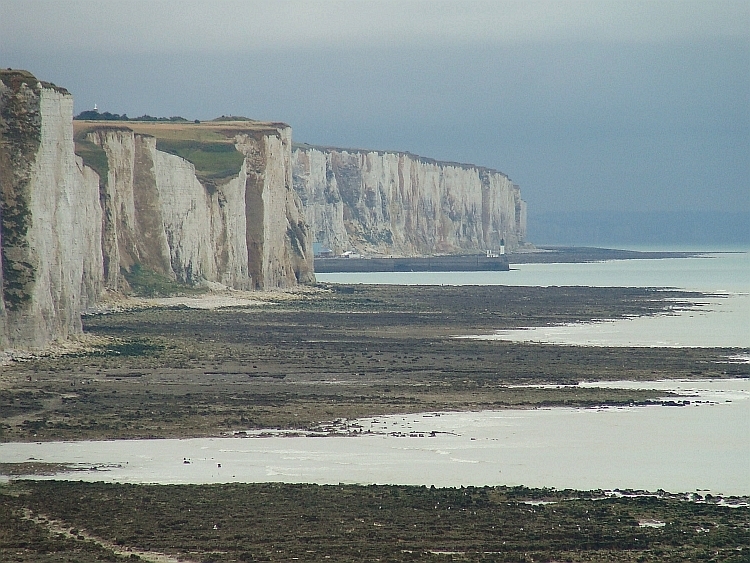 Adjacent are the limestone cliffs of Normandy that are rising a few hundred feet from the sea. Further westward on the horizon, ink black clouds are replacing the gray clouds. We prepare for the worst but the focus is now on the gravel road that is surely not made for cyclists. The wheels slip away, turn over or make unpredictable curves. It is quite a tour de force to simply remain on the bike. Slowly but surely we crawl on whatsoever. The view of the cliffs is getting more and more impressive. The vertical wall is stretching miles and miles away westward, until it is engulfed in the black clouds. 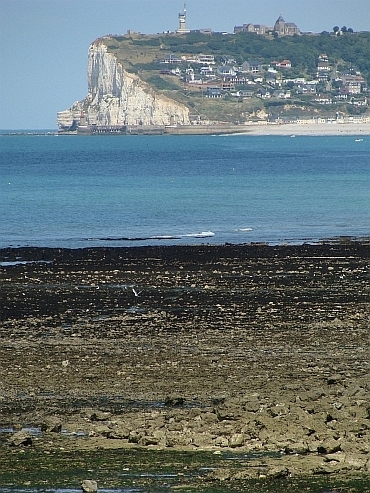 It is only a small distance from Yport to the Étretat, where we want to stay tonight. A steep climb brings us to the plateau. Willems confidence is back. He is not following in my wheel this time, but he is cycling at the head and he is really pushing limits, racing against the headwind. This gives confidence. 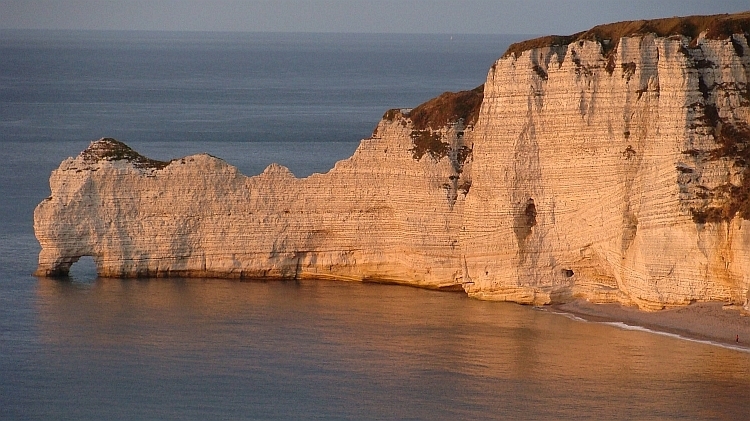 Soon we reach the town of Étretat with the famous Falaise d'Aval and Falaise d'Amont. Falaises are openings in the rock. Erosion by the flowing seawater has worn away the weak parts of the rock wall, leaving these spectacular holes in the rock. 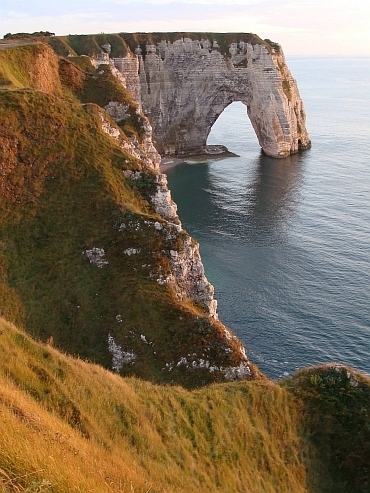 The Falaise d'Aval resembles the trunk of an elephant that hangs in the sea, where the Falaise d'Amont is merely a stone bridge. We pitch our tent in the campsite where we meet Italian cyclist Fabrizio. While we eat, he is walking up the Falaise d'Aval. Although the sun has almost set as we finish dinner, we decide to take a look. A steep footpath is leading up the rock. As there are only few walkers, we decide to try to cycle up the steep trail. Luckily we do not have any luggage, otherwise it would be too steep to cycle here. Still we are fighting against gravity. It is so steep that the bike can fall back any time. Like a rodeo I have to push the bicycle back. In the end even tat proves to be inadequate. Just before I arrive at the top of the hill, the bike comes up and slides backward. Just in time I can get off, preventing a fall on the ground. Willem manages to overcome the passage by standing and extreme forward hanging. At the top, the view is overwhelming. 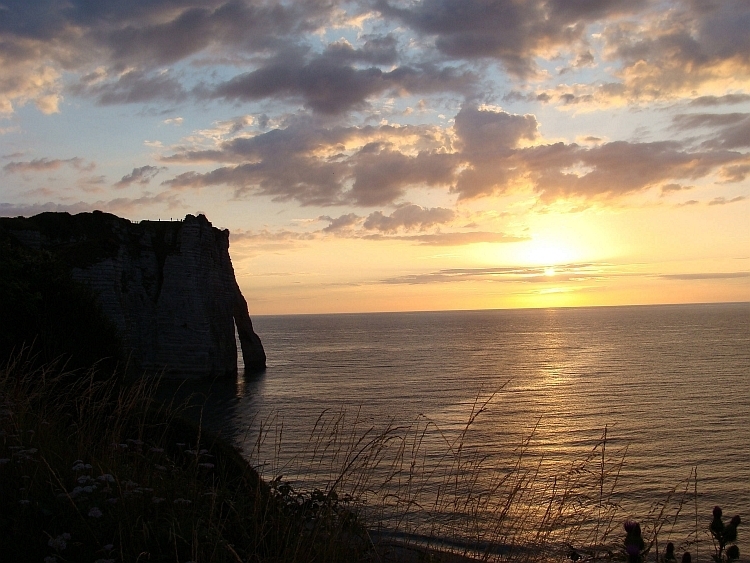 The views over the Falaise d'Aval and the Falaise d'Amont but also to the many other rocks are stunning and the sunset is breathtaking. A beautiful end of a beautiful day. It is raining as we are getting up. In a dry period between two showers, Willem and I pick our bags and we cycle to Étretat for breakfast. We have agreed with Fabrizio in a local pub. Fabrizio reaches the cafe during a storm. While waiting for weather improvement, Fabrizio is telling us about his glacier research in the Mont Blanc area. 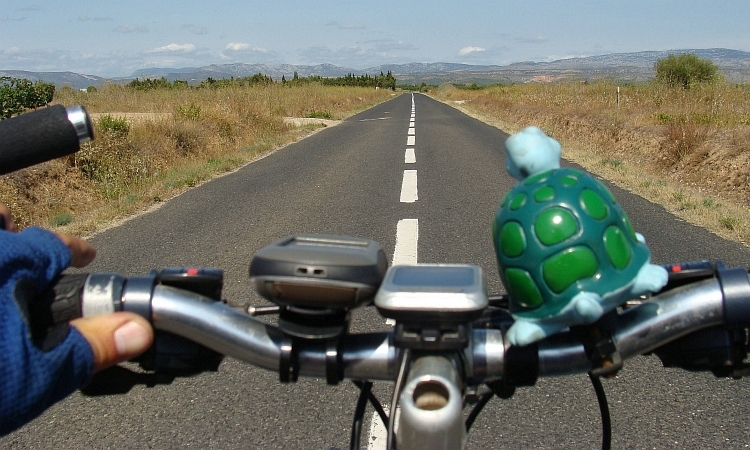 He tells us this is his first but surely not his last cycling trip. 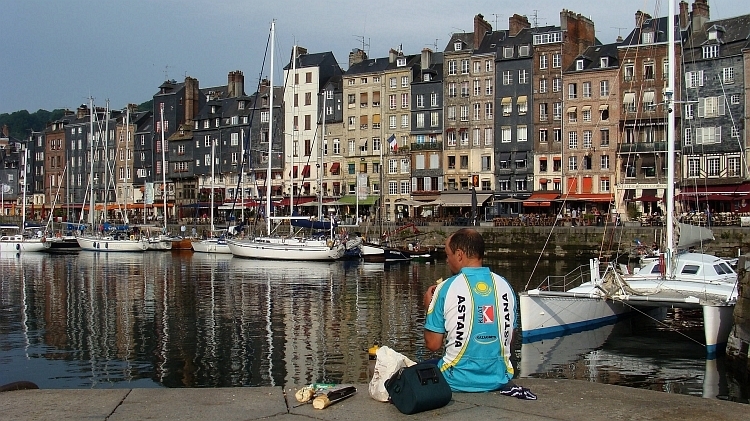 We decide to cycle to Honfleur with the three of us. Fabrizio will travel westward along the coast of Normandy, while Willem and I will continue to move southward, to the Loire valley and Central France and eventually to Spain. 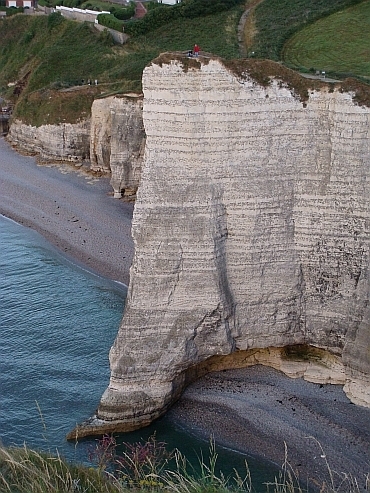 Shortly after leaving Étretat we find ourselves on a steep climb, the first of a series of short climbs. Everywhere around us are showers, but we manage to find a way in between. On the descent into the suburbs of Le Havre we cannot avoid the showers. Furthermore, we get lost in the complex infrastructure between the city and the harbor. On most of the roads cycling is prohibited. Our GPS equipment finally laeds a way out of the maze. Without GPS, we would probably still be looking for a way out. It is still raining heavily when we achieve to reach the port. A huge post-industrial landscape unfolds. A gray world of steel, asphalt and concrete, without people and without animals. We are riding along the Seine now to the Pont de Normande, a huge bridge across the mouth of the Seine which links the north and south banks of the Seine. We zigzag between the large puddles on the road. When trucks take us over, huge amounts of water splash over us. Not too bad, as we are already wet and in a way it fits well into the atmosphere. 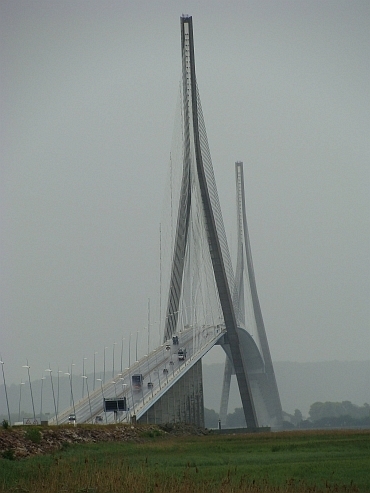 When we finally stand before the Pont de Normande, wehave a good impression of the vast dimensions. I am thinking whether I like the bridge or not with its huge scale and its mathematical rhythm of its giant cables. I must conclude that I find the bridge at least fascinating. Steeply we climb up the 66 meters to the highest point of the road. We look down 66 meters to the mouth of the Seine. Breathtaking. The highest point of the bridge must be much higher still. We descend to Honfleur, a beautiful town with historic and artistic allure.Here we say goodbye to Fabrizio. Willem and I decide to stay here this afternoon; Willems knee will have time to recover. We are eating our breakfast on the dock of the harbor of Honfleur. The yachts sail away while we are eating the last pieces of bread. En route now. We are cycling southward. We finally leave the impressive coast of Normandy. On the first climb my front wheel is rattling as never before. We put a lot of lubricate between the metallic balls but it does not seem to help. We must get back to Honfleur. Unfortunately there is not a bicycle repair shop in Honfleur. We shift to a new plan. We will ride southward and we hope to find a repair shop in Lisieux or Vimoutiers. Again we climb out of Honfleur. The landscape of Southern Notrmandy is hilly. Most of the climbs are not higher than about one hundred meters but still we are climbing all the time. I do not find any rhythm. The rattle of my front wheel is highly arhythmic. At two o'clock we reach Lisieux. Bad timing, as all shops are closed. We do not search for any bicycle mechanics. Instead we move on toward Vimoutiers. When we reach Vimoutiers at half past four, the shops are open. Only, there is not a bicycle shop. After a short break we continue to cycle further southward. Remarkably my front wheel is making less sounds now. After one more hour of cycling my front wheel is completely silent. I do not understand how this is possible but I have to admit that my bike seems to be okay now. At the same time Willems knee has got a setback. Thus one problem is replaced by another. 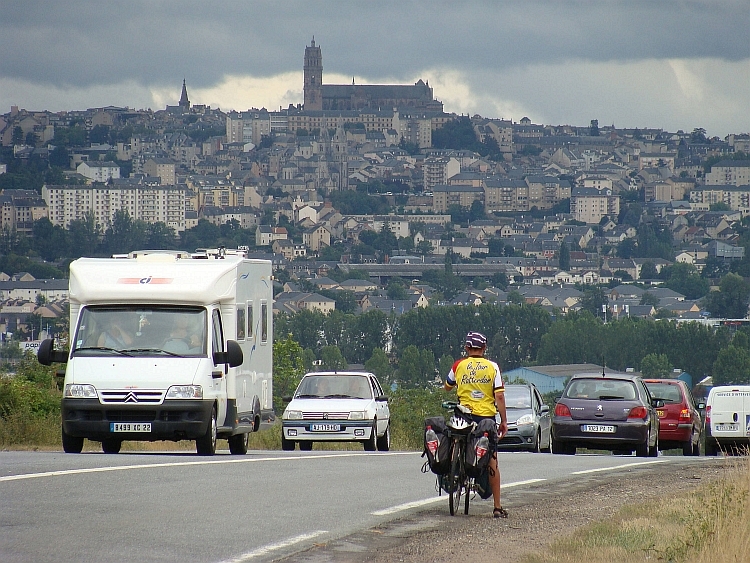 Across increasingly higher hills we are riding in the direction of the town of Sées. From the perched village of Exmes, there are great views over the valley. We climb one last ridge and finally we descend into the valley of the Orne. Willems knee seems to be okay again. 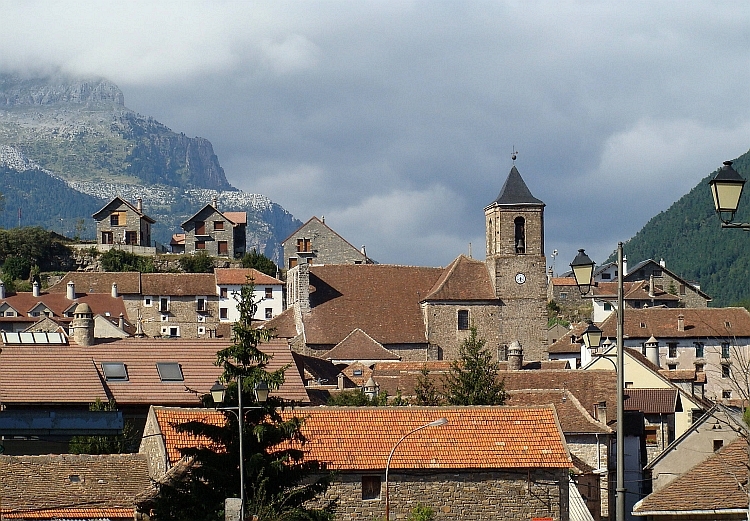 We reach the lovely town of Sées, where we find a campsite. We are greeted by a cheerful man of about sixty years old, who is chatting with everyone on the camping. He is talking with us too. We see that same smiling, old man everywhere we go. At least five times we meet him. After packing our stuff and cycling into town for breakfast and coffee, I am not not surprised anymore as we meet our smiling friend two times, at two different places, in the town of Sés. After breakfast, we climb through the Forêt d'Écouves to the highest point on our trip so far, the 408 meters high Croix Madame. Madame de Croix is partly composed of black rock, a weathered, barren landscape that I would expect in the Massif Central but not here. A steep descent brings us to new hills and valleys and eventually we find ourselves in a landscape of narrow gorges. 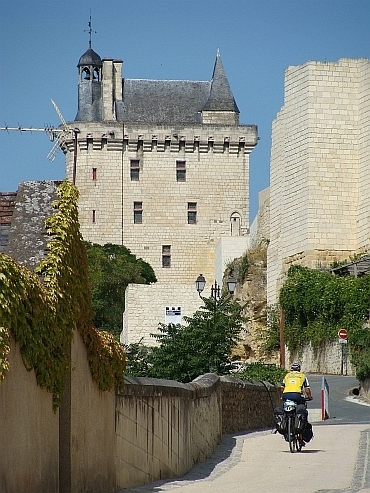 Highlights are the picturesque villages of Saint Céneri le Gérei and Saint Léonard des Bois. All in all, we keep on climbing and descending until we reach the small town of Sille le Guillaume. From here on the way is easier and we have the wind in the back. We have a true mountain stage behind when we reach the camping of Malicorne sur Sarthe after 118 km. I have had no problems with my bike today and Willem did not have any problems with his knee. Reason enough to celebrate at a restaurant. The rest of the evening we enjoy the pleasures of French cuisine. Today we want to cycle to the Loire. We want to experience why the Loire Valley attracts so many visitors every year. First we have to overcome fifty kilometres of relatively flat terrain. We both do not have a winning spirit today. The flat landscape is not too impressive. As both Willem and I love mountains, we both are not excited by the flat areas around us. When we finally reach the Loire, it is time for a lunch break. We are having a picnic on the riverside. After lunch Willems inspiration has dropped below zero. Complete boredom. We cycle eastward on the dyke. After an hour we have great views to the town and the castle of Saumur on the other side of the Loire. The spectacular views do not provide new energy stimulus to Willem. Time to stop the ride for today and find a camping. At Montsoreau we pitch our tent. I make a short roundtrip to Fontevraud sur l'Abbaye with its huge abbey and to the beautiful Saint Jacques pilgrimage town of Candes Saint Martin. In the evening we visit the cave dwellings of Montsoreau, with beautiful views of the castle that dominates the skyline of the village. 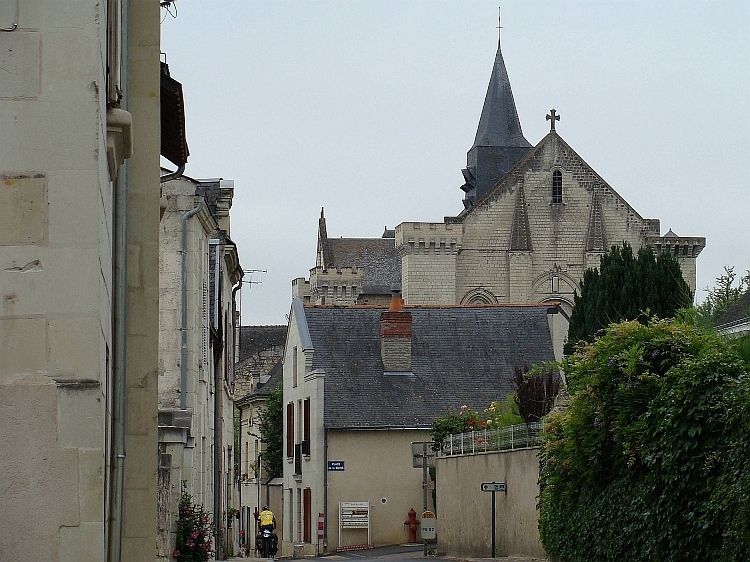 From Montsoreau we cycle along the Loire to neighboring village Candes St Martin. From there we follow the valley of the Vienne to Chinon Saint Jacques. 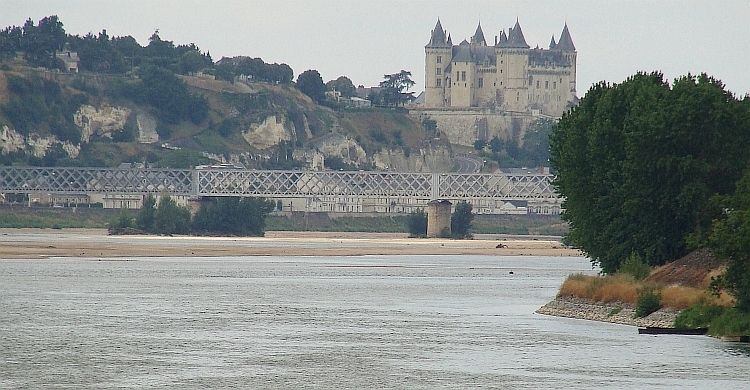 The Vienne is one of the major tributaries of the Loire. 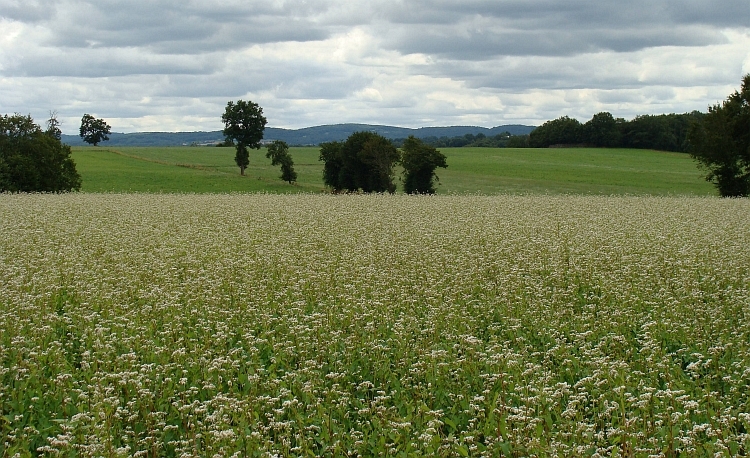 Grass and flower fields are interspersed with wooded areas. It is a beautiful day with the mists that still surround the bushes. When we reach the town of Chinon Saint Jacques, the fog is dissolved and the sun shines over the land. We have a nice view over the Vienne and the town of Chinon afoot of the hill ridge. Atop the hill is one of the great castles of the Loire region. A few moments later we find ourselves cycling against that same hill, towards the castle. Upstairs there are commanding views of the city down below. We are riding northward now, back to the Loire. As we reach the Loire Valley, we are heading east, more or less following the course of the river. We pass the castles of Ussé and Azay le Rideau. There are many other great castles and beautiful villages, but we will not visit them all. It is flat and easy cycling here through beautiful landscapes. All in all, today is much finer than yesterday, whatever may be the cause. After Azay le Rideau we continue for an hour until we reach the village and the camping of Catherine de Fierbois. Here we visit a colleague of mine with her husband and baby. We have breakfast together. I take some pictures of the little boy. Then it is time to go and we continue our dwellings through the heartland of France. We are passing through South Touraine, a vast and desolate area with croplands. 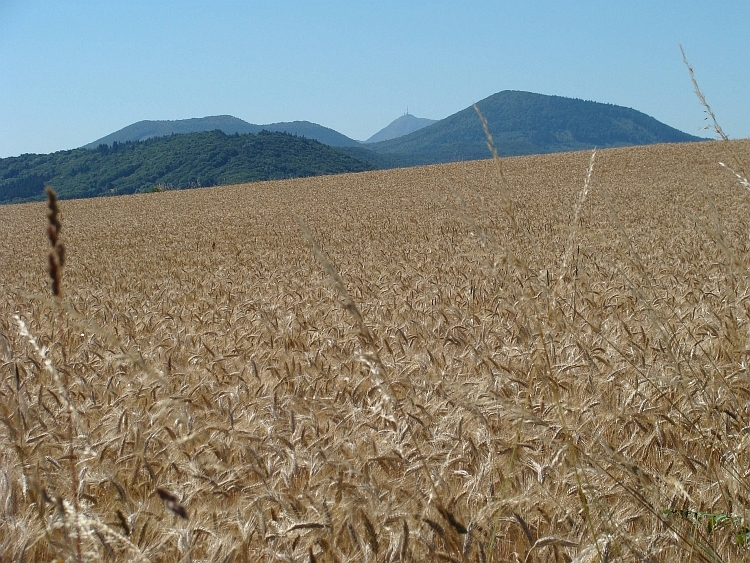 According to Willem the landscape is very similar to the Hungarian Puszta. 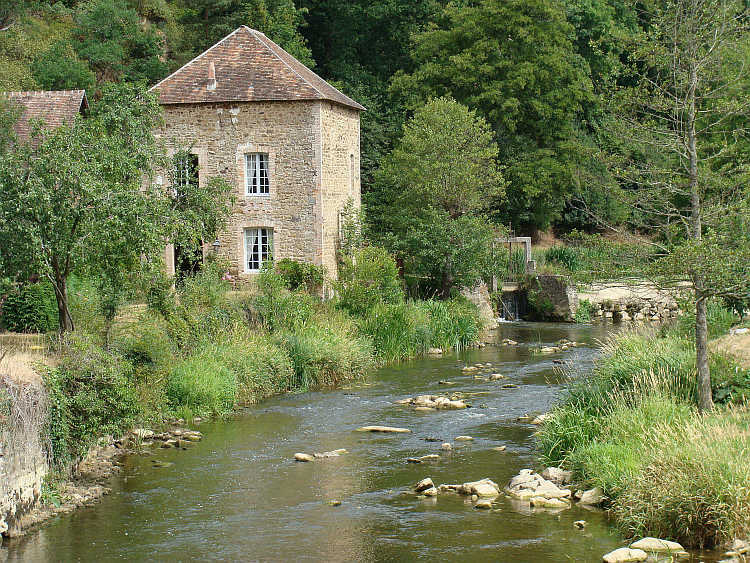 In Ligueil we return to civilization and a place with the possibility of a coffee break. Time for a short break. After Ligueil we cycle back into the emptiness. We are passing one deserted village after another. The villages are small and intermediate distances are large for European standards. And at the infrequent times when we do reach a village, there is no soul to be seen. Or it must be the half wild dogs, that are roaming the space in search of food. A superlative stage of desolation can be found in the Parc Naturel de Brenne, a large, flat, lake and swamp area with straight and endless roads. No cars, no people, only forests and lakes. Unfortunately the lakes are usually excluded from vision because the trees are obstructing any possibility of a good view. In forty kilometre we pass only two villages. One of them is a ghost town without any sign of people. When we have finally traversed the natural park, our water supplies are nearly finished. We had expected at least some kind of facilities but that proved to be a miscalculation. We reach the valley of the Creuse and so civilization too. We stay overnight at the campsite of Argenton sur Creuse. Today we finally reach serious hills. 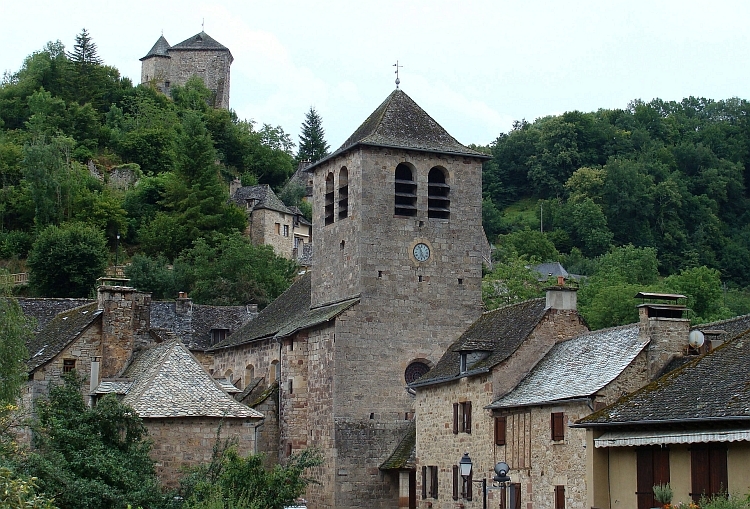 We cycle across Saint Marcel to the beautiful village of Gargilesse Dampierre that is perched against a steep hill. There are beautiful views across the Creuse Valley. Almost two hundred meters below us the river is flowing through the narrow valley. The more we continue upstream along the river, the narrower and rockier the river gets. The hills become increasingly high too. The hills are four hundred to five hundred meters high, and we can see higher hills further southeast. Ans that is the direction that we are going. We do not seem to make any progression, as the narrow road is winding in all directions. Uphill, downhill, high and low and in between, unless we follow the course of the Creuse. Beyond Fresselines we leave the Creuse River and we climb continuously through dense woods to a long hill ridge. The hushed atmosphere of the landscape is further enhanced by the gray weather conditions. It is the second day in a row that we cycle through a landscape that is virtually abandoned by people. As the deserted areas of Northern France and the very silent areas of southern Normandy comes to my mind, it conjures up the image of France as a country which has withdrawn in a few blooming regions and major cities. The remainder of France increasingly seems to consist of exodus regions where the last inhabitants are having difficulty to sustain any facilities. Many villages are inhabited by old people only. What will happen if those old people are gone too? The logical answer is that the number of ghost villages will probably rise at a frightening pace. The land with a bakery in each little village, that country does not exist any more. Despite these musings, the scenery is really attractive and we have a very nice bike day behind us as we reach Boussac. We spend the night on a - surprisingly - busy camping on a hill near Poinsouze. The weather is bright and sunny. 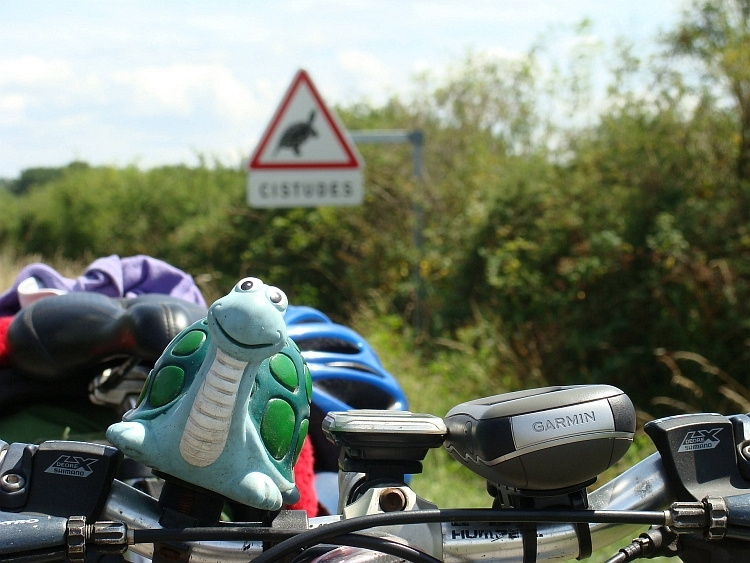 We are cycling southeastward, in the direction of the volcanoes of the Auvergne. 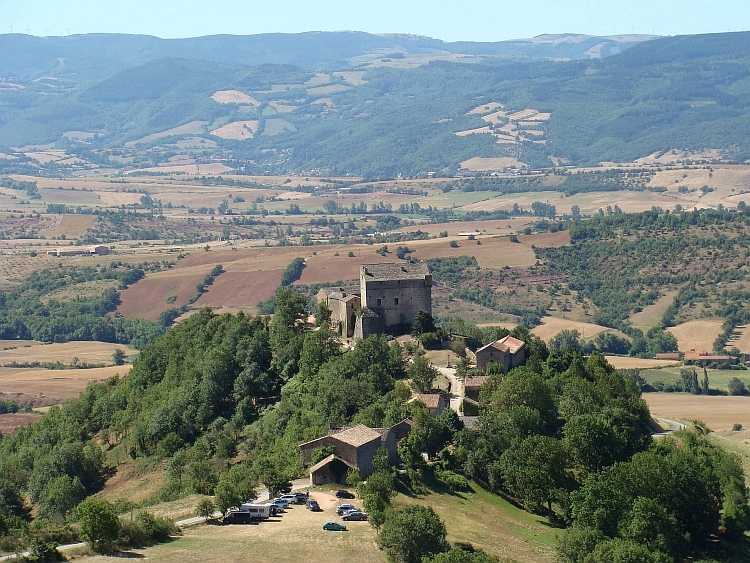 Our aim is to climb the Puy de Dôme, the most famous and challenging climb of the Massif Central. As we check the opening hours of the clim in the tourist office, it is said that the way to the volcano has been closed for work on a tourist train that will lead to the summit. Too bad that we did not hear this earlier. Nothing to do about it. We decide to cycle towards the volcanic area whatsoever, there are other great ride possibilities. But there are other beautiful trails that are much closer also. The climb to the more than six hundred meters high Toulx Sainte Croix rewards us with magnificent views to the volcano area, almost one hundred kilometres away. The church is simple but beautiful. 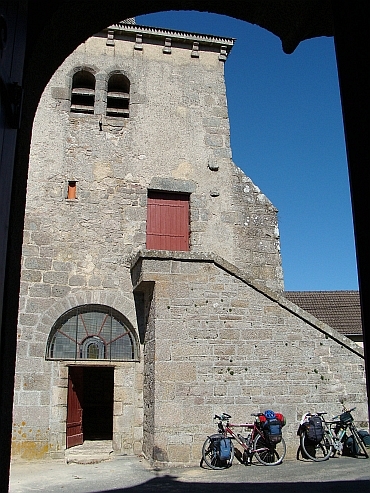 In Sainte Toulx Croix we meet an Australian couple that has cycled to Santiago de Compostela and that is touring in France right now. The Australians are passionately telling about their adventures. They are very enthusiastic about cycling in Europe. After Toulx we have a long descent, followed by a vicious climb to Évaux les Bains. We continue through ever higher hills. The climbs are getting longer. The day concludes with a long descent to the valley of Sioule. 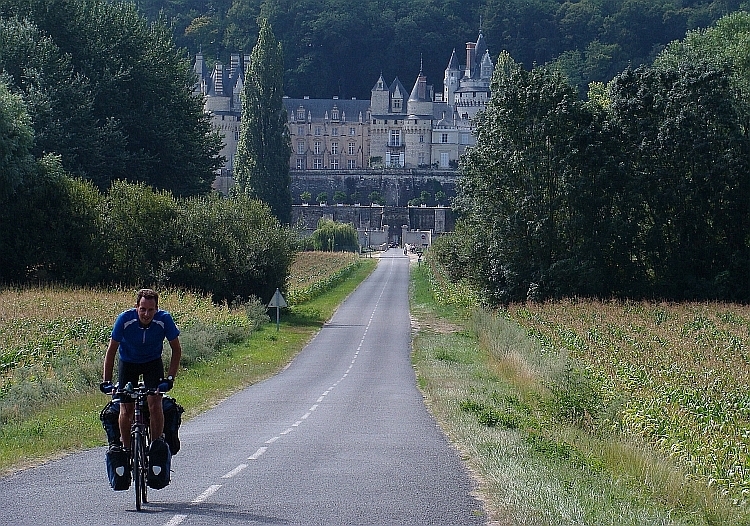 We cycle to Châteauneuf les Bains through ultra green gorges that cut through the volcanic rocks. The camping in Châteauneuf les Bains is our finish today. Tomorrow we will enter the first real mountains as we will enter the heart of the Auvergne region, the land of the high volcanoes. It is a glorious day. We are cycling on n a gradually ascending road to the village of Manzat. Here we choose a ateep, narrow road to a plateau of around 1,000 meters altitude. A whole range of volcanoes rises up from the plains, a beautiful sight. The Puy de Dôme is obviously the most impressive summit. It reaches 1,465 meters altitude, but the mountain is more impressive than statistics can express. I am sorry that it is not possible to cycle up the classic route because of the construction of the railroad. Nearly equally good is the way that we are cycling now to the west side of the row of volcanoes. 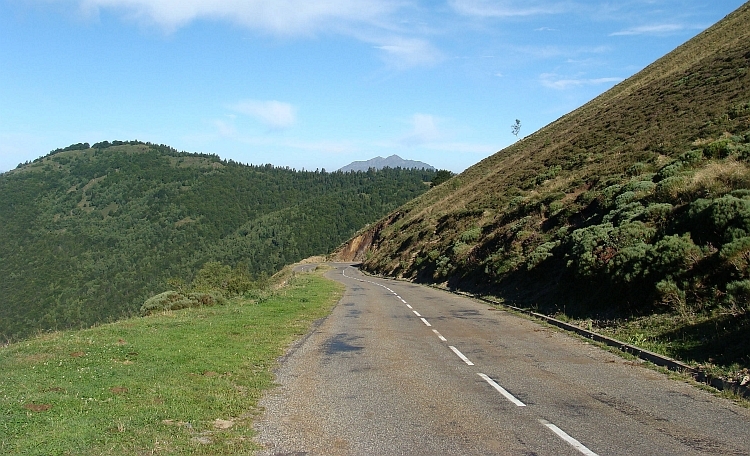 This route also offers the opportunity to have a go on a dust surface road along the summit of a minor volcano, the Puy de Chopine. 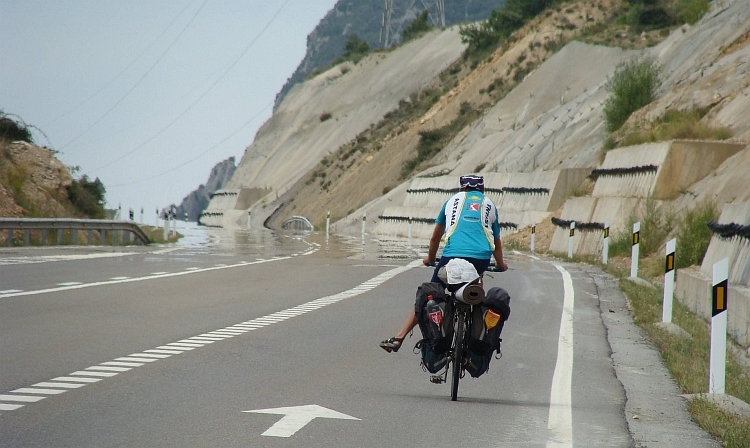 The final stretch to the pass is almost impossible on a fully loaded bicycle. A gully has cut deeply into the road and there are huge stones in the trench. In addition, the road is half overgrown. I have got the feeling that I am cycling up a dry riverbed instead of a proper road. We reach the pass. A side road is leading from the pass to the nearby peak. The road consists of fist-sized stones and is also very steep. With a frenzied effort we are successful in bridging the first fifty meters. There we find a tree lying on the road and blocking it completely. A sign for us to go back. it is not possible to get any further here. We descend on the other side of the pass and soon we are back on familiar asphalt. However mountainous the environment is, the trail along the volcano is relatively flat. Without much effort we reach Orcival. From the medieval village we find a small winding road that we prefer above the main road. We pay with loads of sweat for that decision; the climb is very steep and highly irregular. It takes effort to stay on the bike. It is all not to Willems taste. We achieve to reach the pass nevertheless and so we are standing at 1266 meters elevation, the highest point so far on this trip. 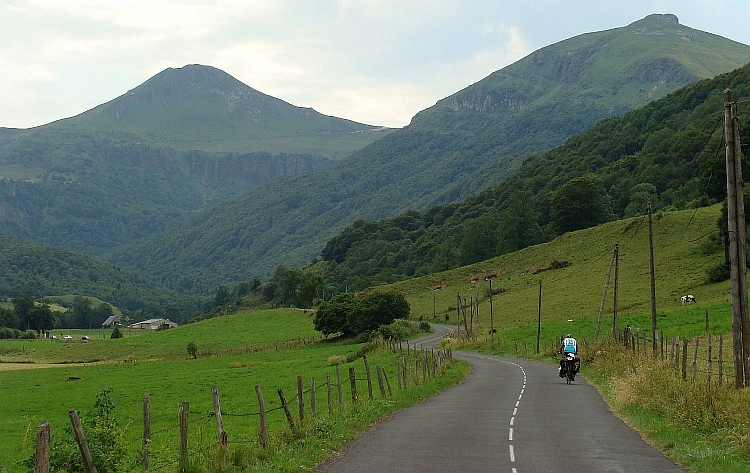 Before us lies the Puy de Sancy, with 1885 meters the highest mountain in the Massif Central. 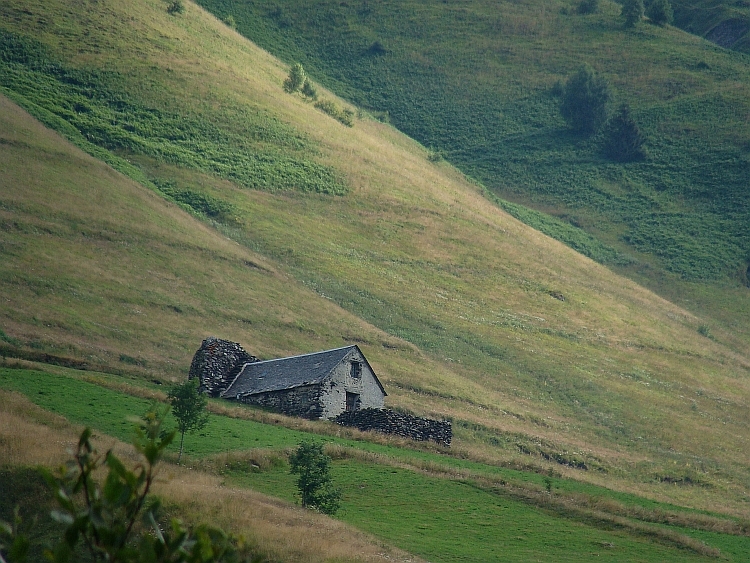 Unlike the forested slopes of the Puy de Dôme, the Puy de Sancy consists largely of grass pastures. 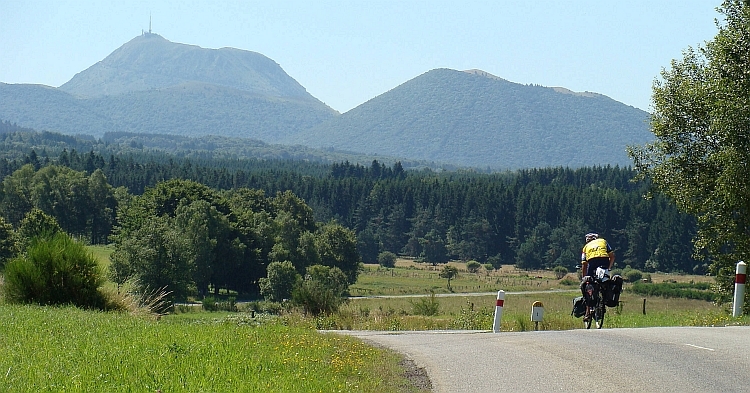 Where the Puy de Dôme has got a conical shape, the Puy de Sancy looks much more like a normal mountain range. All in all, it is a scenically highly rewarding day. We descend to Le Mont Dore. A final climb brings us back above 1,200 meter altitude. 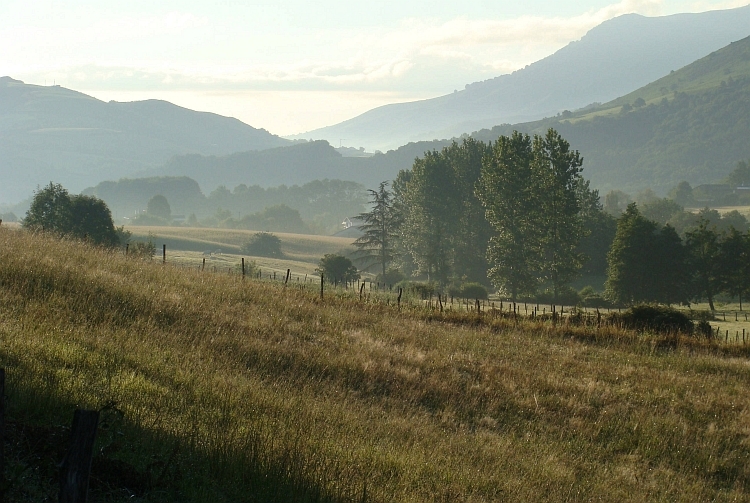 We have stunning views across the hills of the Cantal, to the towering volcano complex of the Puy Mary, fifty kilometres further south and bathing in low sunlight now. The Puy Mary area we save for tomorrow. Today we only have to descend to Le Tour d'Auvergne. Because of the very bad weather that is predicted for this afternoon, we want to leave very early. Get up, brushing teeth, breaking up, packing up. At 7:30 AM we are cycling towrds Le tour d'Auvergne for breakfast. In the boulangerie we manage to arrange bread and after having breakfast in the village we are on the way to the Puy Mary, the big volcano of the Cantal department that towers above the surrounding landscape. We do not know exactly when the bad weather will reach the Cantal, the messages mention 'in the course of the afternoon'. At this moment the skies are blue. Except something that resembles clouds very far in the distance, barely perceptible. A beautiful, winding road is leading us through several farming villages to Condat. The area between the Puy de Sancy and the Puy Mary is a bit lower than the two volcanic massifs but it is hilly terrain still. We progress very well and earlier than expected we descend into Condat. Unfortunately the development of the bad weather is also much faster than expected. The almost invisible cloud in the distance from two hours ago, seems to be a line of terrifyingly huge cumulus clouds. The first cloud has just missed us, what has saved us a brisk shower but the following line of showers are already arriving in the distance. This was a warning. 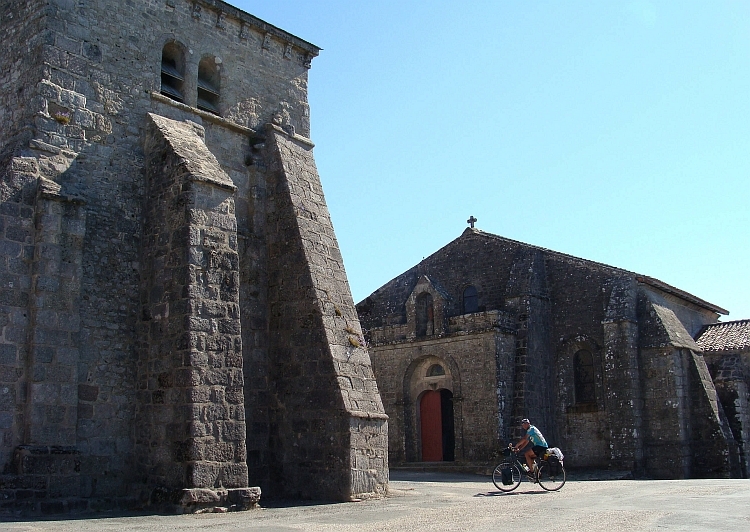 We cycle to the village of Saint Saturnin and further up to a plateau of rough grasslands. 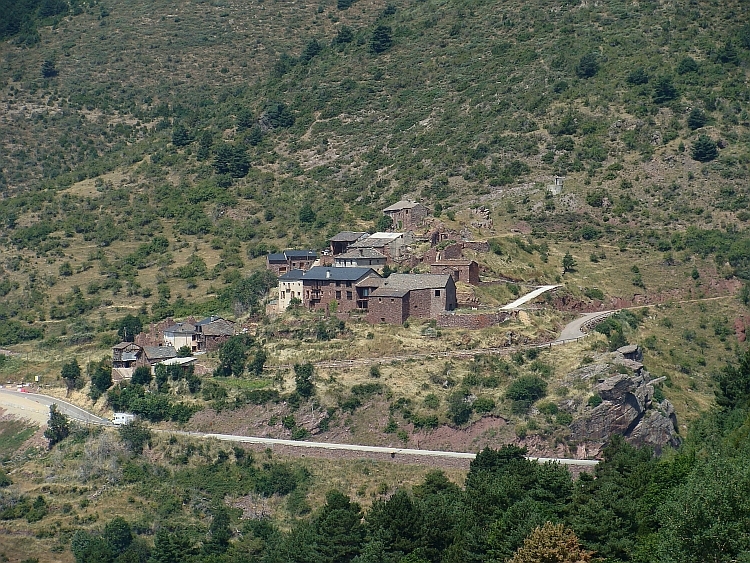 Afther the long ascebt, we have a small descent into the village of Cheylade, where weenter a broad, open valley that is leading straight to the Puy Mary volcano complex. Meanwhile, the second line of cumulus clouds has reached us; it is clear that we will not see the sun anymore. Still it is not raining yet. There are no feelings of relief however as high-speed clouds are chasing over the bare landscape. Finally it starts raining and in the distance we hear the cracking of thunder. 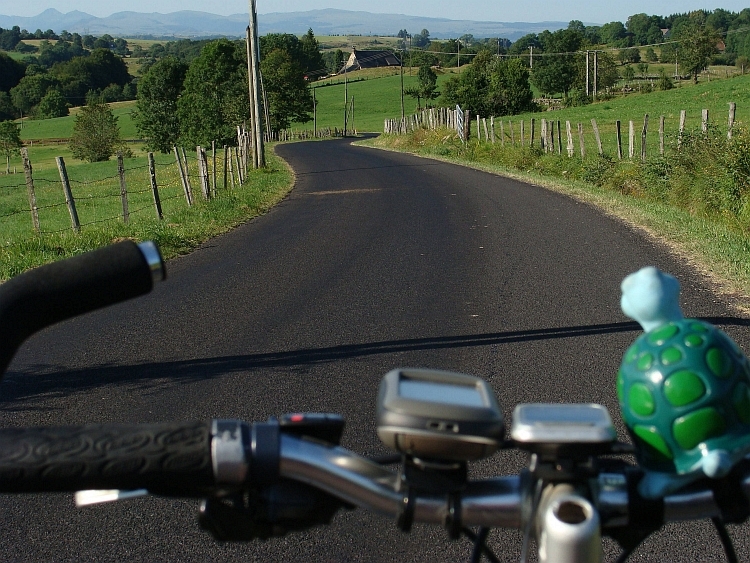 We are heading right off to the Puy Mary, one of the highlights of cycling in France. 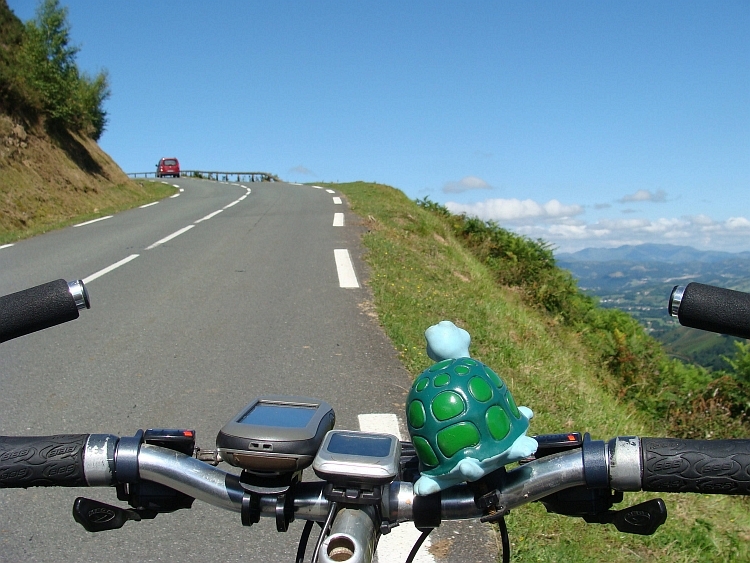 This is the third time that I cycle up the Puy Mary. 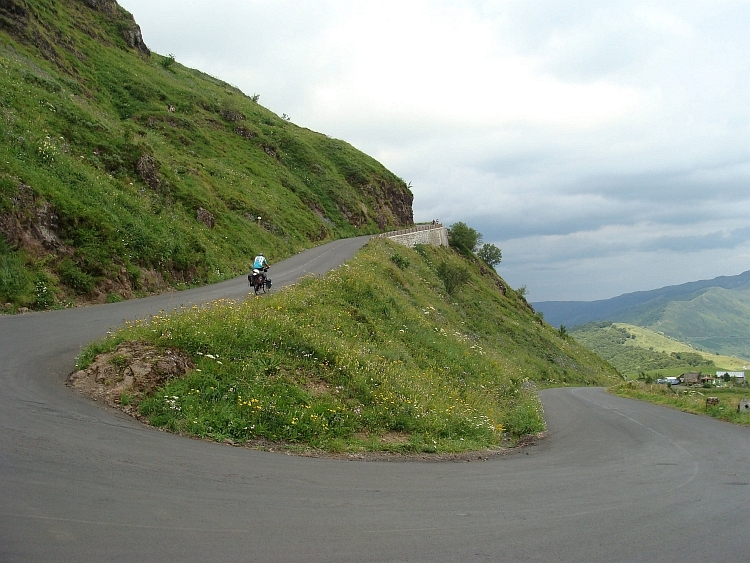 Or rather: the Pas de Peyrolle, the pass near the summit of the Puy Mary. Four different routes reach the pass and all are exceptionally beautiful. And even with bad weather the scenery is stunning. 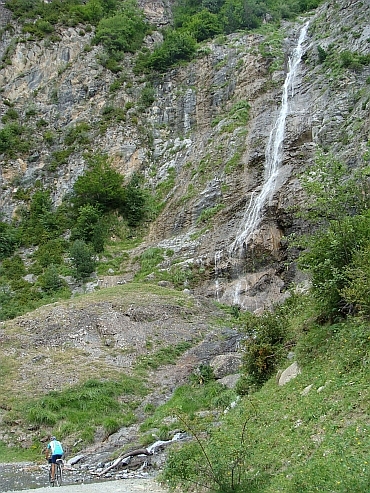 The northern ascent of the Puy Mary is steep. We sre riding uphill at full speed, being chased forward by the ink black clouds that are rolling in from the north and west. We arrive at a crest that is leading to the pass. On the steep ridge we cycle to the final climb. Another two kilometres the road goes up over steep slopes. The views over the approaching cold front are beautuful and frightening. Still the thunder storm has not reached us yet. It has even stopped raining for a while. When we reach the pass, we are tired to death. Maybe we have cycled up a bit too hard. We enjoy the sights while having a short lunch break. And down we go. Before the storm definitely breaks loose. In the village of Mandailles we have a moment of choice: to continue downward to Aurillac over our 2004 route or to climb to the col de Perthus and descend to the village of Vic sur Cère. We have heard some stories about the short but impressively steep climb to the Col de Perthus and so our sense of adventure wins over rational thought. We make the choice of the route over theCol de Perthus. The climb proves to be steep indeed, but it is going well. The light is unique. Or rather the lack of light is unique. It seems like there is a solar eclipse. I am cycling up in my lowest gear, lightly dancing on the pedals. Then a deep thunderous strike of lightning sets the skies ablaze for a moment, followed immediately by a new sledgehammer blowccompanied by a brutally loud roaring. A short moment of silence. Suddenly the sky breaks open and ice cold water is clattering down. A complete darkness surrounds us as a dense curtain of falling rain is effectively reducing sight to 10 to 20 meters. It is intensely dark now. The continuous lightning strikes create a continuous growl that is resonating and reflecting itself all the time, swelling and sinking between the mountains. The water is gathering into rivers that flush over the road. As we reach the pass, a nice woman gives us shelter in her car until the storm passes away. After one and a half hour the storm seems to be subsiding a little bit at last. It is still raining hard as we descend to to Vic sur Cère. In the descent my wheel once again begins to rattle. We have to solve that tomorrow. Now we have to go down first. Finally we reach Vic sur Cère, where we find a small hotel where we can let our stuff dry a bit. That appears to be quite necessary. Also waterproof bags can get wet inside. There is an early morning thunderstorm during breakfast. The bad weather surely is not over yet. Therefore we have plenty of time to mess around with our bikes. I try to solve my rattling front wheel but I do have not have a clue about what is going on, maybe the front wheel is simply worn out. If the thunderstorm stops after an hour, we go. The hard work on my bike appears to have limited to none effect. The front wheel is still producing as much noise as before. I am far from happy about it and the continuously heavy rain does little to enhance the spirit. We deciside to ride to the campsite of Rodez today, which allows us to consult a mechanic this afternoon or tomorrow morning. First we climb to the Col de Curebourse. At the pass is a cafe, where we as shelter. After an hour we dive into the rain again. My despirited day is continuing, even after it gets dry in the afternoon. Only when we begin the long descent to the valley of the Truyère, I get back the pleasure I use to have when on bicycle tour. 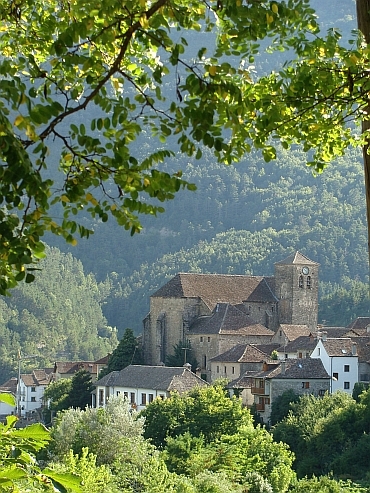 We reach the beautiful village of Entraygues that lies trapped between steep valley walls. 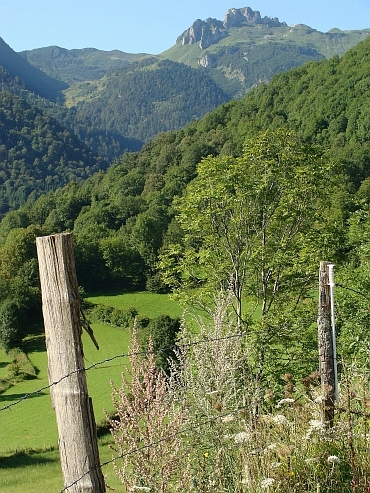 The climb out of the valley of the Truyère is not steep at all but therefore very long. We reach the plateau landscape that is quite nice. It is getting really interesting however, as we have crossed the plateau and descend into the village of Villecomtal, with its quirky houses of crimson stones. The village of Murat Le Château is yet another strangely beautiful village. A final climb brings us to a new plateau, the Causse de Comtal. We also cross this plateau and we descend into the suburbs of Rodez. The city of Rodez itself lies spectacularly on top of a hill like a throne above the surrounding landscape, similar to Toledo in Central Spain. We cycle to the campground that lies directly under the city. After we have pitched the tent, we walk to the town across a steep and narrow footpath. It is monday now and the city seems to be completely deserted. There is not a single human being in sight. It looks like a nuclear disaster has occurred. 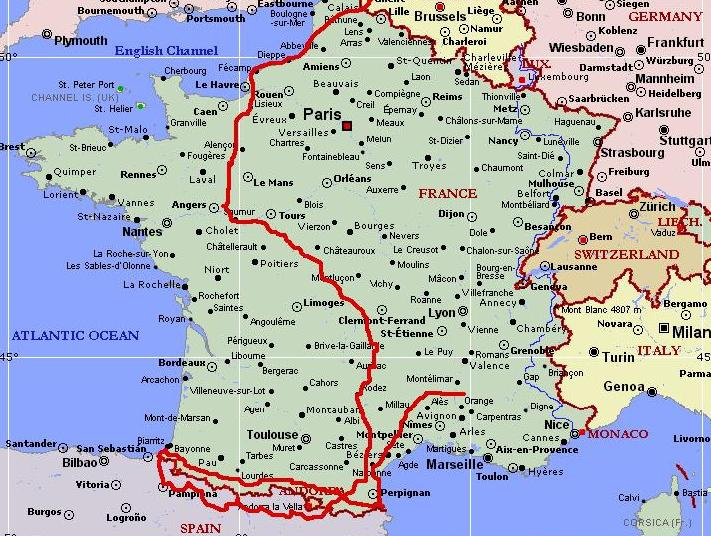 I wonder where the French population could be. In the countryside we do not see any people, the villages are almost or completely devoid but also in a city like Rodez we do not see any people. The Lonely Cyclists name is more apt than intended. We cycle up the steep road to Rodez, which we descended yesterday. We stop at a bicycle repair shop that we found yesterday. A bicycle mechanic takes my front wheel. Worn out completely, is his conclusion. Actually I knew it. He shows me some new wheels but they are all wheels for racing bikes. The man states that te wheels are strong enough for fully loaded bicycles but I do not feel good about it. Surely the wheels are expensive. Meanwhile the repairman lubricates the wheel. I decide to buy a wheel and we continue again. Oddly my front wheel does not rattle anymore. My wheel does not run smoothly, but the rattle is over. We will not visit ant bicycle mechanics any more. The cycling trip is not too spectacular today. We climb to a new plateau and cycle around two large lakes, the Lac du pont de Salars and the Lac de Pareloup. We climb to a pass of just over one thousand meters elevation. The descent brings the first fireworks of the day. The river Tarn lies hundreds of meters below us and behind it lies a wonderfully panoramic landscape. Vast stretches of highland, sometimes with new mountain ranges or new blocks of highland atop, are interspersed by deep canyons. 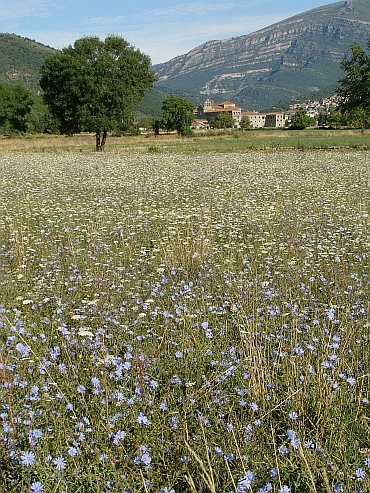 The valley of the Tarn is the largest and deepest of the valleys. The focal point of the panorama is the Millau Viaduct that bridges the whole valley of the Tarn. The bridge is 2,460 meters long and rests on nine gigantic pillars that rise hundreds of meters above the Tarn. We see the bridge from a distance, making the huge bridge only one of the major elements of the grand landscape. In that sense, the bridge fits well into the landscape. The descent is long and is constatly proving new vistas. Eventually we reach the bottom of the valley. It is here that the river Tarn is flowing. We cross the river and reach the village of Saint Rome de Tarn. We find a camping here. The rest of the afternoon, we do nothing. Tomorrow there will be a lot of climbing. From Saint Rome de Tarn we climb through a narrow valley, over a small road, in the direction of Saint Affrique. 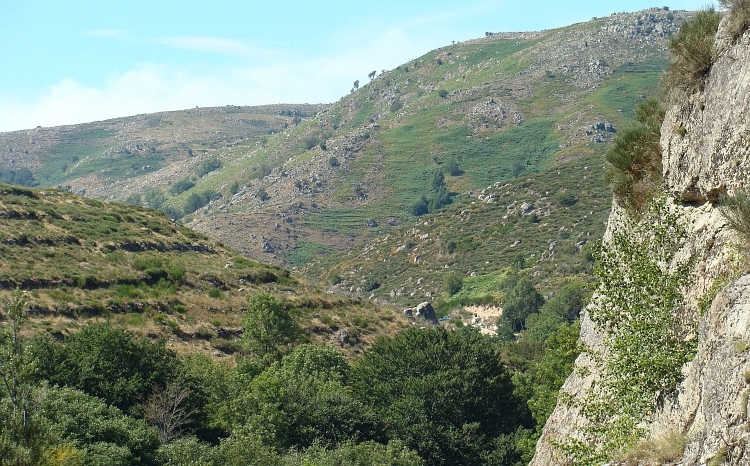 The tough climb brings us on a small plateau with beautiful vistas over the giant blocks of bare stone of the Causses. We cross the small plateau and go down. A nice descent brings us in Saint Affrique. We drink coffee in a bar that is run by a man with the looks of a Napolitano opera singer: big, well-fed, big moustache, tailor made suit, an expressive and extravert exposure and like a dot of cream on the sorbet a classic Mafia hat that suits people like Al Pacino and Robert de Niro so well. Luckily no Mafia revenge acts take place here. 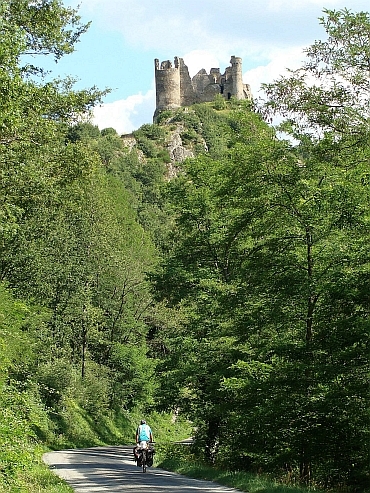 We sre cycling on a small, weathered, but above all steep road to the castle of Montaigut. The steep climb is a delight, it is true fun to do this. If we reach the top after losing much sweat, the real drama is only just beginning. 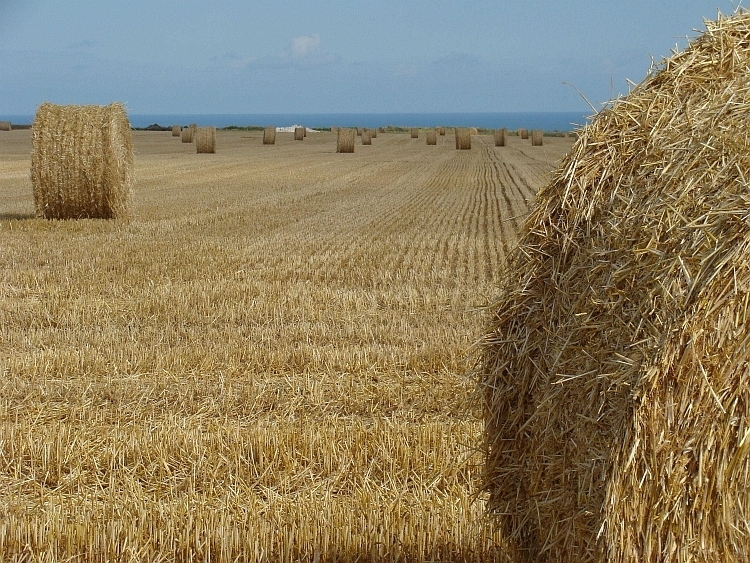 Before us lies a landscape like a patchwork of yellow, orange and brown ocher fields. We descend into the colorfully painted landscape. On the fly we pass the castle of Montaigut, that lies atop a hill high above the valley below. Once down in the patchwork landscape there is an extremely heavy wind, a wind in the back this time. We climb to a small pass but the climb is barely perceptible as we are just being blown up the mountain. After the descent to Brusque we enter a more sheltered valley. 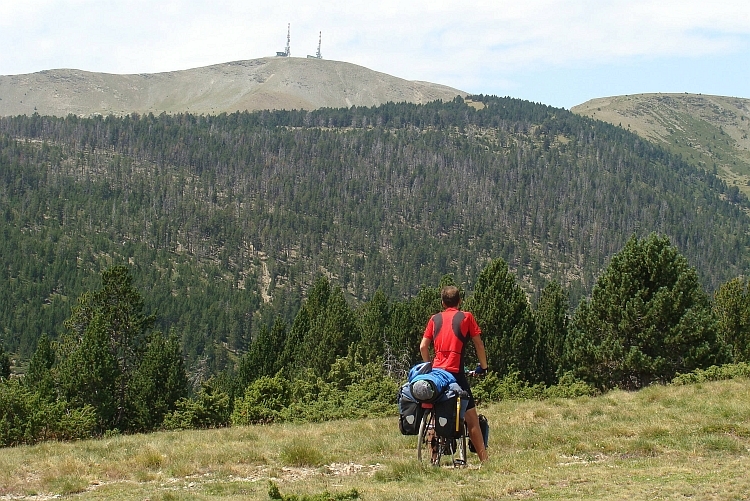 A new, very long climb brings us to the highest peaks of the Monts de l'Espinouse. We are now at 1,100 meters altitude. 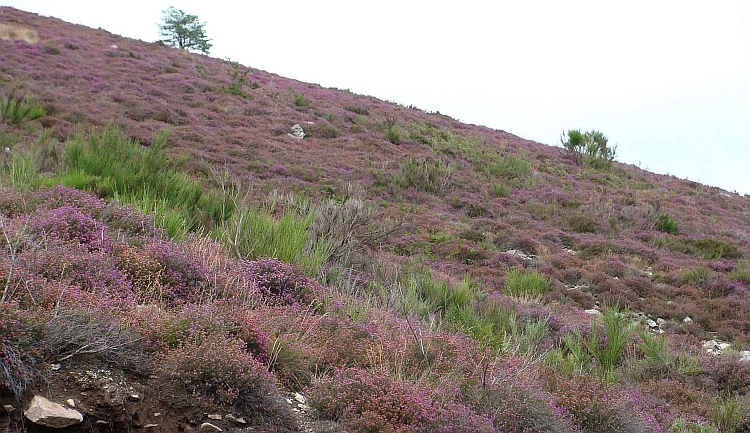 On the top of the hills the heather blooms exuberantly. All is purple. The descent is a long one. We descend one thousand meters into a vast green sea of forest. Eventually we reach Lamalou Les Bains where we find a place on the camping. We are on our way to Bizanet, near Narbonne. We have agreed with friends that we will stay there today and tomorrow. Our opponent today is the wind, which increases in intensity by the minute. Besides the wind, conditions are not difficult. The landscape is almost flat. The storm rages across the land. It is hard to just stay on the bike and we move incredibly slow. Fortunately we donot have headwind all the time. The periods with tailwind, we simply fly over the asphalt. Most of the day, however, we are fighting our way to move on. The last kilometres the wind is in the back. We are being overtaken by a car and a window is opening. Our friends. We are being led to the camping. We are pleased that the ordeal has finally ended. Our journey to the South of France has ended as it has begun. With hard wind and flat landscapes. 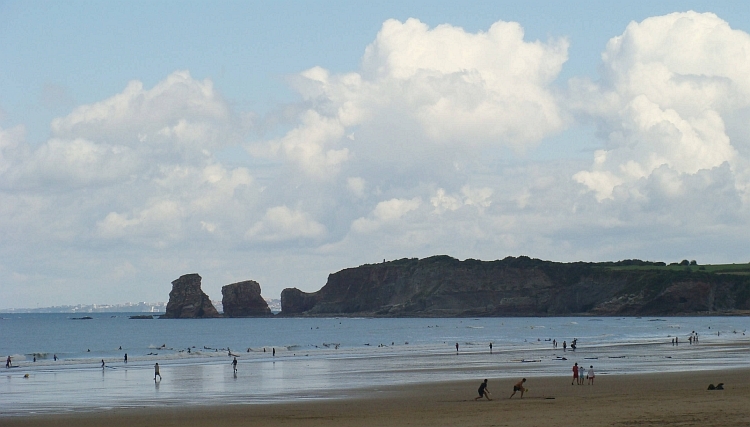 We have seen the cliff coasts of Normandy and the volcanoes of the Cantal. We have seen the splendour of the Mediaevil castles of the Loire Valley but the deserted villages of Central France and French Flandres too. We say goodbye to our friends. Part 1 of the trip is completed and it is time to move on. 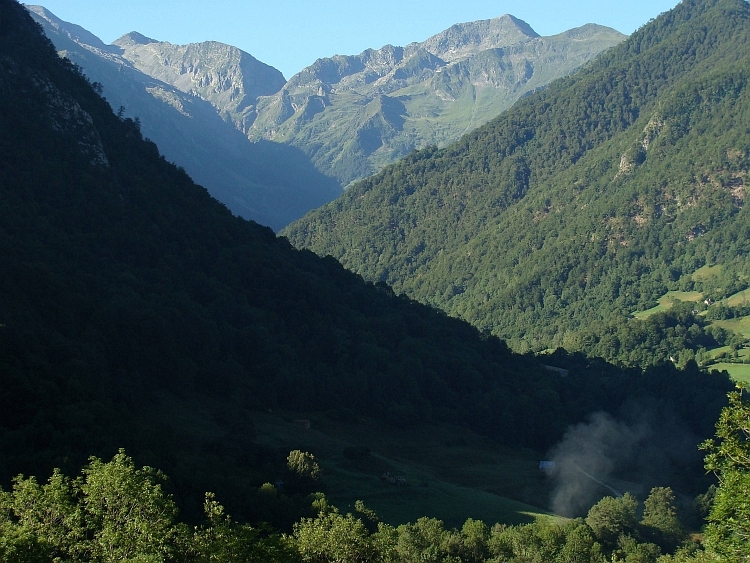 Part 2 of the journey presents itself: the Spanish Pyrenees. 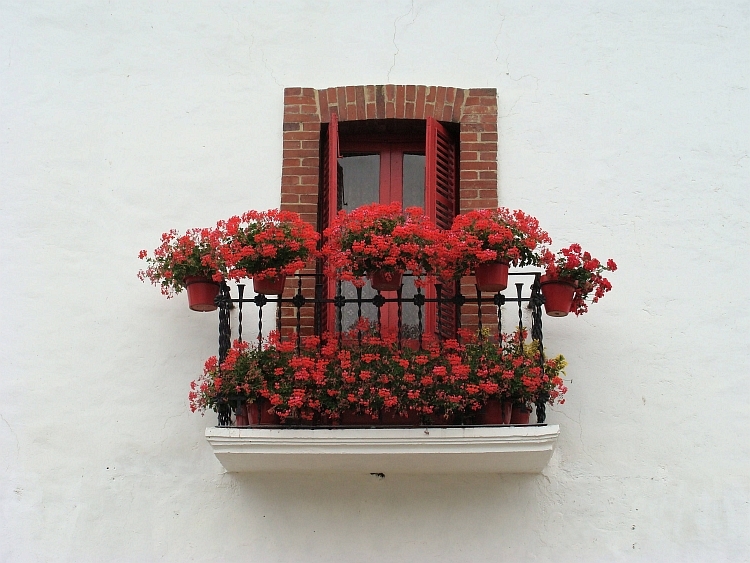 Our intention is a full East to West crossing of the Spanish Pyrenees until the Atlantic coast. The foothills of the Pyrenees are almost tangible. 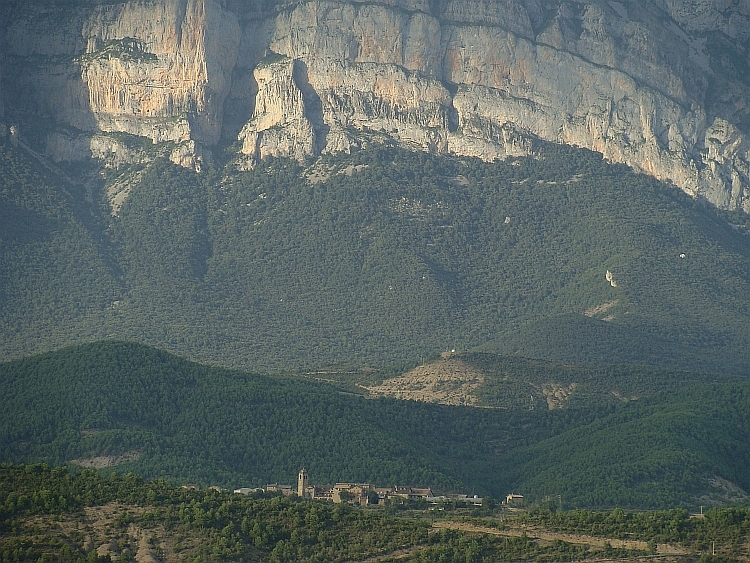 Elongated mountain ranges rise solely above the Mediterranean landscape. 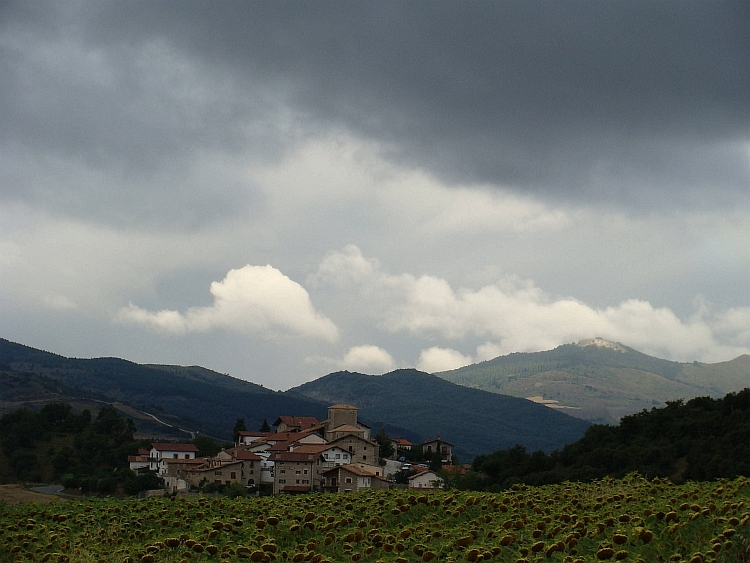 A foreboding spell of the mighty Pyrenean landscapes that await us the coming days. 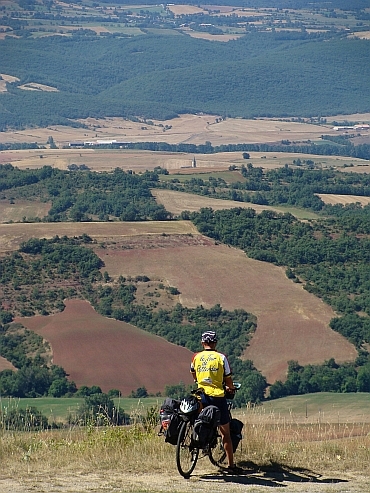 After the Spanish Pyrenees I will ride solo through back to the Mediterranean Sea through the French Pyrenees. A lot of mountains the coming weeks, some of the hardest climbs in Europe, some of the finest climbs in Europe, beautiful authentic villages and rural communities. I can not wait to explore this interesting field. After having cycled parallel to the foothills of the Pyrenees for about half an hour, after Saint Laurent we turn to the southwest, into the mountains. Along a winding mountain stream we are getting deeper and deeper into the mountains. Finally we climb to a first pass of almost 700 meters high. We descend into a sparsely populated valley, where we climb to a second pass. For the first time we are looking at really high mountains. 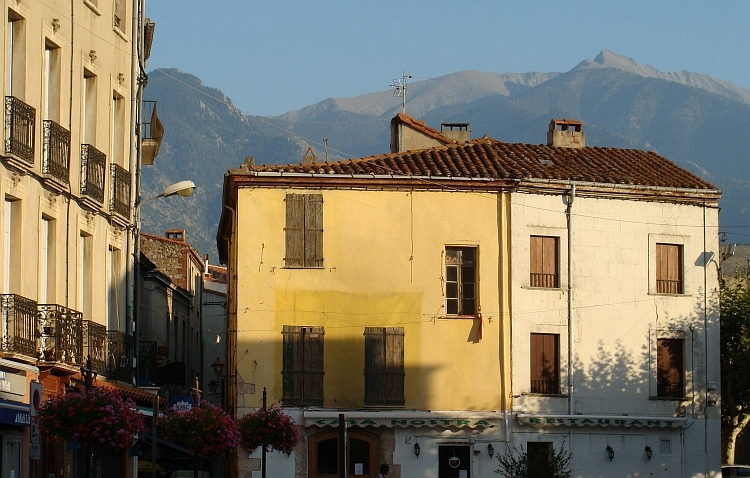 The 2731 meters high Mont Canigou rises like a monolithic giant above the valley. The descent has got a lot more to offer. 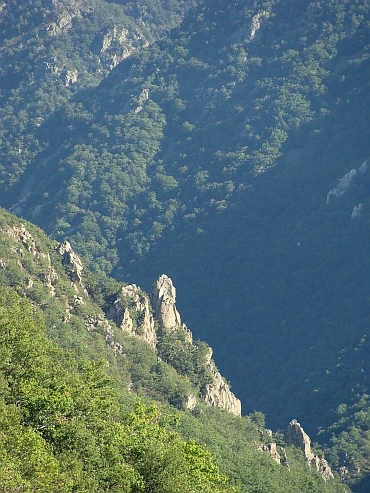 The Gorges de Galamus is one of the most spectacular gorge valleys in Europe. I know the valley from my first cycling trip in 1999, when I passed at this same spot late in the evening. So I know what to expect: hundreds of meters of vertical, snow-white cliffs and a narrow road that seems to be carved into that same rock wall. 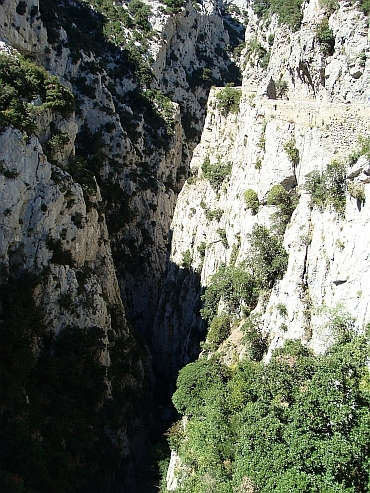 It is a mystery why the Gorges de Galamus are still relatively unknown. Perhaps because the gorges are located in a remote, sparsely populated region. Anyway, it is Saturday and there are a few day-trippers who have also come here to take a look. There is a nice atmosphere in the canyon with many walkers, two cyclists and virtually no cars. 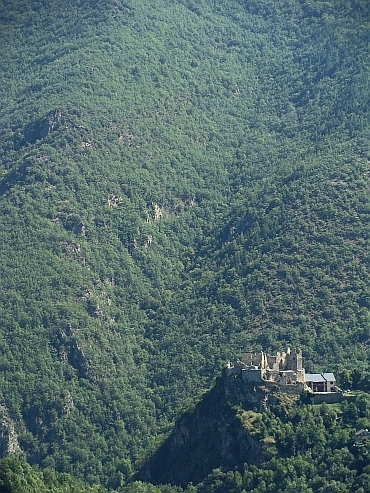 We descend through the gorges and pass the chapel of Saint Antoine de Galamus. Saint Antoine de Galamus was a hermit who built and decorated a chapel in a cave in the rock cliff and stayed there for decades. 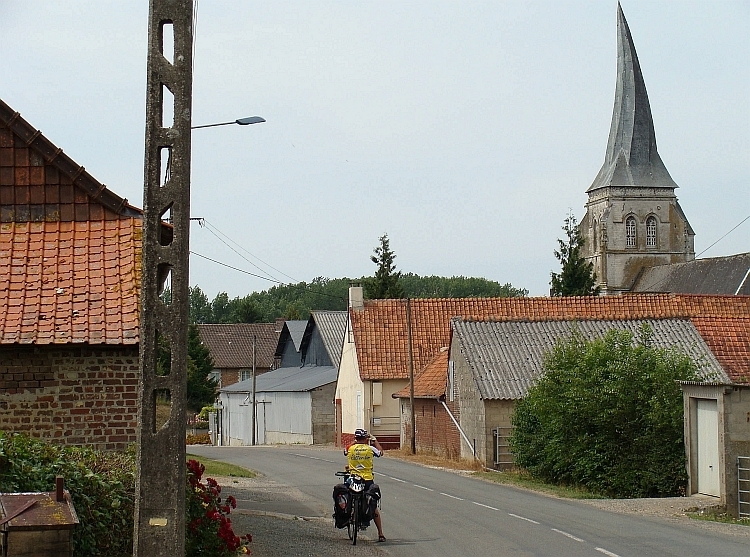 We reach St. Paul de Fenouillet and move on further westward on the dull, busy road to Axat. Part of the way we can use a quiet parallel road but the rest of the route to Axat is not pretty. We manage to reach the Camping Municipal of Axat, one kilometre from the busy road, on a small high plateau with magnificent views of the Pyrenean peaks that are very close by now. Today we have crossed the foothills of the Pyrenees, tomorrow we will meet the high Pyrenees. We are having breakfast at the campsite. The heavily forested, dark green mountains around us are not very high but the sharp forms give a foretaste of the alpine sceneries, that await us the coming days. Today we will cross the main ridge of the Pyrenees and descend into Spain. The Gorges St George are a fitting overture to the Pyrenees adventure, a grandiose gateway to the mountains. 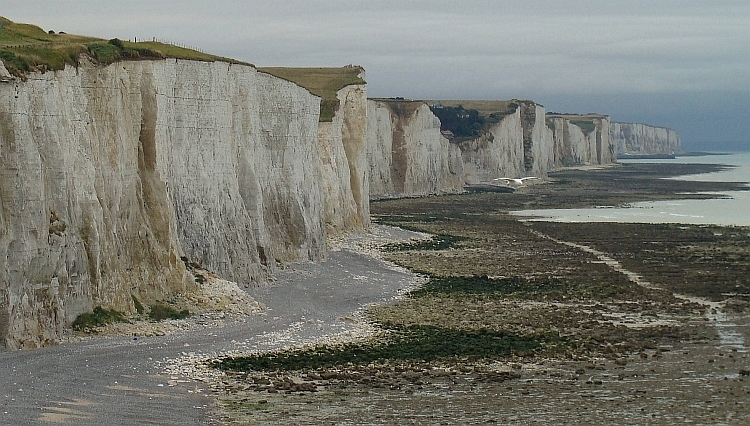 The narrow road leads through a passsageway of sheer vertical white limestone rocks. After the passage the road follows the course of the Aude. 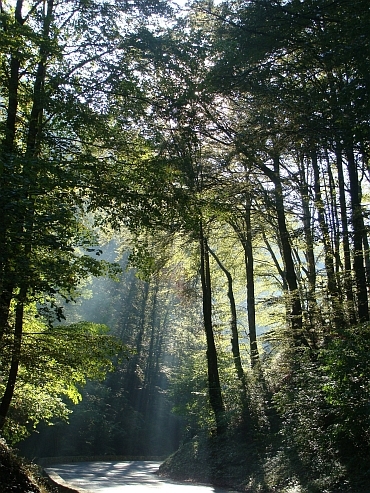 For a long time we follow the road up through the narrow wooded valley. In the village of Usson-Les Bains we leave the valley and climb steeply to the village of Quérigut in favour of following the main road along the Aude. So we break the 57 km long climb to the pass Axat at over 1,700 meters in pieces. 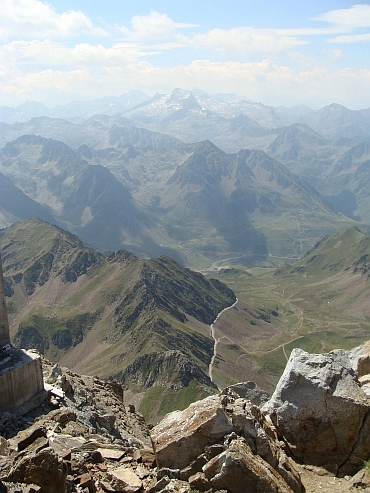 The high route offers beautiful views on the three thousand meters high mountains. Regrettably it is quite hazy today, the views could heve been better still. After a climb to a small ridge, we descend into the valley of the Aude again. We are at 1,400 meter elevation now, in a broad valley with large lakes beside us. Slowly we move on through the wide valley, a somewhat monotonous experience. We leave the main route for a detour to Les Angles. Here begins the final climb. We arrive at the highest point, the Col de Mel at 1764 meters altitude and de descend to Mont-Louis where we reach the wide, main road to Andorra. We descend rapidly over the dull wide road. In Puigcerdá we reach the Spanish border. 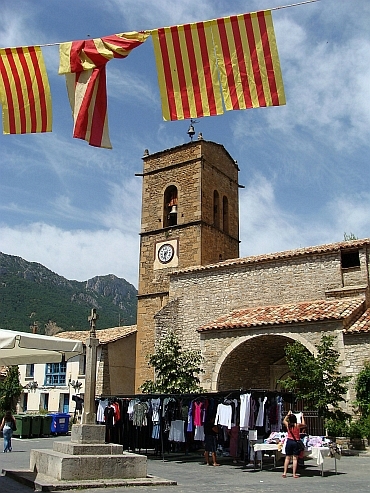 From the Spanish border town we descend fifty more kilometres further in the direction of Seo d'Urgell. The landscape in Spain is interesting again. In particular, the vistas of the rock wall of the Sierra de Cadi are impressive. Two hours after the border we are in Seo d'Urgell. Because we want to feel the atmosphere of the city, we take a hotel this time. The investment is well worth it, as Seo d'Urgell proves to be quite a splendid city to explore. There is a medieval festival with a lot of strangely beautiful music. A medieval ensemble does the job quite well but the Spanish folk band that plays before the gorgeous Romanesque cathedral is superior. Charged with the energy of the concert we stroll further through the busy city center. Seo has got vibe this evening. Young and old are parading on the streets and squares of the old city and the energy on the streets is frenetic. What a contrast with the deserted villages and towns of France. 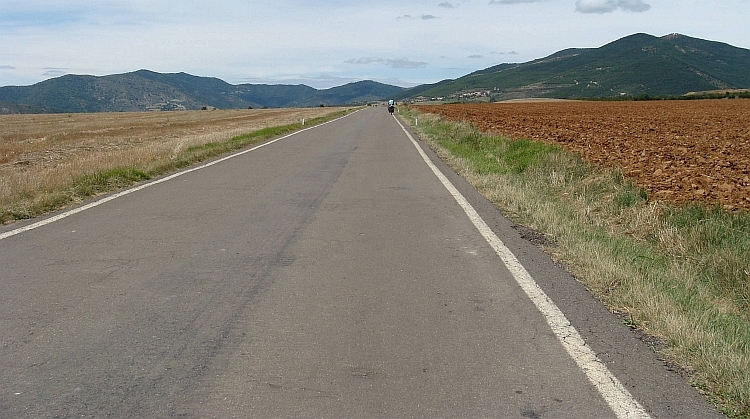 We are cycling on the highway from Seo d'Urgell to Adrall. Today is the day. The Puerto del Canto is a pass that has achieved legendary status. The climb is memorized as the most irregular climb that I know. Eleven years ago, on my first cycling trip, I have also gone up over the small pockmarked road, in a burning afternoon sun and with no information other than that the cool facts, that state that the climb is 26 kilometre long and a bit more than one thousand meter high. My estimate back then was that the climb could never be difficult and I died a thousand deaths in the first six kilometres of the climb. The rest of the climb was also irregular with a lot of downward meters in between and so a lotof extra upward meters as well. So we are warned this time. I am very curious about how we will do this time. Will it be easier now? We will know soon. At Adrall we take the exit road to the Puerto del Canto and we are cycling right down to the slope that is littered with hairpin bends. I remember that especially those hairpins were a hell of a job. It seemed as if the civil engineers of Spain built the straight stretches of road first and as they found out that there was no space left for the curves, they laid them down right against the slope. I never got rhythm with these horror thresholds. We are crossing the river. The road is still wide. At the foot of the climb the road is still wide. Was the road really this way? I thought that the road was narrow from the first beginnings? Now we find out that the pavement is as smooth as a freshly ironed tablecloth. I must admit that the experience does not keep up with the expectations. Is my memory so unreliable? What would Willem think? After one kilometre, the road is still wide. Indeed Willem is beginning to make inquiries. "So this is one of the toughest climbs of Europe? "Back then the road was really narrow, I am sure." But how strong is my point that the surface really was irregular and the curves really steep as we can see for ourselves, here and now, that the road is straight and that there are no excepttionally steep passages." Within an hour we have the "killer first six kilometres" behind us. The climb is not easy but is not very difficult either. The atmosphere in the villages like La Parróquia d'Hortó, the views of the valley, everything in my memory is still there, only the road is much wider, less steep and far more regular. The road must have been repaved in the meantime. But why? 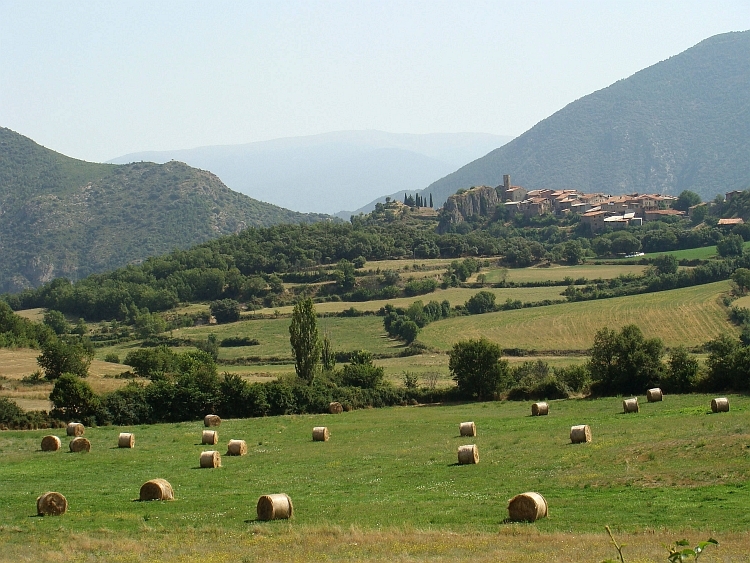 Why such a wide road through rugged mountains between a small town - Seo d'Urgell - and a small holiday resort - the village Sort? I do not understand. The remainder of the route to the "Gates of Hell" goes even more quickly than I expected. As we stand on the Puerto del Canto, nothing is left of the legendary status of the climb. Only the memory remains. Fortunately today we had another thing in mind. 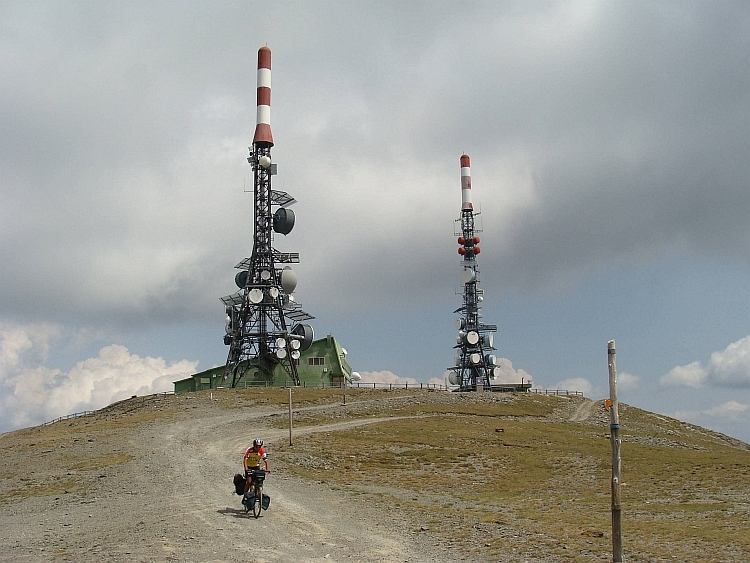 On my map is a - probably dirt - road signed to a mountain top, the Torreta de l'Orri, 2.439 meter high. It is a dead end street, so we will have to return the same way. After two hundred meters the pavement turns to dirt. The road is steep and strewn with large stones. The cycling is physically demanding and technically challenging. To find a good line between the stones takes full concentration. Slowly we crawl up through a landscape of dense pine forests. The climb goes well, I am in a good flow. Willem is also going well. We reach a mountain hut. On the maps in the hut we see that the jeep track indeed extends to the top of the Torreta de l'Orri. But there is more good news: on the other side of the mountain another jeep track runs down. If everything goes well, we do not have to go back the same way. After a brief break we continue our way up. The road does not get any worse but the effort continues to be very high. We climb above the tree line. Slowly but surely we come closer to the top. The last part is vitriolic but then we are on top. What a climb. We have climbed 1,800 meters altitude difference from Seo d'Urgell. It is cloudy now and in the west, in the distance, showers are already visible. We start the long descent. There are many large stones on the road but there are also stretches of loose sand and gravel. Sometimes there are deep gullies in the road with large boulders. The crossing of these channels is difficult. I am not good in shape in the descent and I am feeling insecure. Willem descends like a spear, which makes me even more uncertain. I am having muscle pains in my thumbs and wrists of the pressure on the brakes combined with the punches caused by the many large stones. Occasionally I have to stop to drain away the acidification of forearms, wrists and fingers. An hour we are fully occupied by the steep, technical descent. In a ski station we reach pavement again. The road is very bad for an asphalted road with deep, large holes, clefts and sometimes there are large rocks on the road. The descent is a cinch compared to the boulder road that we are coming from. I am flying down. Meanwhile, is starts to rain. Large drops. The beginning of a serious shower. We are lucky that we are riding away from the center of the shower. 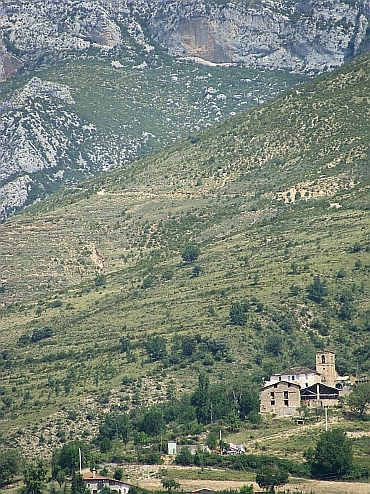 We reach the village Rialp in the valley of the Noguera Pallaresa. We are down now. The rain has cleared away and life is suddenly easy. Only three kilometres flat along the river and we will be at the campsite in Sort. That could not be too difficult. Especially as we see that the road consists of high quality asphalt. Anyway, again the road is much wider than I remember. We reach the town of Sort, which has grown impressively over the last ten years. 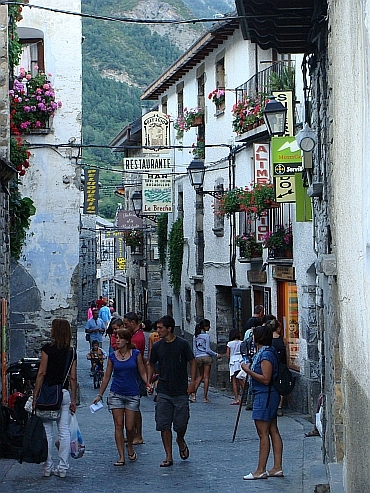 What changes the Spanish Pyrenees had undergone in the last few years. The developments in the Puerto del Canto seem to be part of a larger pricture. I wonder whether the building of all these new houses and the road widening projects are a regional phenomenon or that the whole of Spain has facelifted itself. Spain has got quite a reputation of construction projects but what we have seen so far is beyond expectations. The coming days we will see if this is a regional phenomenon or that we will see too many new houses and too many major roads throughout the whole Spanish Pyrenees and maybe the whole of Spain. 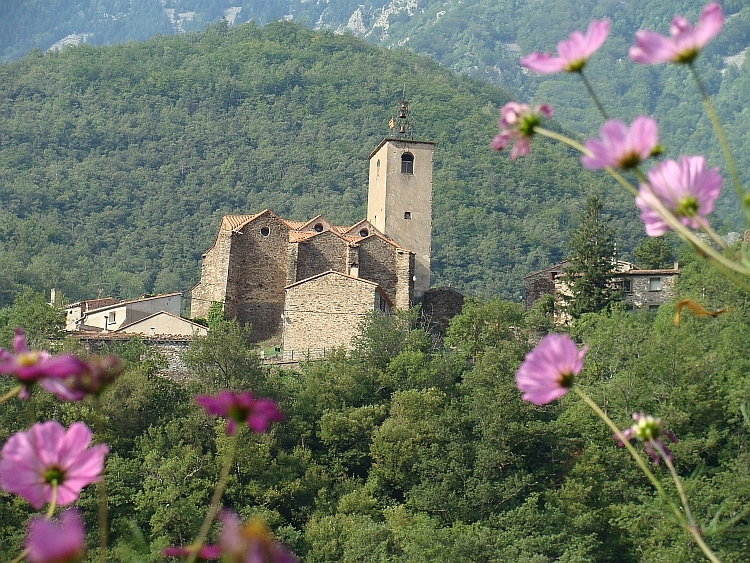 From the village of Sort we descend over the well known N-260 road that links the villages and towns of the Pyrenees from east to west. Just like the climb over the N-260 to the Puerto del Canto the trajectory of the N-260 from Sort to La Pobla de Segur has got wide lanes with top quality asphalt. Nice for the Spaniards but perhaps less successful for bicycle travelers seeking scenic beauty and adventure. 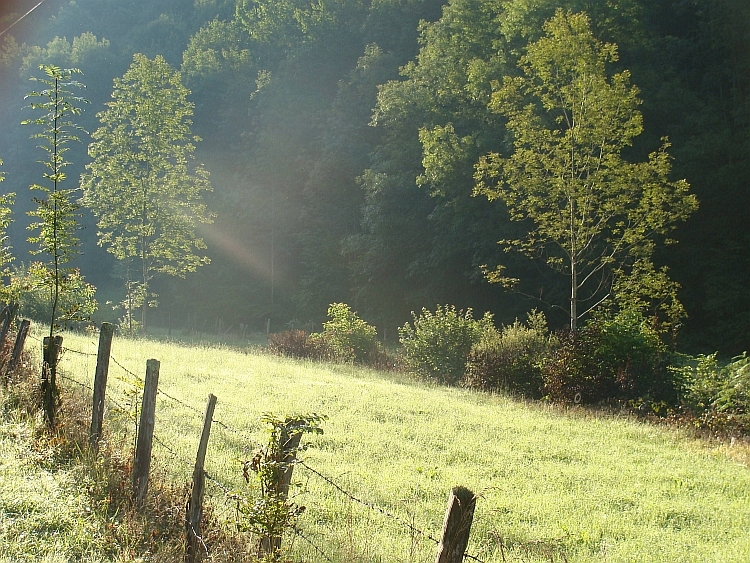 Besides the excessive amount of asphalt, the valley of the Noguera Pallaresa is beautiful in the early morning sun. We leave the broad N-260 in favour of a minor road through the mountains. We climb on a narrow, but perfectly asphalted road to Peramea. The charming village lies strangely beautiful in the landscape. No new houses in this village, here we find the "Old Spain" that I remember. Fortunately it still exists. After Peramea we move on and after a gentle climb we descend to Senterada, an oversized village of mostly newly built homes. At Senterada we also reach the N-260 that nearly occupies the whole broad valley. The N-260 is as wide as a highway. The main difference is that there is hardly any traffic on the road. Ten kilometres we climb gently over the asphalt valley until the start of the climb to the Coll de Creu de Perves. The road goes up firmly and the road is suddenly no longer a highway but a single carriageway. Not long ago, the entire N-260 must have been like this isolated stretch. 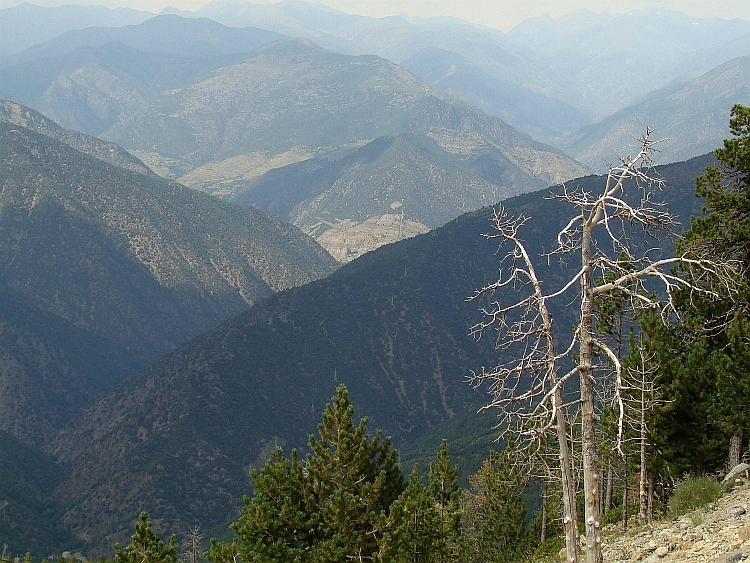 The climb offers great views of the high Pyrenean peaks. The pass itself is not too high and after an hour sweating in the mid day heat, we reach the pass. 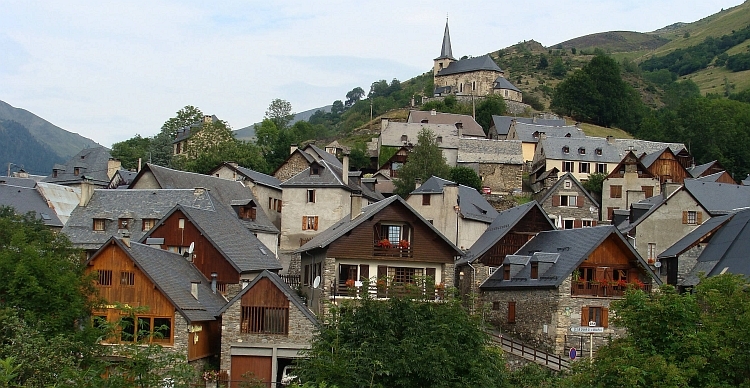 The descent brings us in El Pont de Suert, a town along the broad and busy N-230 from Lleida to France. We leave the N-230 as soon as possible and we find a camping in the Vall de Boí. Willem does not feel like cycling anymore. I decide to explore the valley on my own, on an unloaded bike. 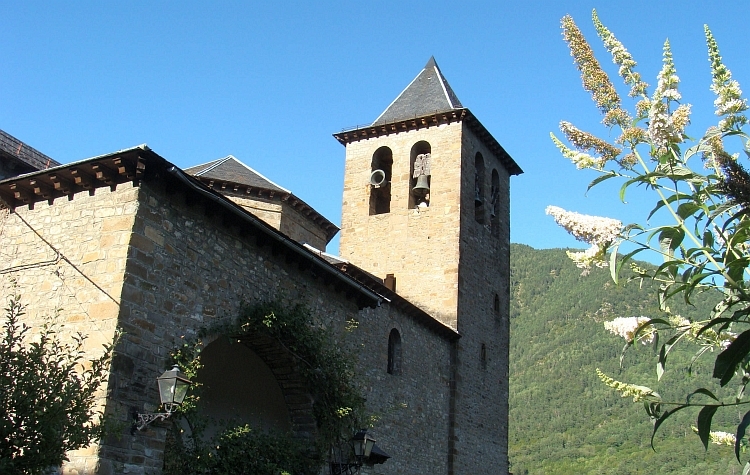 There must be some beautiful villages and there is the well-known romanesque church of Taüll. The road to Boí and Taüll is exceptionally wide for a dead end road. The villages in the valley have got a lot of new hotels, restaurants and private houses. Unfortunately the new buildings effectively block views to the old cores of the villages, that must have grown considerably over the last years. Despite the fact that the houses have been built in the old style but it would have been so much nicer if the valley would have fully retained its pristine, peaceful qualities. Is it possible to preserve natural, ecological and cultural values if so many people love this beautiful valley at the foot of the high peaks of the National Park of Aïgues Tortes? People like me, people that those houses and restaurants and supermarkets have been built for. The search for beauty and enlightenment will be more and more difficult with a growing world population and a correspondingly growing pressure on its landscape and its human and natural inhabitants. But of course there are the churches too. That was what I came for after all. 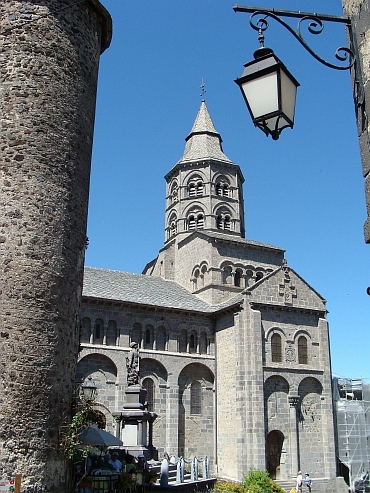 Beautiful Romanesque churches. Simplicity. 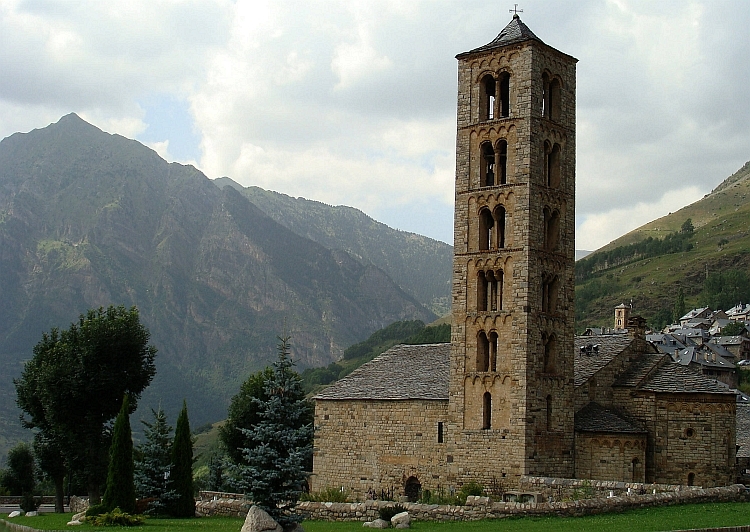 The Sant Climent de Taüll is the best known and most striking of the churches with its long, ultra slim campanile, sublimely located between the high Pyrenees summits. 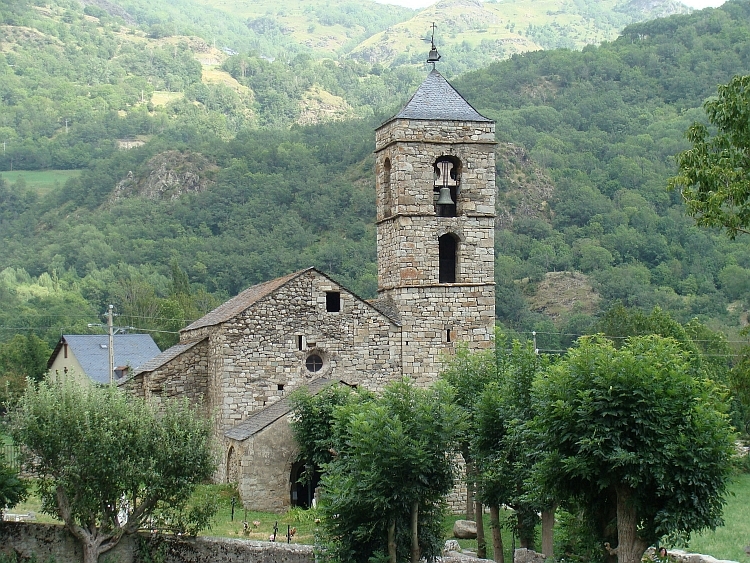 Overall, the small solo tour of the Vall de Boí has brought me all: from a sad melancholy of the fleetingness of the old villages to the spirited feelings about the fascinating churches and the rugged nature. After a few kilometres we leave the all too familiar, broad N-260 and on a much smaller road we climb to the obscure the Bonansa Coll. The new asphalt is smooth as an eel but I do not wonder any longer. Through the village of Bonansa we climb to the col de Bonansa. During the descent we suddenly find ourselves in a wild rocky landscape. Slender towers of rock soar into the sky and deep canyons are hidden between vast rock walls. We descend into a gorge where we follow the river, swinging between the rocks and eventually slowing down through a broad valley. We have left the high Pyrenees behind us now as we descend into the southern foothills of the Pyrenees. Before we leave the mountains, we take the exit road to Campo in order to return to the high Pyrenees. In the village of Villa Carli, the great monolith rock Turbón dominates the sky, a rock giant that looks like a white coloured Ayers Rock. 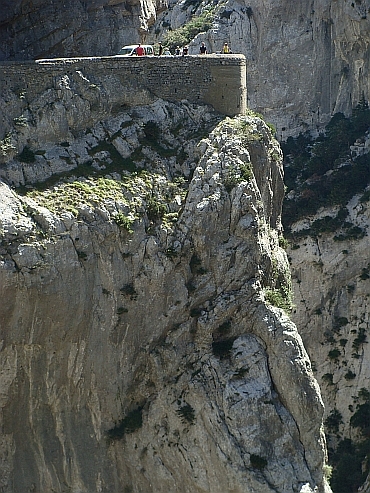 The road to Campo leads around the Turbón rock to a new pass. The last kilometres to Campo is a downhill on a road that is so broad that you can land a Boeing-747 onto it. And there is not a single car on the road. It does not look like the millions of Dollars investment will pay itself back in the next zillion years. We reach the friendly town of Campo and reach the N-260 once again. The N-260 is very broad and leads through a long tunnel. Fortunately, the old road is still there. Although the road is weathered down and is strewn with stones and boulders, the road is still useful. The road is leading straight up. On the left, somewhat lower, the insanely broad N-260 is a lot steeper still. Just before the roads could be reconciled, the old road is completely washed away and we are blocked. I had a feeling that this was going to happen. Whatever, Willem and I do not want to cycle back. We try to plough our bikes through the bush and slide our bikes through loose rock. A difficult job, and I fall backwards and hurt my ankle. It is not clear what is cause and what is effect. Eventually we succeed to reach the road. I try to ride again, cautiously. The injury seems not too bad, although it takes a while before I dare to entrust my anle really. A light injury is the analysis, but be careful. I can concentrate again on the road. I see that this must be the ugliest climb I have ever done. A completely deserted road, wider than a highway with meters high concrete walls that protect the road against falling rocks. The vision is limited to grey surfaces. Grey skies, concrete walls and miles of straight highway virtually without any traffic. Two hundred meters before me I see a turquoise dot on the road. Willem. I feel do not feel my injury and I sprint to Willem and together we climb world's ugliest road. I am happy when we finally reach the pass and we are able to descend to Ainsa, the final destination of today. 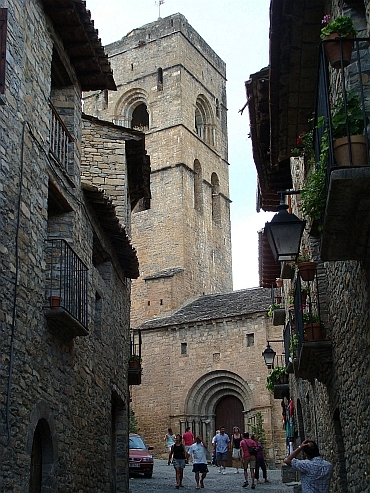 Ainsa is one of the most beautiful villages in Spain, but is also very touristy. 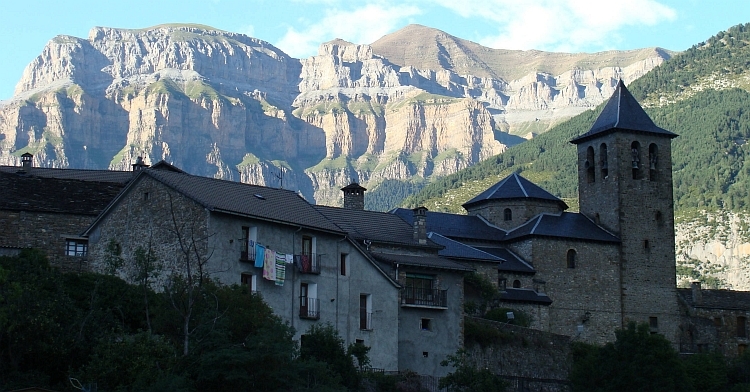 In the distance we can see the mountains of the Ordesa National Park with snow on the high peaks. I am so glad that there is still beauty in the world. I am stiff from yesterday's fall. 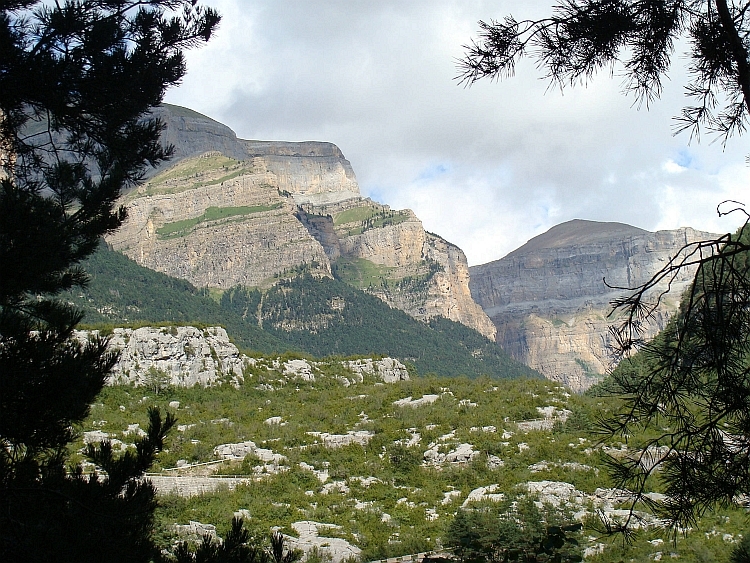 Fortunately, the trail to Torla, at the foot of the mountains of the Ordesa National Park, is not difficult. 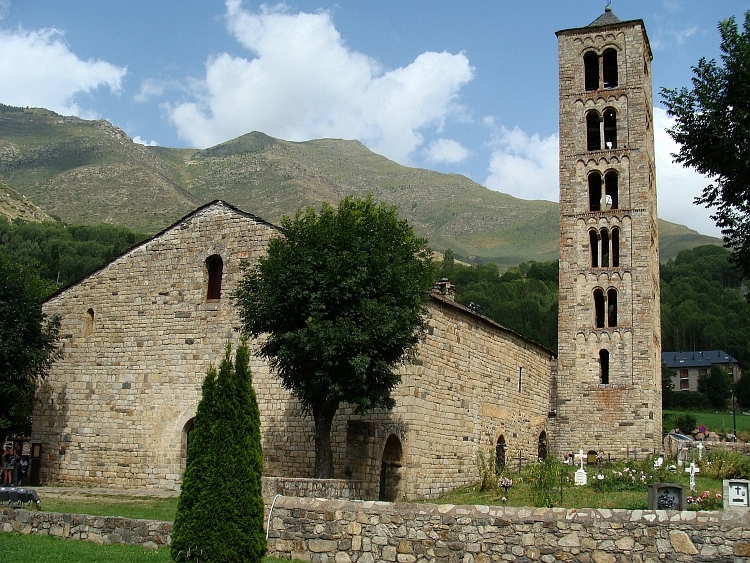 From Ainsa we cycle over a narrow road to the elegant monastery Ermita de San Vicente. We reach the N-260 again. The N-260 is fortunately not widened yet. The road is leading through beautiful landscapes in fact. The stiffness slowly drains away from my body. I am feeling a bit better now. We follow the Rio Ara Torla for a few hours until we reach the foot of the massive mountain ranges of the Ordesa National Park. 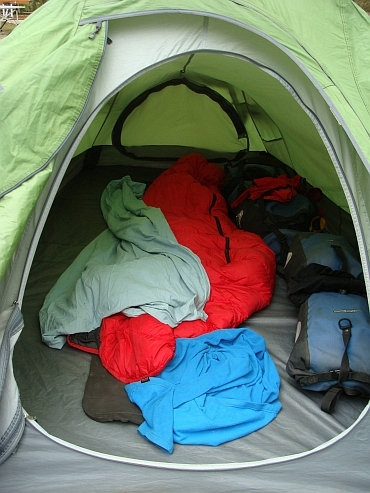 We pitch our tent in one of the campings and we cycle without luggage to the National Park. It is a setback when we find out that our bicycles are not allowed in the National Park. It is also too far and too late to walk. We carry out plan B: to cycle upward along the Rio Ara and keep going up until we cannot go any further. The road is unpaved and steep. There is a lot of traffic that produces thick clouds of dust. It is a shame that the broad zillion dollars roads do not have any traffic, everyone rides on this narrow dirt road. We reach San Nicolas de Bujaruelo. Here the cars can not go further. So happy about that. After one kilometre the road gets incredibly steep. We could never have succeeded to climb this road with luggage and without luggage it is also a tough nut to crack. We ride up through a stunning mountain landscape. Eventually we reach a hut at 1600 meters altitude where we definitively cannot go any further. We descend to the beautiful but today very busy village of Torla. 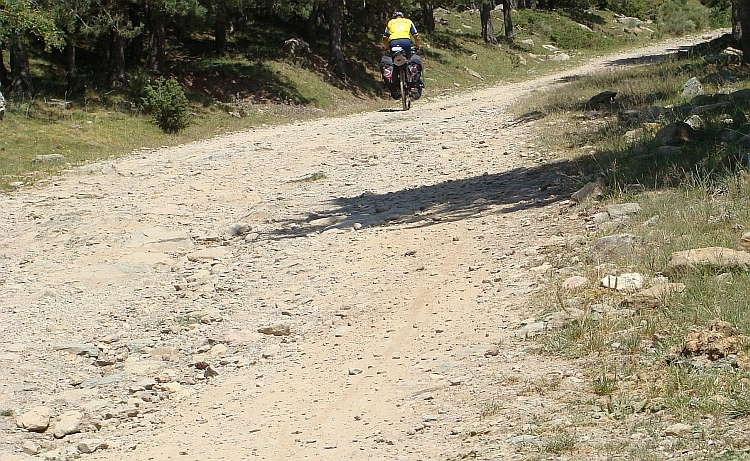 The climb from the campsite to Torla is short but very hard. With fifteen percent average the road goes up. 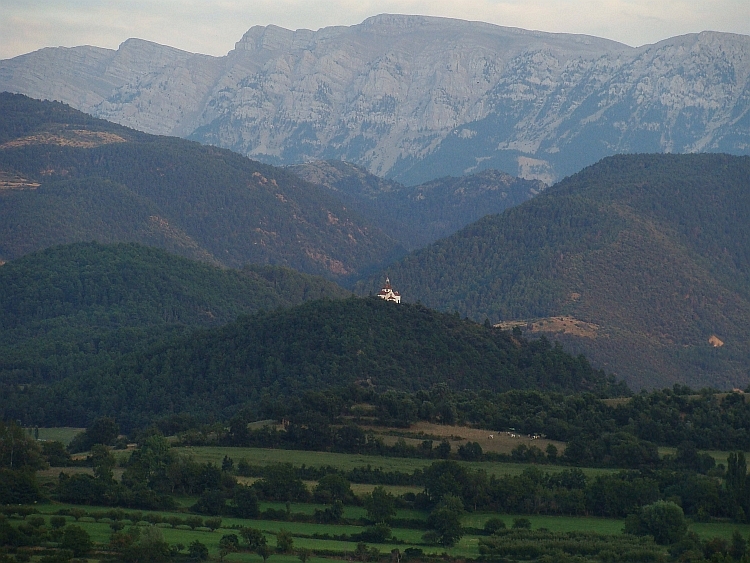 Once in Torla we cycle to the N-260 and turn west, in the direction of Jaca. 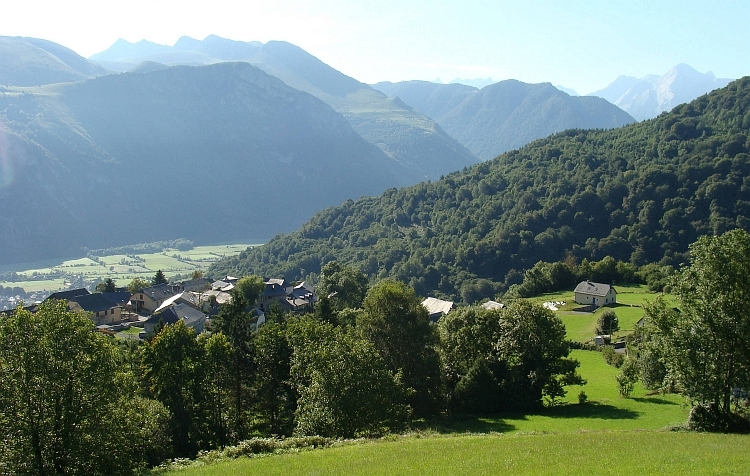 We cycle up through a friendly landscape with characterful mountain villages. 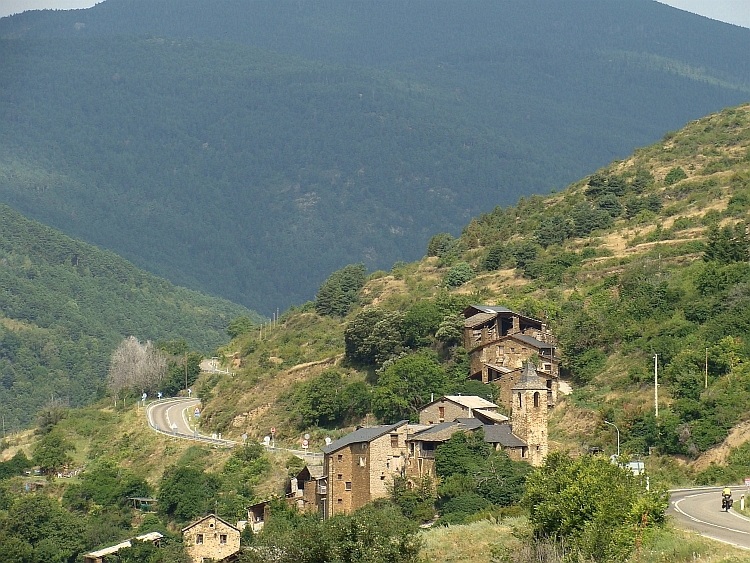 The not climb is not steep and leads to the Puerto de Cotefablo. It is not a true pass in fact. We cycle through a tunnel two hundred meters below the real pass. The descent to Biescas is a piece of cake. 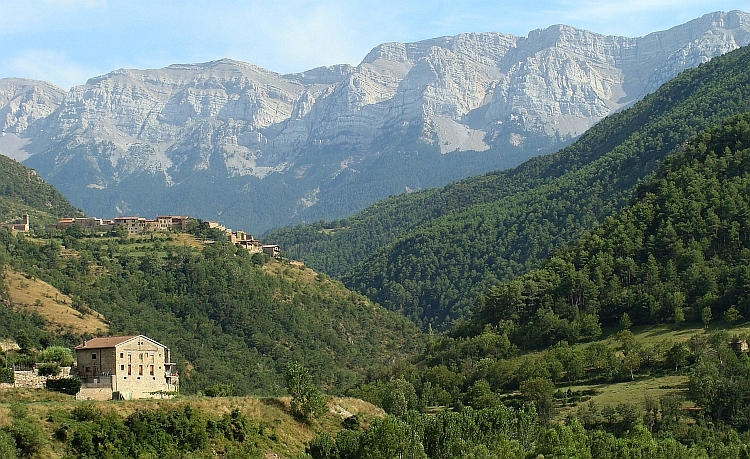 In Biescas we have two options: the short, easy route along the highway to Sabiñanigo and Jaca or the long and difficult route on small country roads. In 2000, on my way to Santiago de Compostela, I have chosen the short, easy path, prompted by the fact that I had only one hour of daylight left back then. This time we find ourselves on the long, hard way. Unfortunately, the long, hard way does not lead to introspection and even less to important insights but it does lead to the perhaps ugliest town of Spain. Sabiñanigo is a busy and highly uninviting town, surrounded by a large industrial landscape of hydropower and other industrial artifacts. In Sabiñanigo we choose once again for the long, difficult journey. A short, steep climb over a small hillrange brings us at a long, never ending road that parallels the highway to Jaca. In the straight valley we have a strong headwind. The road leads up slowly, kilometre after kilometre, through the boring valley. We fight against the wind, an unprecedented monotonous experience. We must continue to move on. Willem will depart back home from Pamplona tomorrow evening so we must reach Pamplona tomorrow and Pamplona is still far. So here and now we have to cycle on, so that we are in time in Pamplona. Hard work. Not complaining now but pedaling. After the long, boring straight passage through the valley, we finally climb to a small pass across the hillrange, and eventually we leave the boring valley and we descend to Jaca. We have no time to explore the city. We cycle on and ride towards Aisa. The wind is not going to slow down. On the contrary, I have the impression that the wind is only strengthening. The landscape is quite fascinating. We move through large, open, barren plains, flanked by solitary mountain ranges and crossed by rivers that are flowing down from the high Pyrenees to the south. Sometimes we descend about fifty or one hundred meters to such a river and climb back to a new plateau. When we reach the Valle de Borau, the road bends to the north and we follow the river. We have still not got rid off the wind. We ride straight off to a fascinating row of mountains. On the French side of the Pyrenees peaks, there is bad weather. The thick clouds are pushing heavily to the northeren wall of the Pyrenees. The clouds have mean gripping hands, with which they cling themselves to the north face of the mountains, luckily they have not yet been able tomove across the Pyrenees to the Spanish side of the mountains. 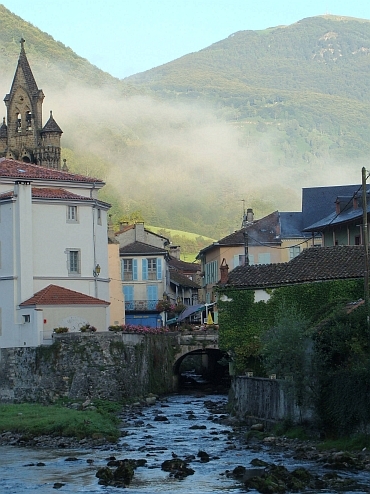 We cycle up the valley and reach the village of Aisa, at the foot of the Pyrenees chain. We take a break in the pretty village. A young driver races through the streets, makes a few rounds through the city, chats to this or that passenger and goes further. The chats are characterized by the unilateral nature of the conversations, where only our driver has a say. The monologues do not take longer than ten seconds. A response is not expected, not appreciated and not waited for. Then he accelerates, slips and he is gone again. The village is small and after a minute he is back and it is time for a new round. When he sees a friend at the place where our bikes are parked, I see that he is parking his showpiece at less than an inch of my showpiece, my Batavus. I hope for him that he is aware of the risks. It does not like that. He utters a few monkey shouts to a villager, makes a few busy gestures and shows an intensely bored face, which seems to indicate that the one-sided conversation has come to an end. The empathic abilities of the young man has not come to full blossom yet. He shuts down his window and then everything is going fast. I hear the growling of an accelerator pedal that is pressed too hard, I hear the screech of iron against iron, see that the edge of his car hits the handlebars of my bike and push these handlebars in an unnatural 90 degree angle to the frame, observe how my bike slowly but surely slides down, hear the handlebars rubbing down the wall, see how my front wheel slowly but surely slides under the car, notice how I leap up from my chair, hear myself scream with all the power and authority that I have got inside "STOP", hear the car coming to a screeching halt, feel the adrenaline pumping in my body when I sprint to the car and throw myself before the car and pull my bike from under the car. I am tremendously happy. The rear wheels of the car had not reached my bike yet and therefore my bike is not crushed. Meanwhile, the window slides open. Folded hands to ask for forgiveness. I donot bother. My bike is saved, that is the point. After this interlude, we can move on. A nice climb brings us to a new pass. The descent to Jasa requires the necessary concentration with poorly engineered curves and a lot of loose gravel on the road. The wind has been stirred up to a storm. After the descent to Jasa we do not gain any velocity against the raging storm. We reach the road to Hecho, and we have difficulty to move forward. My window of life is limited to moving air particles now. There is simply nothing else. We are climbing and fighting a way way up against the storm. We move only a few kilometres per hour against the wind. Despite the wind we reach the nice place Hecho. And then the question is: shall we still stick to the initial plan and cycle further to the next village Ansó? In fact that is the best option because tomorrow we have to cycle over one hundred kilometres to reach Pamplona, where Willem must catch the cyclebus back home. Cycling further also means that we must overcome yet another pass in the raging storm. We decide to cycle further; if the storm is so bad that we have to return, we have at least the wind in the back in the return trip. We seem to be lucky. Once on the climb to the pass we are suddenly and unexpectedly on the lee side of the mountains and therefore the wind is not as bad as expected. The climb to the pass is not too long and eventually only the last mile the headwind is raging with full power. On the descent, the road proves to be steep enough to easily overcome the wind. 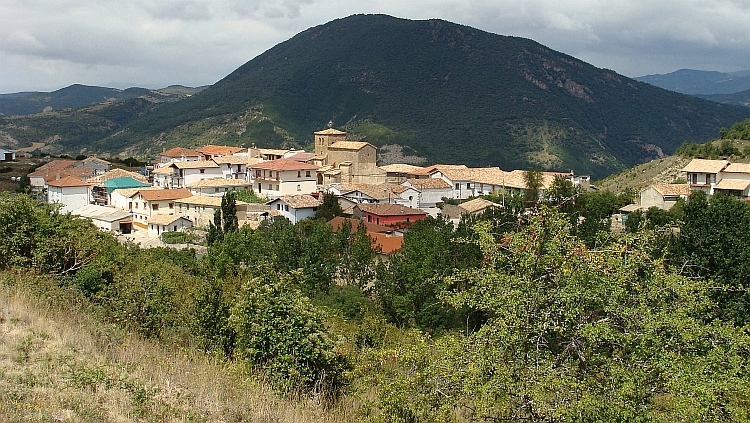 We reach Ansó, a beautiful village on top of a hill in the green valley of the Rio Veral. Here we find a place on the camping. The road leads straight up from Ansó. After five kilometres we are standing on the pass and we descend into Navarra. The long descent brings us in the Valle del Roncal. We continue to descend in the Valle del Roncal. After Burgui we reach a spectacular gorge. There are signs that warn for a roadblock. We cycle further but after a few kilometres there is indeed a roadblock. An avalanche has awept the road away. We overcome the passage with great difficulty and some risk too. But we are on the good side of the passage now and we continue our way. A new climb brings us to a new pass. There is a strong westerly again today and the wind is getting stronger by the minute. Not as extreme as yesterday but nevertheless strong enough to slow us down considerably. Besides the wind, there is more trouble coming from the west. Some tough showers are hanging above the country. We descend to Lumbier. It is ten years ago that I passed this same spot on the way to Santiago de Compostela. On the same route we continue to Pamplona. We have finally left the Pyrenees. We are in a panoramic, gently rolling landscape with green fields and yellow ocher hills. The wind is not strengthening any more and the sky breaks open. 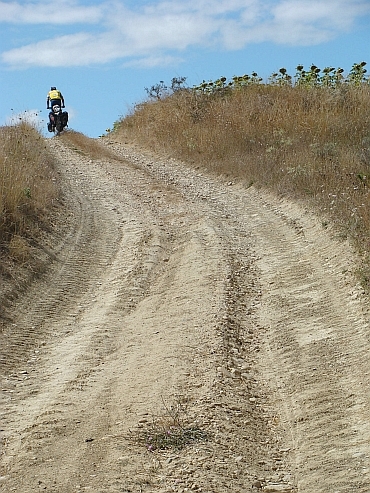 We choose for a long passage on a road that is barely more than a tractor track with some tough and technical passages. The fun does not last. The last kilometres to Pamplona run over ever larger roads and we reach the outer suburbs of Pamplona. It is relatively late and there is no time to explore the city of Pamplona. We turn to the north and reach the camping near Eusa. I put up my tent and we have just enough time to dine together. The bus driver is one hour too early and we have barely finished our dinner. The bus is ready for departure. We must quickly say goodbye. Willem steps into the bus that drives off. Suddenly I am alone. I have another two weeks left. Tomorrow I want to reach the French Atlantic coast. Then the entire chain of French Pyrenees lie at my feet. The first day alone. I drink an espresso at the bar of the camping. Outside it is overcast and it is about to rain. According to the young bartender it will probably be a rainy day. "But hey, this is Pamplona", she says apologetically. I myself have my own experiences in Pamplona. When I got here on this same site in 2000, on my way to Santiago, I have experienced the worst storm of my bike trips. It is dry. 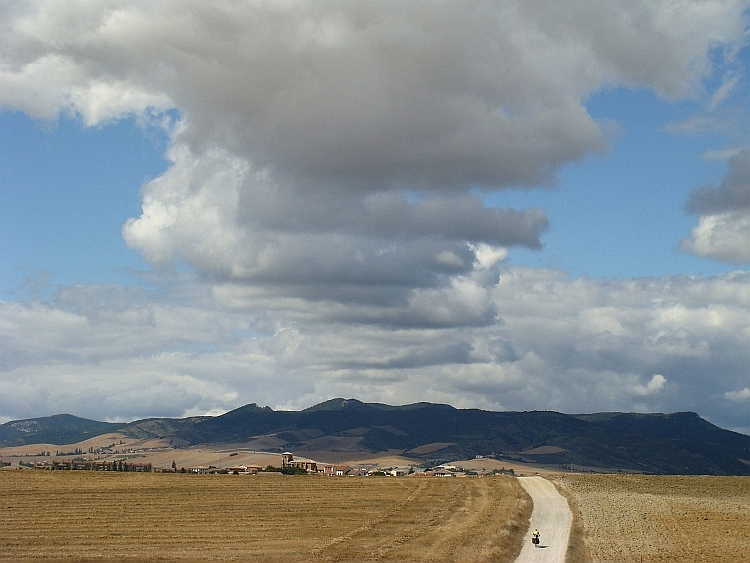 For the first time I am cycling on my own, winding down a road through the deserted, dark land of Navarra. I am passing semi-abandoned Basque villages. I am heading north, to the Atlantic Ocean, to the French border. The idea is complete the circle and to cross the entire range of the French Pyrenees. I move through the hills north of Pamplona. There are a few showers above the landscape, once in a while I am a victim. The landscape, the villages, the gray sky, rain, my lonely mood, there is a universal unity in my observations and perceptions, in my moods and in my thoughts today. An intense dark beauty that neither tends to the positive nor to the negative. I reach the main road that leads from Pamplona to the Basque coast and the French border. The road has got many long tunnels but there is still the old road, that is leading up to the Puerto de Belate. It is raining again. I would probably have great views if the weather had been good. On the highest parts there are no trees. It is not clear to me whether this is caused by the wind or cold or that there are other harsh conditions that make sure that trees cannot survive here. I myself am pretty cold too and I begin the descent. I slither and slide down through the many curves of the old road until I reach the new road that is leading straight down. I put my Batavus in its toughest speed and pedal full power, full speed down into the Valle del Bidasoa. Once in the valley I loose the momentum. The new road is too broad and too busy and has got too many tunnels, so I prefer the twisting old road again. From Bera de Bidasoa, there is a dirt road through the valley. On this road I am heading for the French border at Hendaye. Suddenly I am standing before the Atlantic Ocean. I am looking across the endless sea. Heave showers are hanging above the sea and above the land. It ccan go weong any time now. The coast is very mountainous, especially on the Spanish part of the coast. The French as well as the Spanish part of the Atlantic coast is strewn with towns and villages. The traffic is unusually busy in Hendaye, an enormous culture shock after the lonesome stretches that I have traveled this morning. So part 2 of the journey has also been completed now. I have crossed the Pyrenees from east to west now. I turn around, I have got the whole chain of the Pyrenees again laid down before me. I have finished the Spanish Pyrenees, but the French Pyrenees are still waiting for discovery. I put my bike in motion and cycle towards the mountains. A short climb brings me to the plateau of the Corniche Basque where the rocky mountains of the Pyrenees meet the ocean. Unfortunately the road is very busy. It is Sunday and there are many day trippers. Finally it starts raining and hell breaks loose. Not the atmospheric drizzle from the morning but full intensity showers. I descend as quick as possible and finally I find shelter under a bridge. If the heaviest rainfall is over, I climb on a sickly steep climb to the villa neighborhoods of Ciboure, only to descend again over an equally steep road into the center of Ciboure. Slowly I go down over the slippery road surface. I proceed in eastbound direction. In the north, the mountains of the Pyrenees soar the skies. They stand tall as a line of soothing green peaks with strange, angled shapes. The sun comes through, but there are also clouds with menacing anvil shapes. A long, flat stretch takes me through characteristic villages like Ascain, with brightly white houses with crimson doors and windows. This brings me to the first climb: the 169 meter high Col de Saint Ignace. Really nice climbing, short and not too steep, in no time I am uphill. I will loosely follow the Raid Pyrenéen route through the French Pyrenees, a route that leads across the most beautiful and the most difficult cols of the Pyrenees. But of course I will not follow the predestined route all the time, I will also undertake stubborn things. The Col de Saint Ignace is the first of many passes and will surely not be the most difficult. On the top there are crowds of day trippers. There is a train to the dominant peak that towers high above the other summits. The summit is only 900 meter high but the view is no less impressive. 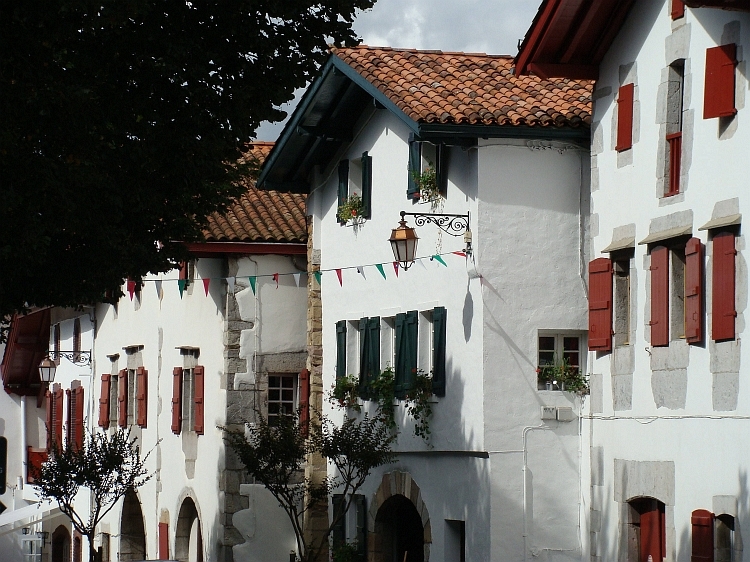 I descend to the pretty village of Sare and the even more picturesque village Ainhoa. I ascend to the second climb of the Raid Pyrenéen, the 176 meter Col de Pinodiéta, also a relatively easy affair. I descend to Espelette and for the first time I leave the Raid Pyrenéen in favour of a smaller road that seems more fun than the road through the valley. That gives me an extra climb, steeper than the other two. 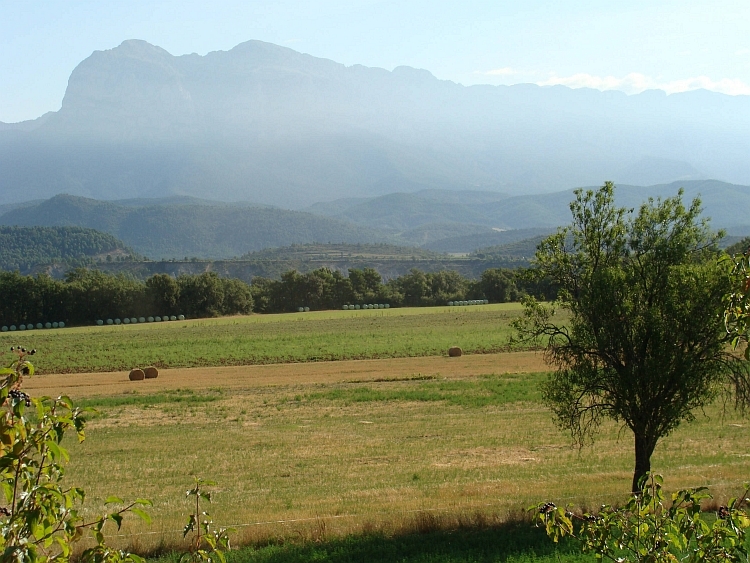 Across the pass is a farm campingsite with splendid views of the Pyrenees chain. Too beautiful to pass by. I put my tent and hit a conversation with a nice couple from Brittany. There is wine and there are personal stories. The imposing clouds and the Basque mountains create an otherworldly atmosphere combined with a sunset that plunges the land and the skies into a strangely beautiful pink glow. Slowly the sun sets behind the mountains and the day is replaced by a wild night, studded with stars. 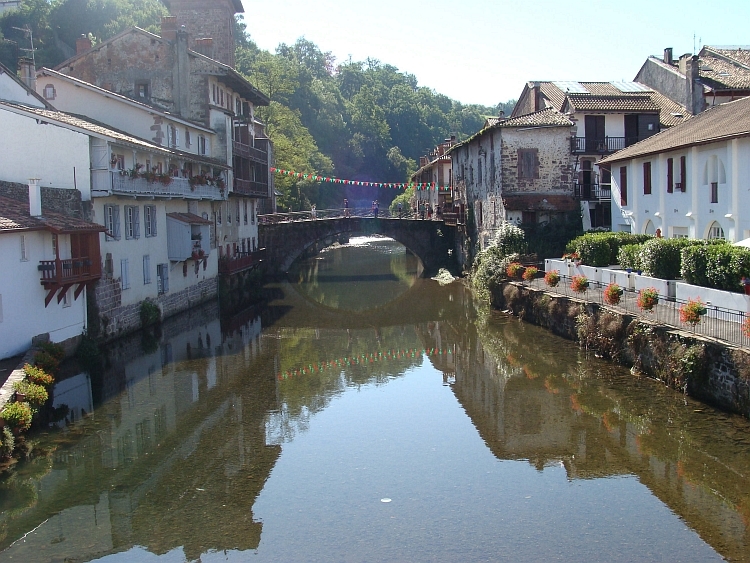 The first thirty kilometres to Saint Jean Pied de Port are almost flat. 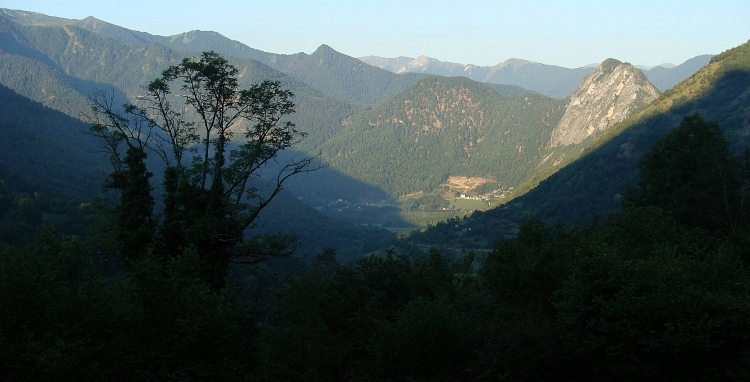 The morning sun throws a splendid golden light over the characteristic, angular, Basque mountains. The miles are quickly overcome. I find Saint Jean Pied de Port on the popular market day. It is incredibly busy. The traffic is completely jammed and even with my bike I have difficulty of passing through. Nonetheless I undertake a small sightseeing tour through the medieval city center. 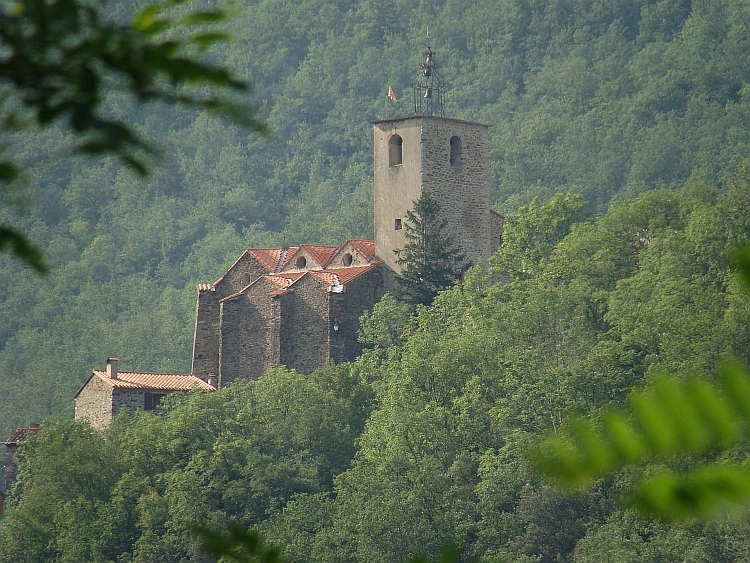 Saint Jean Pied de Port is an important stopping at the Jacobs Road; it is the last stop before the crossing of the Pyrenees. I will not follow the Jacobs Road this time, I have made a journey to Santiago ten years ago on an alternative route. 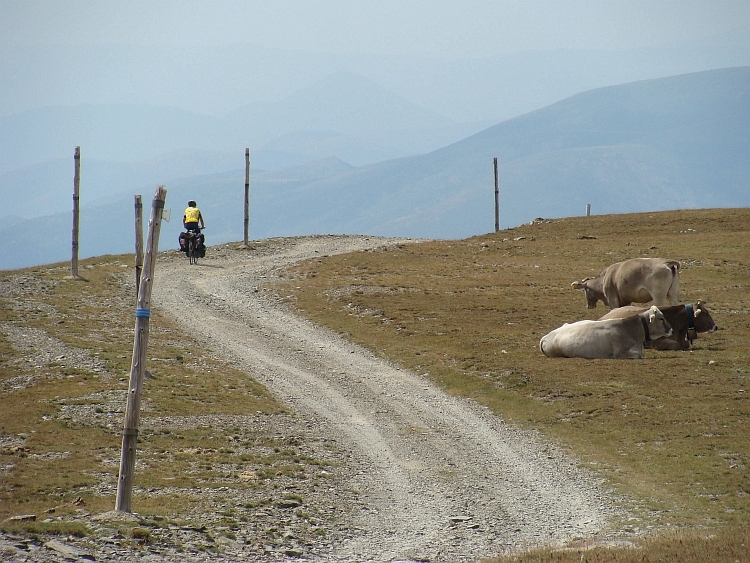 I continue eastward to the Col d'Haltza, Col de Burdincurutcheta and Col d'Iraty. According to the stories this must be a very tough triptych. I am cycling straight to the Pyrenees chain. The Pyrenees are not as high here as further to the east, but the chain certainly does not look childish from a distance. The highest peaks visible are around 1.500 to 1.600 meter high, an elevation of nearly 1,500 meter gigher than Saint Jean Pied de Port. 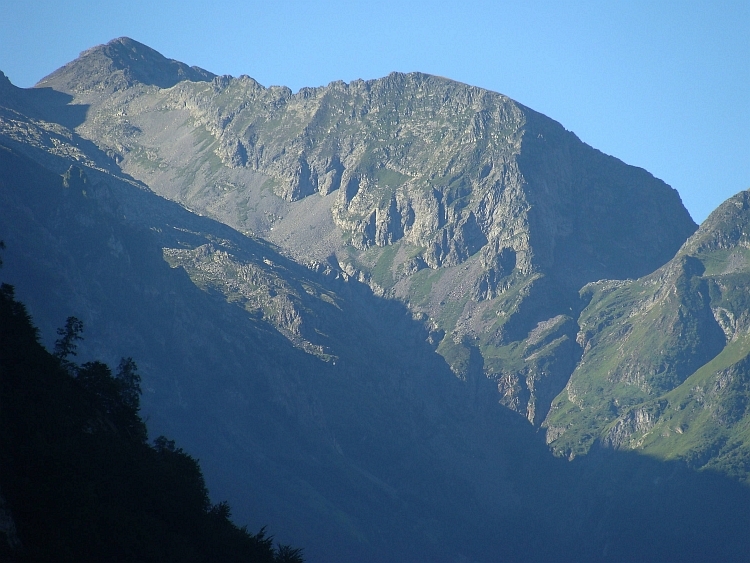 The highest and final pass of the triptych, the Col d'Iraty is 1,327 meters high. The road is still climbing gently, friendly. I approach the mountains fast and soon I am completely surrounded by mountains. I continue climbing through the river valley and the first few hundred meters I overcome fairly easy. Then suddenly the road curls up bluntly. Now it really starts. Even in my lowest speed, I can barely get the pedals round. For a short time I have the relief of a little less steep passage, but then the road gets just as steep as previously. Four kilometres does the test take. I am standing 450 meters higher now, at the 781 meter high Col d'Haltza. On both sides steep grassy meadows plunge into the depths. After the first of the three passes there is no descent but a flat passage on the crest of the mountains, the only flat area in the vicinity. As soon as the ridge starts to climb again, so does the road. Occasionally, there are unsavory steep parts again but not as long or as hard as the Col d'Haltza. I reach the second pass, the unpronouncable Col de Burdincurutcheta. A short descent and a smooth passage through a high valley and I can put myself to the test again. A short but very steep climb leads to the third and highest of the three passes, the Col d'Iraty or Col Bagargui. On top of the pass lies the village Iraty, where they make damn good sheep cheese. Then it is down, down, deeper down like Satatus Quo used to sing. 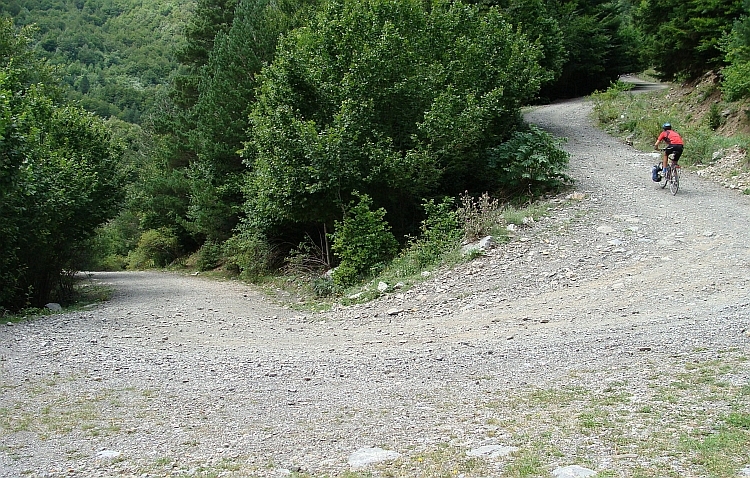 The descent is as steep as the steepest parts of the Col d'Haltza but much more contionuous. That must be a very hard climb. After the long descent follows a short climb to the beautiful village Larrau. Now the exciting part of the day is over. I continue for about forty kilometres to the camping of Asasp, not far from the start of the climb to the Col de Marie-Blanque. I will leave that for tomorrow. Today I have had my baptism in the French Pyrenees. 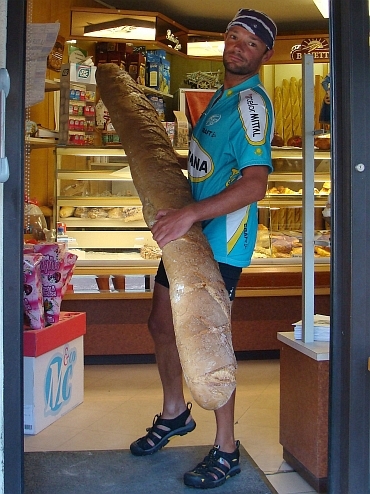 Early in the morning I cycle to the boulangerie Asasp. It will be a monster stage today with first the Col de Marie-Blanque and subsequently the Col d'Aubisque and the Col du Soulor. If I still feel like climbing, there is aldo the col des Bordères. 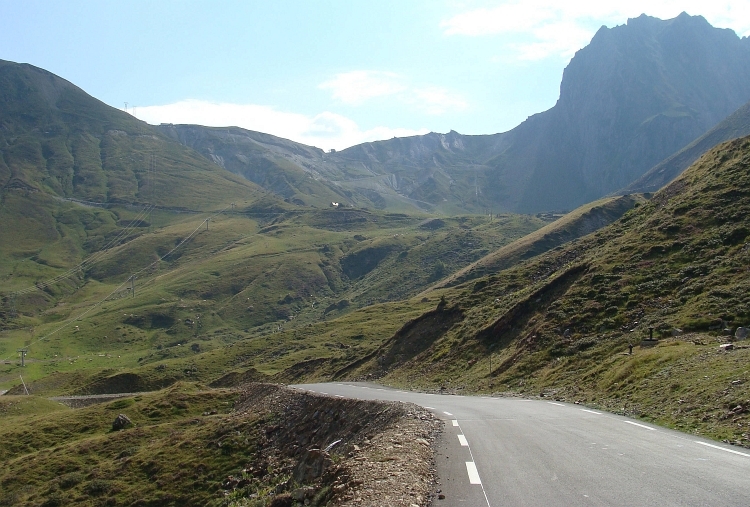 By far the largest climb is the Col d'Aubisque which reaches 1.709 meters altitude. The first climb, the Col de Marie-Blanque, seems to be a taster. I see three parallel lines on my map, a blue line - the river, a white line - the road and a pleasant green line - a beautiful route according to mu Michelin map. A road without hairpins and bends, a pleasant ride up along the riverside. In 9,5 kilometre distance nearly 800 meter altitude difference. Still 800 climbing meters, not to be underestimated. The owner of the boulangerie knows me from yesterday afternoon and she knows that I am traveling on my bicycle. She supports me and gives me extra bread. I am having breakfast in a beautiful place. This must be sufficient for the Marie-Blanque. In the village od Escot, the climb begins and quietly the road goes up. It is nice that this is not a climb that starts off really hard; the experience of the Col d'Haltza from yesterday is still fresh in my memory. After ten minutes quietly pedaling up along the river a thought pops up in my mind. I have climbed more than two kilometre from the start in Escot and I have hardly climbed yet. The road continues to go up gently through the densely forested valley, where the sun produces awe-inspiring light effects on the frosty grass and trees along the riverside. The inevitable happens. At the end of the climb, the road is very steep. According to the signs the last four kilometres are 11%, 9.5%, 13% and 12% steep. Still I am convinced that the Col d'Haltza was steeper. I will check that out later on my GPS, if I feel the need to. Anyway, the Marie-Blanque was significantly more difficult than expected. A very nice descent brings me to the village of Bielle. The high Pyrenees are lying at my feet. The Col d'Aubisque will be the first French pass through alpine landscapes since I have left the Atlantic Ocean. 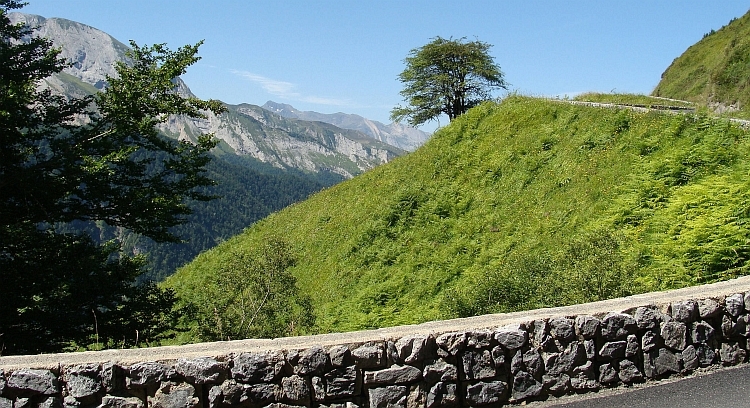 I am cycling through a wide valley to Laruns, at the foot of the climb to the Aubisque. There is not a single cloud in the sky. It promises to be a great climb. After the climbs from yesterday and the Marie-Blanque today, the Col d'Aubisque is actually not very difficult. The climb is never really steep. 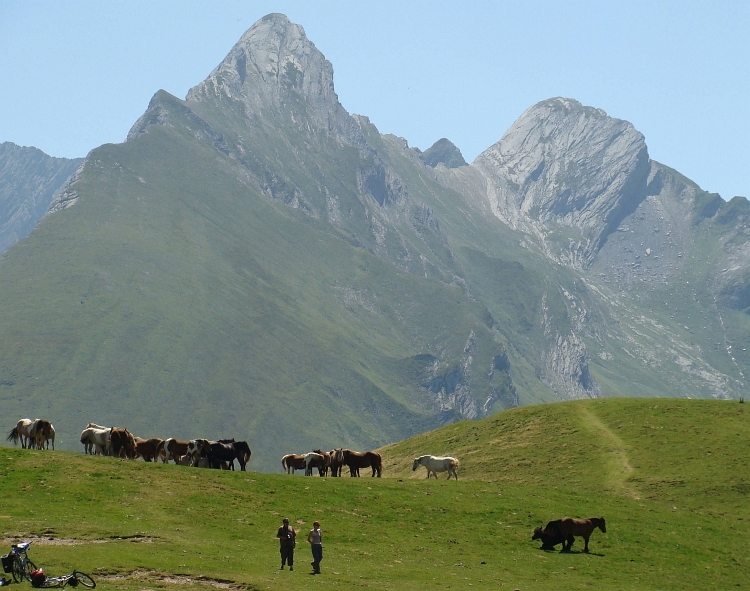 The climb to the Aubisque is remarkably regular, just like most of the climbs in the French Alps. The road climbs almost almost 1.200 vertical meters of elevation and is fairly easy from the start in Laruns until the pass. Views are breathtaking, especially on the last kilometres, as the road is winding up through green grass meadows. I have unrestricted views over the surrounding mountain landscapes. At the pass also views to the east are added as a bonus. 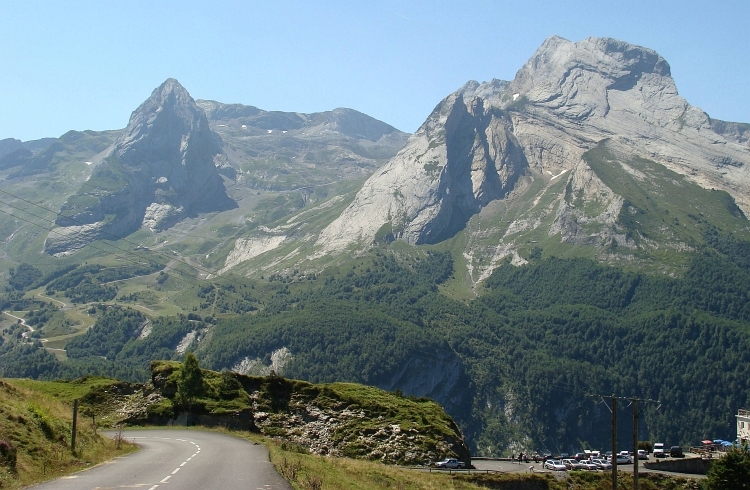 All in all, the Aubisque is one of the finest climbs of Europe. 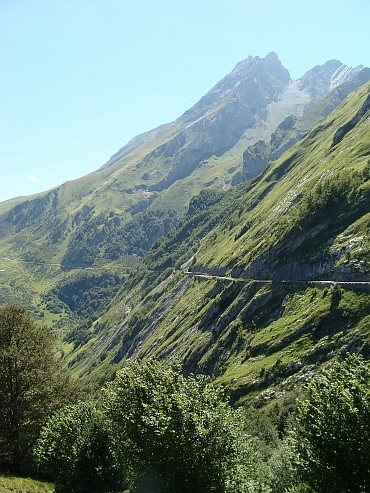 The descent of the Aubisque is unsuitable for people with vertigo. The road clings to a steep cliff. It is here that the Dutch cyclist Wim van Est fell down more than 50 altitude meters in the Tour de France. It is a miracle that Wim van Est has survived the crash. After the breathtaking passage follows a short climb to the Col du Soulor. It is still early and I decide to ride one more climb, the virtually unknown Col des Bordères. 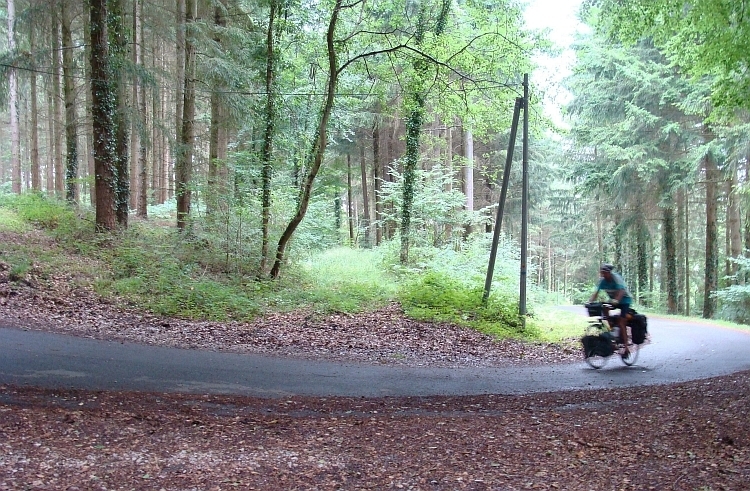 A small, pockmarked road goes up well above 10% gradient, similar to the last kilometres of the Marie-Blanque but on a worse road. But I reach the pass and I start to descend to Argelès-Gazost. The road contains quite a vicious climb on the way down, but there are no further difficulties any more. Near Argelès-Gazost I find a camping. Despite the many climbing meters it is still only half past three. I have a few hours to relax and do nothing. That is good for me as tomorrow the climb to the Tourmalet is on the program. And the Aspin. And perhaps a very special climb... if the circumstances are right... but I must not think about it now. Today is today and tomorrow is tomorrow. It is overcast as I am riding away from the camping of Argelès-Gazost. The mountains are entirely hidden in the clouds - or fog - whatever it is. That is a shame because today is the the stage to the most famous col of the Pyrenees. From Argelès-Gazost at about 400 meter elevation to the Col du Toutmalet at 2.109 meter elevation is a climb of 1.700 altitude meters. And then there is the theoretical possibility of climbing even more, as an unpaved road leads from the Col du Tourmalet to the summit of the Pic du Midi de Bigorre. A theoretical possibility because I do not know whether the road is actually accessible. A theoretical possibility, because the road is also very steep, especially on a fully loaded bike. According to my information the road is a jeep track that leads up to 2.650 meters and from there a footpath leads to the top at 2.872 meter altitude. In fact everything is unsure. Maybe there are too many walkers. Maybe the weather is not good - at the moment it seems to be that way. Or maybe I will be simply too tired after the 1.700 meter climb to the Tourmalet. But I do not have to deal with those questions now. Not yet. Now I am down below, on the busy road to Luz Saint Sauveur. I am cycling in a narrow valley that leads up through the gray, dark landscape. Cars are chasing by all the time. As I reach Luz Saint Sauveur, the town has just awakened. There is a hurried atmosphere. I turn left, to the Tourmalet. The climb really starts now. The climb itself is not too difficult - the climbs in the Basque Country were much steeper. After a few hundred feet of climbing I reach the village of Barèges. Suddenly I am above the clouds. It is an unexpected thrill to ride in the sun instead of in the gloomy clouds. I am not the only cyclist on the Tourmalet, I am chatting with colleagues who are cycling up on road bikes. For some cyclists every meter is a battle. I am going fairly easy today. The Tourmalet is a long climb but the Col d'Iraty and the Marie-Blanque were much steeper and harder for a cyclist with fully loaded bikes. The infamous final mile is also not too difficult. I have reached the pass at 2,109 meters. I am having a break at the busy tavern on the pass. Part 1 of the plan is accomplished now. I am making my mind up. It's 11:30 in the morning, I have climbed 1,700 meters and to my surprise the weather is good now. So basically I have enough time to climb to the Pic du Midi de Bigorre and all the other conditions are favourable. The only uncertainty left is the quality of the road that does or does not lead to the summit. I decide to take up the challenge; I can always turn around. The first few miles are not too steep and the dirt road is of reasonable quality. This does not mean that it is easy going here on a fully loaded bike - it is far from that. From the first meter this is much harder than the tarmac of the Tourmalet - but it goes. The road is leading over a pretty steep slope to a mountain lake. There are no other cyclists here. 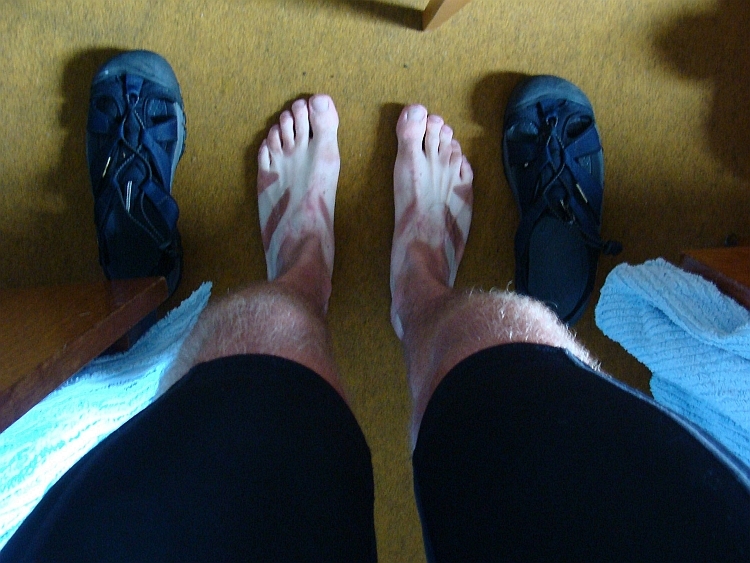 Not even mountain bikers. The only other people on the road are hikers, who are astonished that there is a cyclist that is going up here. Behind the lake the pyramid of the Pic du Midi de Bigorre is rising. I can see the road on the hillside, a steep zigzag line that eventually leads to a hut on the pass, not too far below the summit. According to the reports, the road stops there. If I succeed to come that far, it is not too far to the top any more; I could leave my bike there and walk to the summit. I am cycling along the lake and reach the carcass of a building at the foot of the steep top section. This is the point that the road gets a lot rougher. And this is the point that the road really gets steep too. And this is the point, that every turn of the wheel is a fight. Each turn brings me closer to the top. Slowly I crawl up the winding road. Sometimes my rear wheel slides away in stretches of loose sand. Sometimes I bump onto large rocks and the front wheel is forced to make sharp curves to the left or right. Every meter of the way I have to focus to just keep the wheels turning, to just keep going without sliding in loose stones or to just keep myself on the saddle. And every meter of the way I have to concentrate on the road that lies before me, to find the lines with a minimum of obstacles. This road requires the utmost of myself and would have been a major challenge without luggage as well. Actually this is idiocy. But I feel sharp. I feel charged to my deepest veins, on top of my abilities. but the next moment all I feel is gnawing doubt. Am I not pushing the limits a bit too far now? The hikers react in a very positive, stimulating way but most of them are completely stunned too. Can you cycle up HERE?? With such a heavy bike?? It is possible - I believe. That is my uncertain answer. The hikers usuakky walk on the best parts of the road. I cannot blame them. The result is that I cannot always choose to ride the best lines. The road becomes steeper after each hairpin. I do not always succeed to get the pedals around. To get myself in motion is a challenge in itself. Each meter is extremely difficult now but each meter brings me closer to the top. And certainly closer to the hut. I approach the cabin faster than expected. Another bend. One last effort. I reach the pass, just below the top. I am able to get a bit further with the bike. I leave my bike at the beginning of the narrow footpath. The last few hundred meters I do on foot. I reach the summit. I am standing 2,872 meters high on the Pic du Midi de Bigorre. Deep down below I see the Col du Tourmalet. Behind lies the ridge of the Pyrenees. I am at the same elevation as the higher peaks of the Pyrenees. An impressive sight. Below me, more than 2,500 meter below, I see the lowlands of France. Then it is time to go down. I walk to the bike and begin the descent. It amazes me that the descent is not too difficult. Not easy either, but it goes faster than expected. With the necessary effort I reach the tarmac of the Col du Tourmalet and let me go down on the smooth asphalt. Delicious, speed! I am rushing along La Mongie and race down to Sainte Marie de Campan. I decide to cycle up the Col d'Aspin and descend to Arreau too. That is better for tomorrow and I do feel like doing another climb. The Col d'Aspin is not too difficult and not too long from this side. After an hour of climbing, I am on the pass and I am looking down the hairpins that are leading down on the steep slopes. This promises to be a thrilling descent! The descent proves indeed one of the most spectacular descents that I have done. It is a worthy closing of a memorable day. The day that I have done one of the most difficult and certainly one of the longest climbs of Europe. 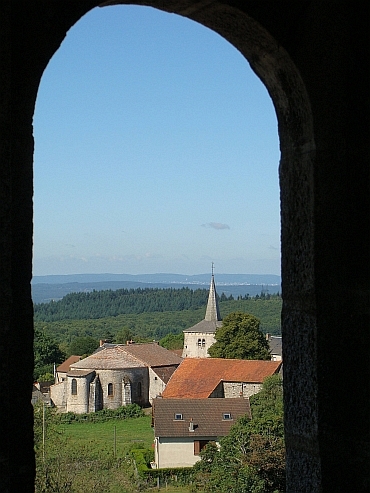 I find a place in the Municipal camping in the beautiful mountain village of Arreau. At 7:30 I have had breakfast and I have left the campsite. I am off. The weather is still good, although the air is dense and humid. The first kilometres of the route to the Col de Peyresourde is not so special. I am cycling on a relatively big road. The road is not steep. Only after ten kilometre the road climbs above the valley. There are some atmospheric views into the valley now with mysterious layers of fog between the villages. While the fog in the valley is not dissolved yet, the clouds are already rolling into the skies, an omen of the announced weather deterioration. The day begins with two steep climbs. 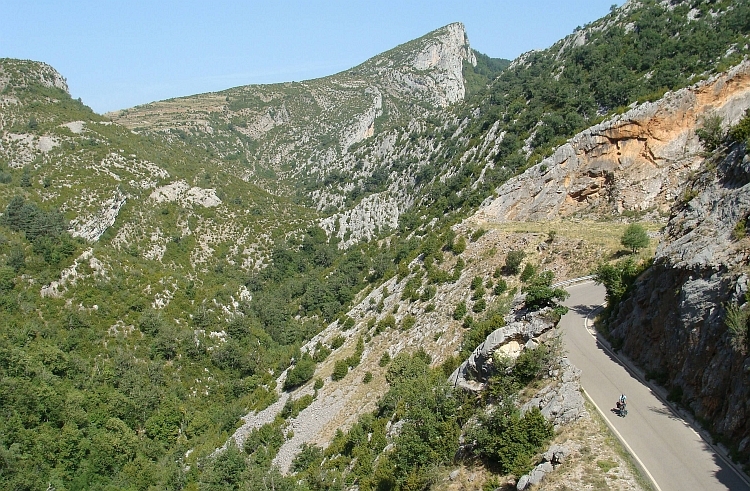 The Col de Menté climbs 850 meters in 9 kilometre and the Portet d'Aspet climbs 430 meters in 4,4 kilometre. I am early today and at 9 o'clock I have done two climbs and I am standing on the Portet d'Aspet. It has been beautiful because of the low sun. After the hard work follows a long descent and a much longer flat stretch until Castillon en Couserans at the foot of the climb to the Col de la Core. The Col de la Core is much less steep than the Col de Menté or the Portet d'Aspet but it is the most difficult for me. For the first time this bicycle journey the heat is overwhelming and I am obviously not used to it. The climb is interrupted by small descents so that I am not able to get rhythm. I am happy to reach the pass and I descend immediately to Seix to find a place on the camping. The afternoon I spend around the pool of the camping and the adjacent bar. Seix proves to be a beautiful place. The cool colors of the river and the mists make a brilliant contrast with the warm colors of the village behind the river that is already bathing in the sunshine. A new positive surprise is that the little breads of the patisserie are extremely good value. When I am leavinf Seix, it is still pleasantly cool. Still. It looks like this is going to be another sunny and extremely hot day. I am going up slowly through he valley of Ustou. I am cycling to the Col de Latrape. 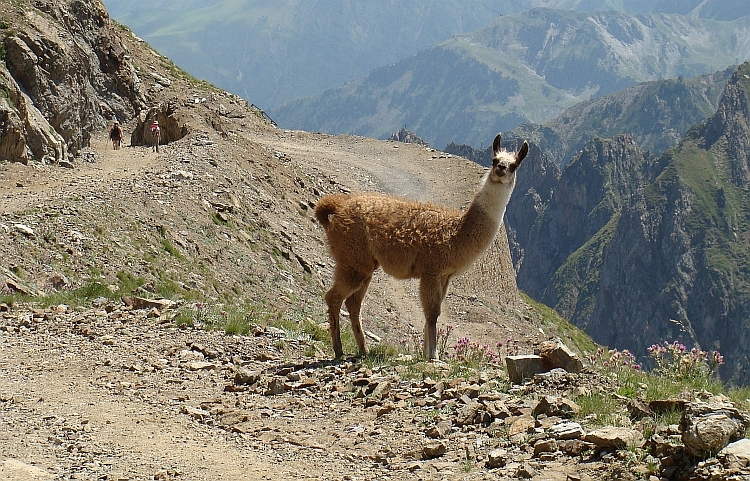 The pass lies at 1,111 meter altitude. Despite the low elevation the landscape is pretty mind-blowing. The scenery offers Himalayas reminiscents. 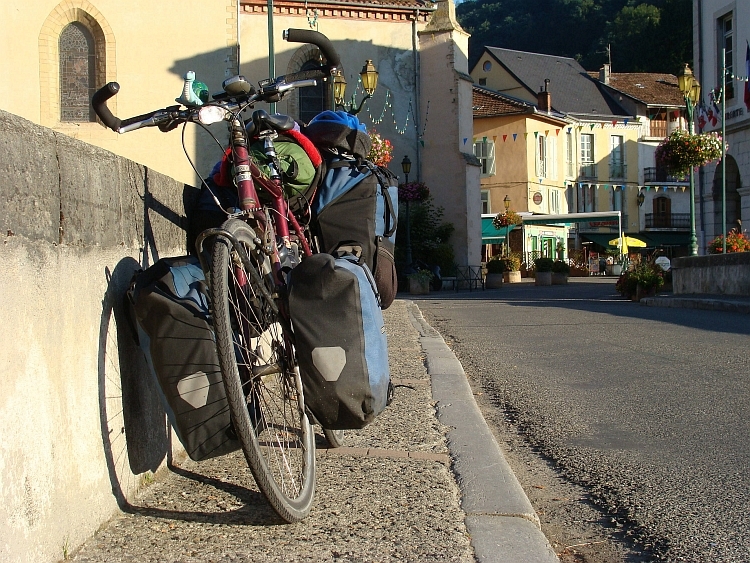 Other than the Himalayas, I reach the pass without much effort and I descend to Aulus les Bains, where I meet two young bicycle travelers that I met earlier on the camping of Saint Béat and again at the camping of Seix. They have started even earlier than I did. 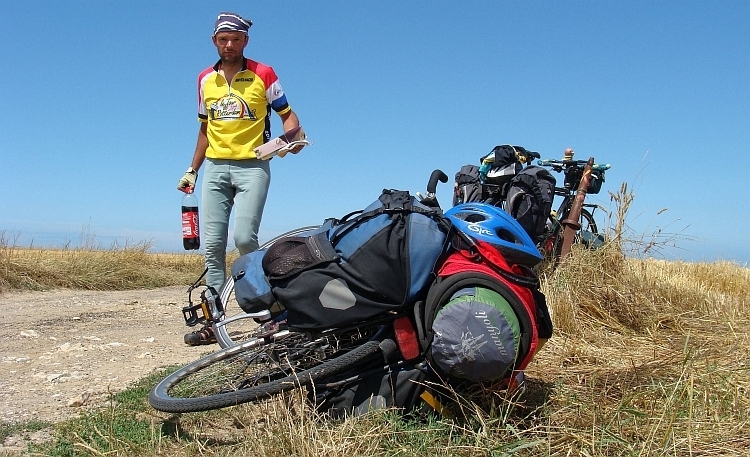 They are the first bike travelers that I meet in the Pyrenees. 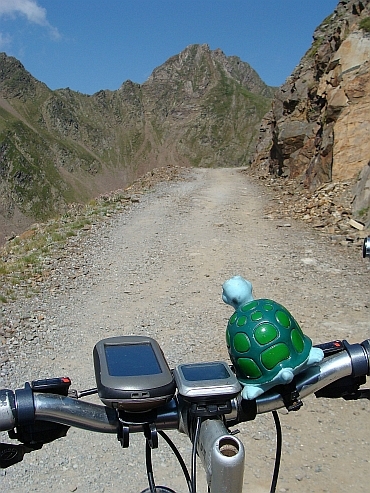 After exchanging experiences I am going for the tough climb to the Col d'Agnes. The first half of the ascent is continuously around 10 % steep. The second half is slightly less steep. It is not hot yet and I digest the climb well. A final series of hairpin bends brings me to the pass at 1.570 meter elevation, 900 meters straight avove Aulus les Bains. I enjoy the great views. Then I sink down to a nearby lake and I start the short climb to the Port de Lers. After fifteen minutes I standing up the pass. Then follows a long, steep descent to Vicdessos and further down into the oven of Tarascon sur Ariège. Tarascon sur Ariège is not only mercilessly hot, it is also busy. 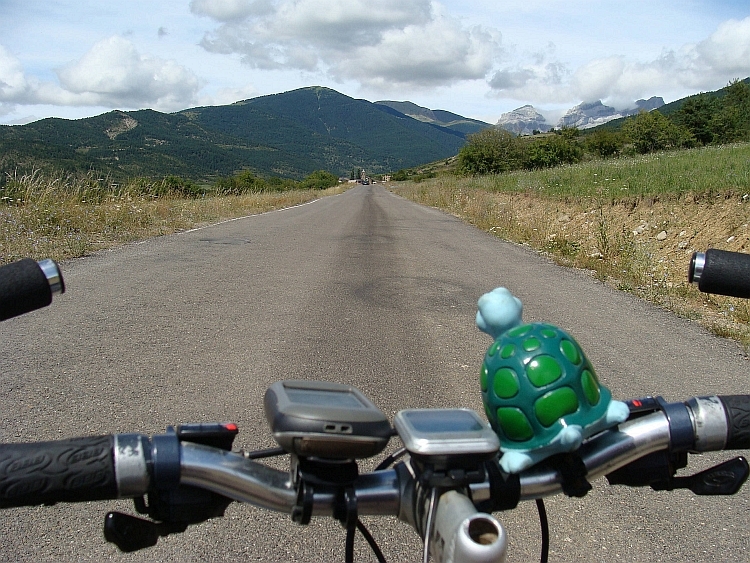 I find myself on the transitory road between Toulouse and Andorra. Time for a break. In a pub, behind a cappuccino, I am thinking whether or not I will continue today. An Irish bike traveler says he pullsis cycling through Europe for a few months, a ritual that he repeats every year. He will cycle to Ax-Les-Thermes and Andorra over the busy road and then continue to Gibraltar. 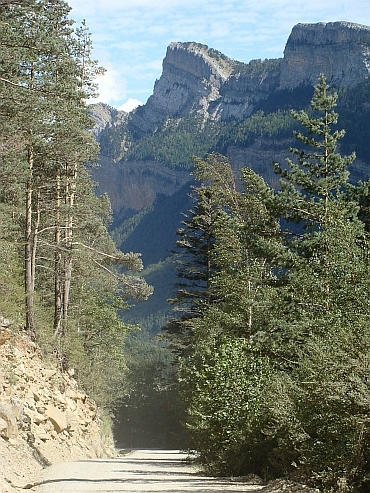 I am also heading in the direction of Ax-les-Thermes but I opt for an obscure road through another valley, a little further, the road that leads to the Col de Marmara and the Col de Chioula. This route is much harder than expected, partly due to the heat and partly by the erratic course of the climb with many intermediate descents. In the end I am making much more and altitude meters and much more length meters than expected. An extremely hard and tiring finale of an already challenging day. After reaching the Col de Marmara and later the col de Chioula I am finally rewarded by the descent. Wgen I am down, I find out that the camping of Ascou is another three kilometre uphill towards the Port de Pailhères. When I finally reach the campsite, everything turns out well. 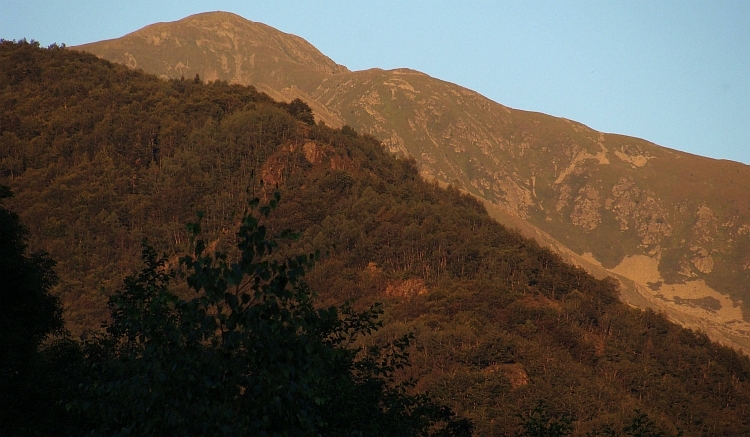 The campsite lies scenically between the mountains, far from towns and cities. The site has got a nice atmosphere and is run by fellow Dutchies. As I am putting up my tent, the sun is already setting and is painting the mountains in deep red and orange colours. I feel the efforts of the last day as I am climbing to the Port Pailhères. I have left at half past eight to avoid the mid day heat. The last few hundred altimeters from the climb are around 9 % steep, no steeper than most of the Pyrenean climbs, but it takes more energy than usual. Nevertheless, I am standing on the pass, earlier than expected. The road on the other side of the pass is extremely winding. The rollercoaster descent brings me in the village Mijanès. A little further down the road I cross the route from two weeks ago, when Willem and I were on our way to Spain. I descend further down to the river and climb to the abandoned village of Escouloubre les Bains. It is only 11 o'clock in the morning and it is burning hot. I expect some extreme conditions for the afternoon. In advance I decide that the Col de Jau will be the last climb today, then I only have to descend to Prades. 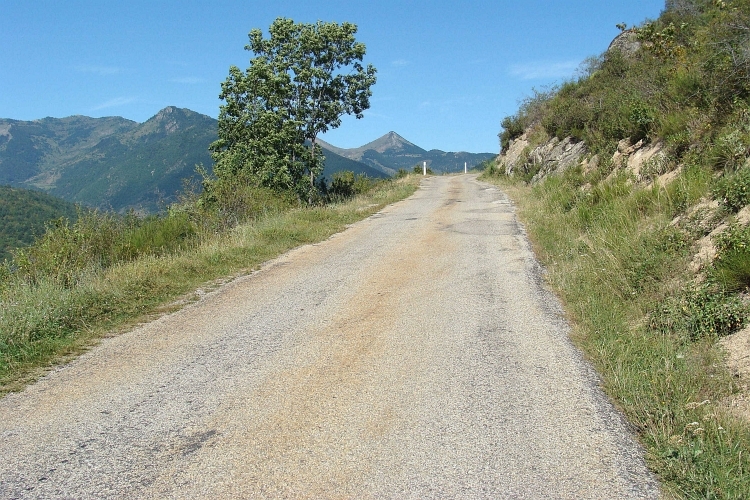 The road to the Col de Jau climbs and descends over the prepasses. After the Col de Moulis I loose quite some altimeters but after the climb to the Col and the Caravel follows a drop of four hundred altimeters. Altieters that I have to climb back and then another 250 meters added to it. Bloody hot, that is the short summary of the final climb to the Col de Jau. Accordingly, there is not so much else to it. I am resting a long time at the pass, a break that I really need. Then I go down, 1.200 meters down into the heat of the valley. The descent gives zero cooling. I descend through a bare and open landscape to the beautiful Catalan village Mosset. Then further down. Mediterranean scents. Rosemary? Thyme? Too hot to think. Finally I reach Prades. I greet an old man in French. "Bomdia," he says back in a corrective tone. In the Catalan language. The Catalan nationalism is everywhere. Name plates of cities, Catalan flags, Catalan stickers on cars. I am surprised that the people are so dedicated with respect to the Catalan case. Ihave the impression that it was not quitelike this ten years ago not. I reach the camping. I am greeted with an open smile. "Bomdia" greets the camping owner in a worn-out jeans and "Free Catalonia" shirt. Vague clouds are hanging over the valley. I pass the pretty village of Eus, that clings against the mountain. In Marquinaxes begins the long, gradual climb to the Col Palomère, the last big climb of the Pyrenees. along the Massif du Canigou shave, a bulky mountain of 2.700 meters altitude, far higher than the surrounding foothills of the Pyrenees. Slowly the road climbs ever higher above the river. The valley is becoming narrower. The road is winding above and along the river mile after mile. Then the road descends to the river aand I reach the beautiful village Baillestavy. 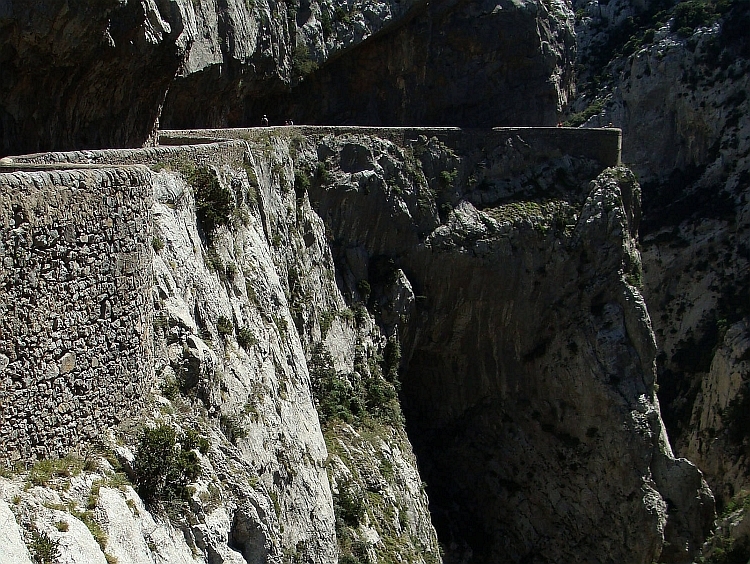 The road climbs again, deeper into the mysterious Massif du Canigou. The climb is a bit steeper after Baillestavy but the Col Palomère certainly is certainly not difficult. I reach the pass at the moment that the cloud cover is opening. Unexpectedly I am having some fine views over the huge Massif du Canigou. It is too hazy for sea vistas. The descent to the sea is not a long, flowing way down. Long, yes, but flowing, no. The descent is interrupted by lots of intermediary passes like the Col Xatard and the Col Fourtou. 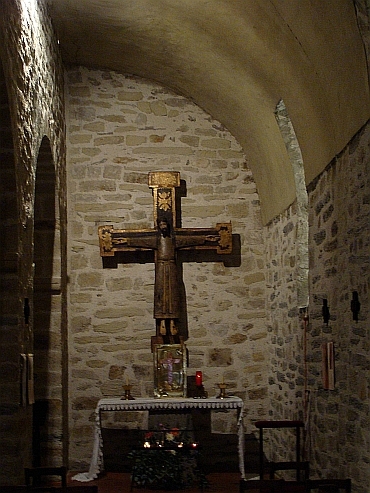 A highlight is the intensely atmospheric chapel "La Trinité" near Prunet et Belpuig. The last col, the Col de Llauro, is a free one. I do not have to climb a single meter. 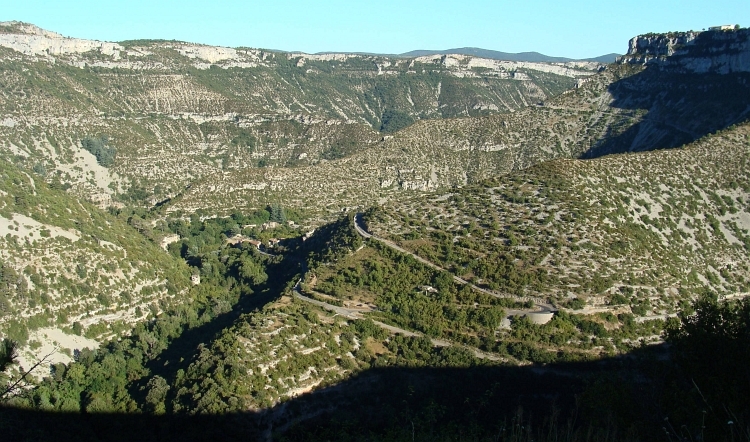 I cross the pass in the descent and go down further down to Llauro and Vivès and reach the busy road to Le Boulou. The charming mountain roads have given way to the wide, crowded and cheerless highway to the sea. I just have to carry on now. In Montesquieu des Albères I can finally leave the busy road and I am cycling along a stretched out hillrange over Soride to Argelès sur Mer. Now that I have come this far, I also want to finish the Raid Pyrenéen. 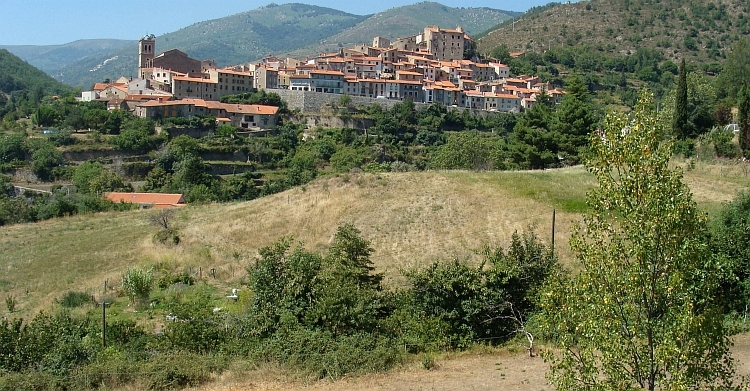 The endpoint of the Raid Pyrenéen is Cerbère, the southernmost town on the French Mediterranean coast, near the Spanish border. I am cycling to Collioure, a lovely located but intensely busy resort. After Collioure I cycle through the dramatic landscape of the Côte Vermeille where the Pyrenees collapse into the Mediterranean Sea. 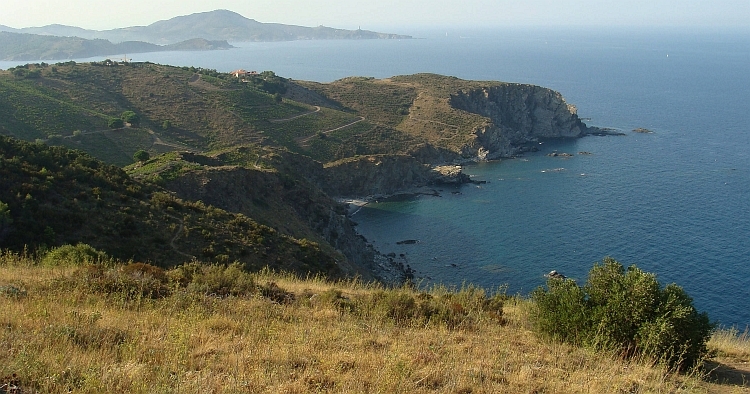 The most beautiful stretch of the coast is between Banyuls and Cerbère. Cerbère is the end of the Raid Pyrenéen and also a great opportunity for me to end the Raid Pyrenéen, the coast to coast crossing of the French Pyrenees. Eight days and three hours ago I stood at the beginning of the Raid Pyrenéen in Hendaye at the Atlantic Coast. It took me a little more than a week to cross the French Pyrenees. A great adventure. The journey is nearly over now. I now have to travel in four days to the village of Suze la Rousse, sixty kilometres north of Avignon. The bus back home will leave there to bring me back home. Now the Pyrenees tour is finished, I have four days left to cycle to Suze la Rousse in the Rhône Valley. Here I will go back home by bus. For today the task is simple, to to reach as far north as possible. The further I reach, the more time I will have left for nice routes in the Massif Central. 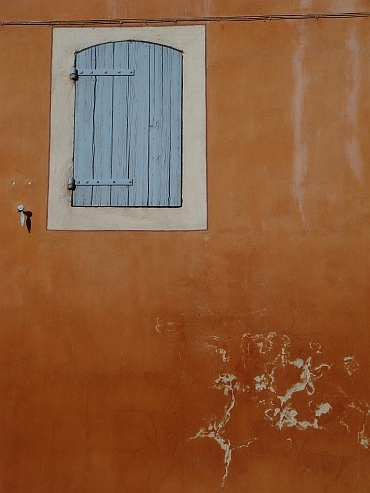 I cycle back to Collioure and Argelès, where I leave the mountains for good. I am riding along the Mediterranean Sea. For the first ttime in weeks I am riding in a completely flat landscape. I am cycling over straight roads, through busy coastal resorts without atmosphere. Of course, this is not exactly a highlight after almost three weeks of extraordinarily beautiful landscapes in the Pyrenees. Unfortunately the roads are not only busy but also poorly maintained. There is a dense pattern of holes in the road so that I am not able to get myself any speed. by far the biggest problem however is a merciless, stormy wind. When I have crossed the coastal plain in Villelongue de Salanque, I can choose between a flat route across the busy coastal highway and a hilly inland route through an almost deserted region. I meet a fellow cyclist, who is doing a long bicycle journey for the first time. He has cycled the whole day on the busy highway. He has had it with the headwind and despite his bad experiences on the highway, he nevertheless chooses to continue on the highway. The young man seems good company so I try to persuade him to make the detour over the inland route. It is a futile effort. He wants to make distance as quick as possible. Alone again. The wind continues to rage relentlessly over the open Mediterranean landscape. 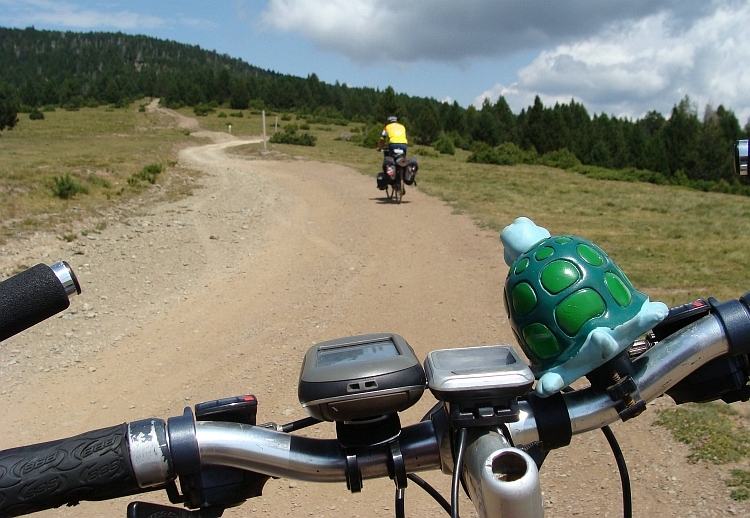 With turtle speed I am struggling to find a way towards the bare hills. When I reach the hills and the road starts to climb, my speed drops to nearly zero. Have I made the right choice? Probably I should have asked the same question if I would continue slogging on the highway with the trucks passing me by. The landscape is completely abandoned. When I finally reach a settlement, there is no sign of life. I cross the dust-blown streets of Opoul-Périlles and climb to a small pass. Even on the descent I need force to gain any velocity. Two more small passes and the road turns back towards the coast and I finally have the wind in my back for a short time. In no time at all I am back along the coast, where a short stretch on the highway cannot be avoided. The poor road surface, the wind, the continuous passing of the trucks: it's horrible here. If I can leave the road after a few minutes, I am happy to do so. An unexpected scenic highlight are the inland seas south of Narbonne. Land and water produce an unpredictable landscape composed of strangely red soils, blinding white salt concentrations and hallucinatory reflections on the shallow sea. 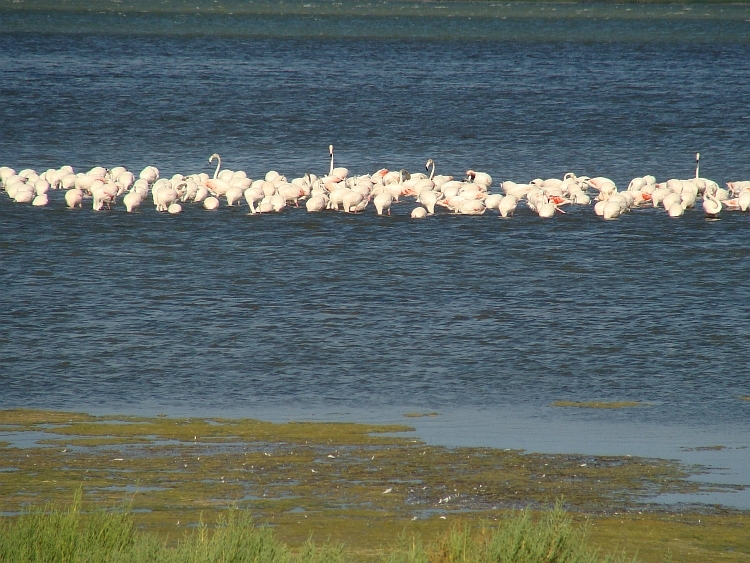 The large groups of pink flamingos are a delightful added bonus. 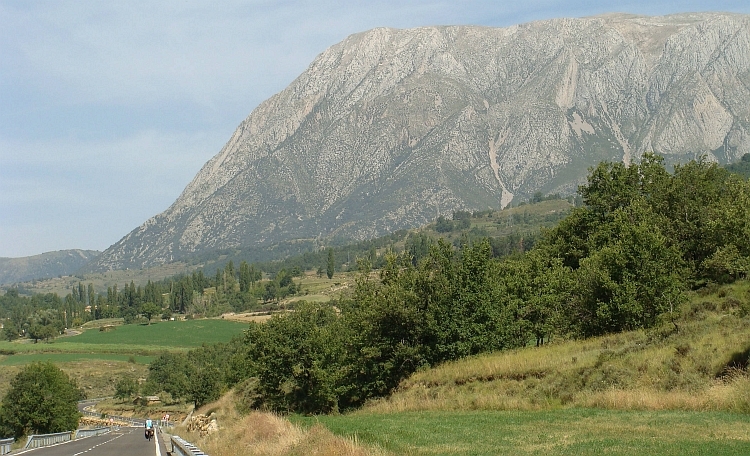 After traversing this landscape I reach Narbonne, where I find a camping. I am up early to avoid the expected headwinds. I want to cover distance today. If there will be a stormy northern storm like yesterday, it may be a long day. To my surprise, the wind is absent. Without effort I am flying over the small roads in the flat landscapes between Narbonne and Béziers. I reach Béziers and cycle further to the ancient town of Pézenas. 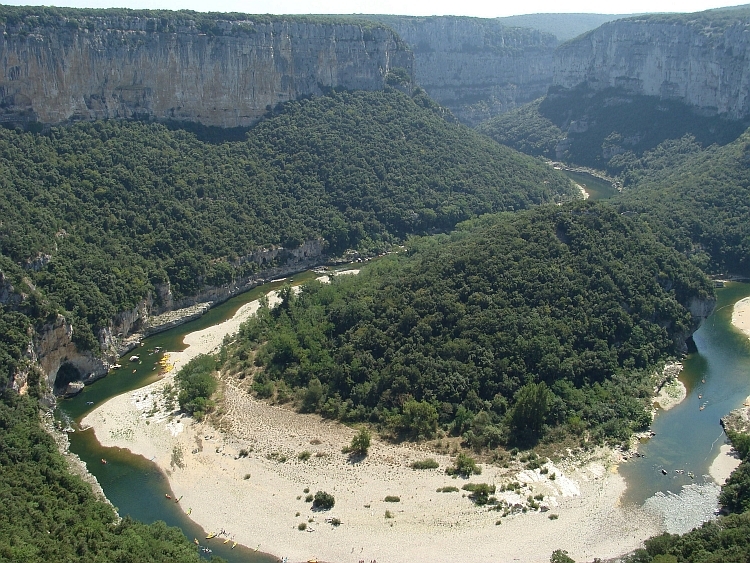 Along the river Hérault, I am heading north to Gignac and Aniane and finally I reach the southern foothills of the Massif Central. Between Aniane and Saint Guilhem le Désert is the Pont du Diable, literally Devil's Bridge, which crosses the Hérault gorge at the point where the river leaves the mountains and flows into the lowlands. I cross the bridge and move on through the mountain vineyards of the Central Massif. I reach the pilgrim town of Saint Guilhem le Désert, an atmospheric and beautiful place. It is time to decide what to do in the last days. The long route through the Massif Central or the short route south around the Massif Central. I decide to do the first option. That means that I need to cross the plateaus adjacent to the Hérault and the Vis rivers. But first, I will have to make the climb from lowlands to the highlands. I cycle back to the Pont du Diable and further to Montpeyroux. Here begins the climb to the Col de Vent, literally 'Windy Pass'. An appropriate name because after a windless morning there is a solid wind again. No stormy conditions like yesterday, but enough wind to suffer and struggle. The road is winding in all directions and despite the kilometres I hardly see myself making any progress on the GPS. When I finally stand on the pass, I am actually on the plateau. A straight road is leading through a scenic landscape. Left and right lonely hillranges rise above the plain. The wind is in the right direction now and I am flying full speed through the landscape. Lucky for me, because I have seriously misjudged the distance. In less tham no time at all I cross the plateau. The sun is already low when I am standing on the edge of the plateau. 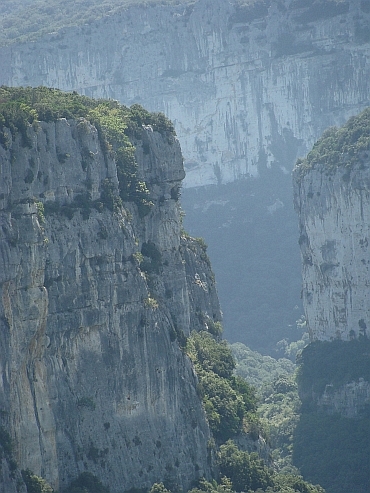 Before me lies the great canyon of the Cirque de Navacelles. The light show is breathtaking. That is the advantage of a poor planning: I am so late that I see the Cirque de Navacelles at its best in the best possible light conditions. I descend the cliff, to the village Navacelles. 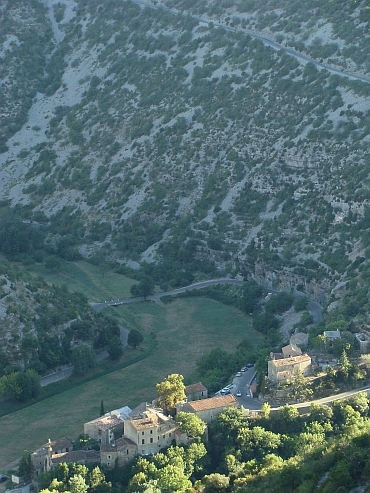 The river has produced an arc around a rocky point and on the rock in the middle of the valley lies the settlement of Navacelles. I cross the river Vis and climb steeply to the plateau on the opposite side of the canyon. Up above, I am looking into the canyon for the last time. The last sunbeams cast their light in the gorges. 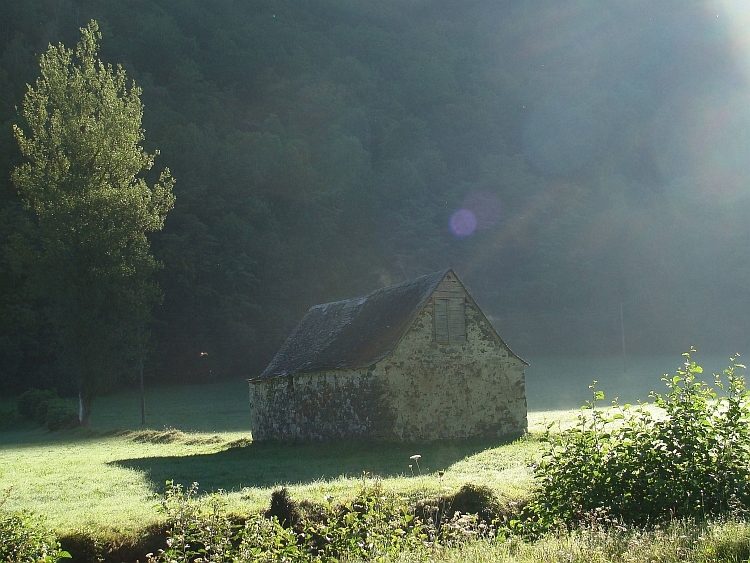 The village Navacelles is beautifully enlightened by the last sunrays with the surrounding countryside in the shade. I leave the gorges and I have a final plateau to cross. The distance is not too much and with the wind in the back and a considerable effort on my part the plateau is easily overcome. The sun has already set and soon it will be dusk. A long descent brings me in Le Vigan, where I find a camping. As I am pitching the tent, it already starts to get dark. The next time I will not commit myself to such a tight schedule anymore. But the most important is the satisfaction from a beautiful day. 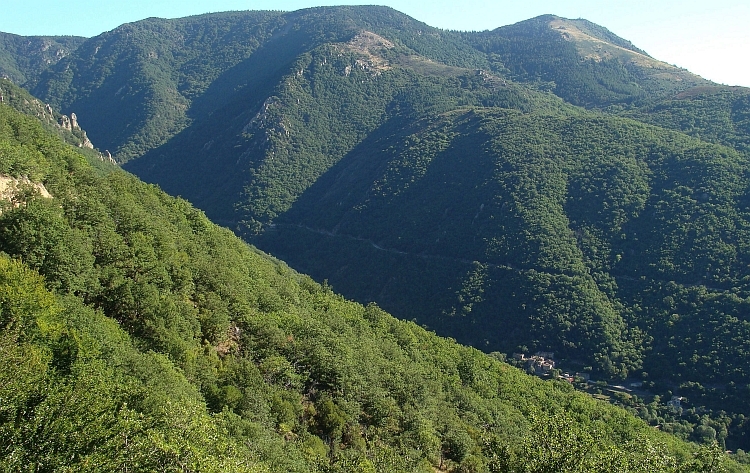 My first goal for today is to climb the Mont Aigoual, a mountain of 1,567 meter high on the edge of the Massif Central, in the Cévennes National Park. I have climbed the mountain previously in the autumn of 2004 from Meyrueis. At that time we had very bad weather. This is a perfect chance to climb the mountain in good weather. There are different ways that lead to the summit. 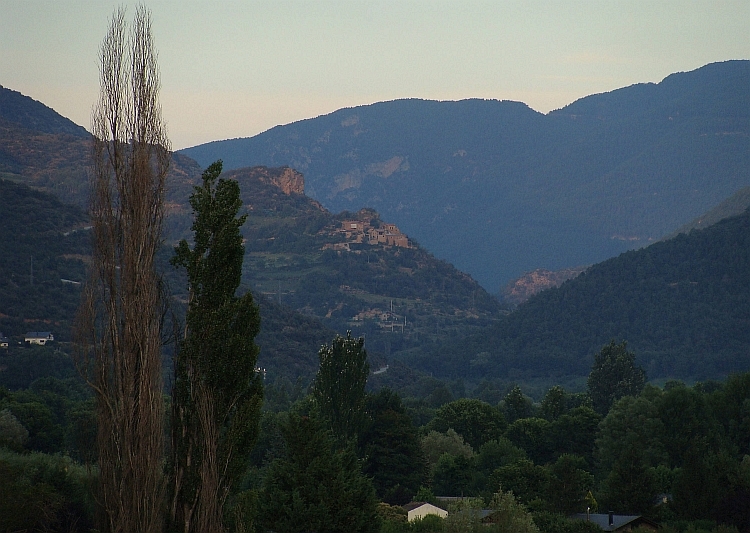 I climb the slopes of the Giant of the Cévennes over the Col de Minier. The route from Le Vigan to the Mont Aigoual over the Col du Minier is perhaps the easiest long climb of the World. The first part from Le Vigan to the Col du Minier ascends one thousand altimeters and is nowhere steeper than 4 to 5 %. Despite a leisurely effort I go up with highly unusual velocities for a climb on a fully loadad bicycle. On the Col du Minier I do not need to rest. The road does not climb for a few kilometre and after the flat stretch there is a small descent. I begin the final climb to the bald colossus. For the first time I actually feel like climbing, but because I am talking with a group of veterans, I forget again that I am busy climbing and I am surprised to see that the road suddenly ends. We are already on the summit. I have climbed 1.300 altimeters from Le Vigan. I should be at least a bit tired but that is not true. Nevertheless, I think I deserve a break. I enjoy the views from the terrace of the large tavern. I recognize the silhouette of the other famous giant of the region, the Mont Ventoux. The weather is beautiful today, the circumstances could not be more different from those of 2004, when it rained so hard that the views were limited to no more than a few meters. 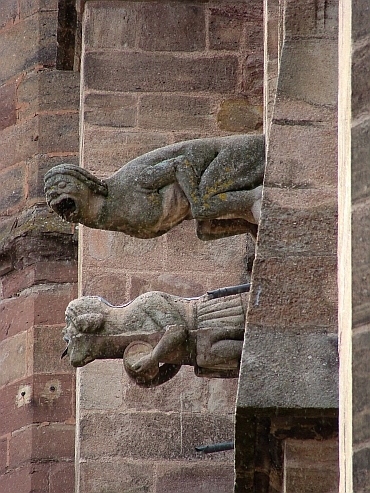 I descend to Florac. I turn to the east to Le Pont du Mont Vert and the Col de la Croix de Berthel. 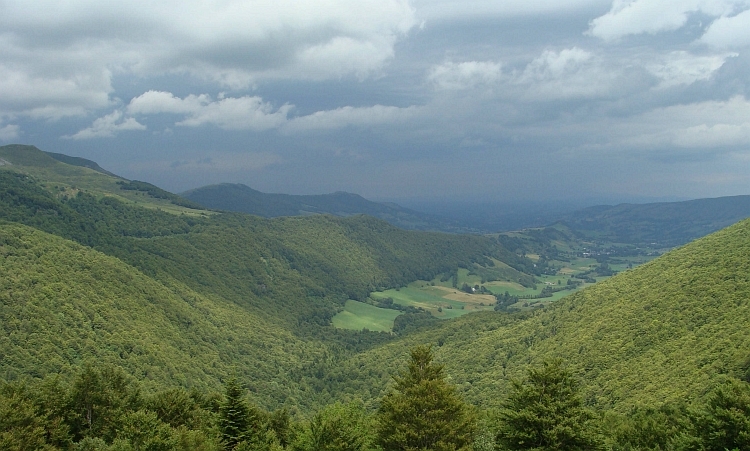 The climb takes me past the barren, weathered granite ridge of the Mont Lozère. On the Col de la Croix de Berthel I reach the last great pass of the journey. To the east lies a deeply weathered landscape that gradually drops to the valley of the Rhone. I begin the long, winding descent. I take a secondary route on a long ridge that runs parallel to the river valleys north and south beside the ridge, several hundred meter below. In the descent are some nasty climbs that are much more tiring than the long ascent to the Mont Aigoual from tomorrow. It has become blisteringly hot and humid. The stale air hangs like a wet mop around me. On the small ascents, the mop is being wrung; thick drops of sweat gather on my forehead, grow tall and fall down. The final kilometres are ultimately tiring and when I finally reach the town Bessèges I am ready for today. Down below it is yet another few degrees warmer and it feels like a tropical shower is in the air. After having bought food for the dinner and having installed myself on the campsite the shower is still in the air without a raindrop has been coming down. The last day of the journey does not bring a festive final chord yet. It is cloudy and the higher mountains are hanging in the clouds. Circumstances are not very inspiring. But there is also a favorable condition. It is considerably cooler than yesterday. I spin the pedals around leisurely and on quiet roads I proceed to St Ambroix and Barjac and ultimately Vallon Pont d'Arc. Suddenly the sun breaks through the clouds and everything begins to brighten up a bit. In Vallon Pont d'Arc it is done with the loneliness. 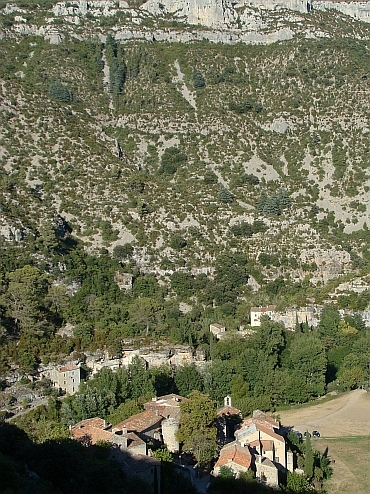 The small town is the gateway to one of the most touristy sites in France: the Gorges d'Ardèche. The town is literally the gateway to the famous gorge as the rocks form a natural arch over the Ardèche river. Dozens of people have come here to behold the natural wonder. In fact the drama is just beginning. The Ardèche river finds its way between sheer limestone cliffs and winds through the rock walls in the direction of the Rhône Valley. The road follows the course of the river on the northern plateau. Ever new vistas are emerging. The long gorges of the Ardèche is the last highlight of the journey. At St Martin d'Ardèche I leave the gorges. I descend into the wide Rhône valley and cross the valley. In St Paul Trois Châteaux I cycle into a side valley. A small climb brings me to a small, unnamed pass. In the distance there I see the huge pyramid of the Mont Ventoux. This time I will not climb to the top of mythical mountain. I descend to Suze la Rousse, the end of this cycle trip. 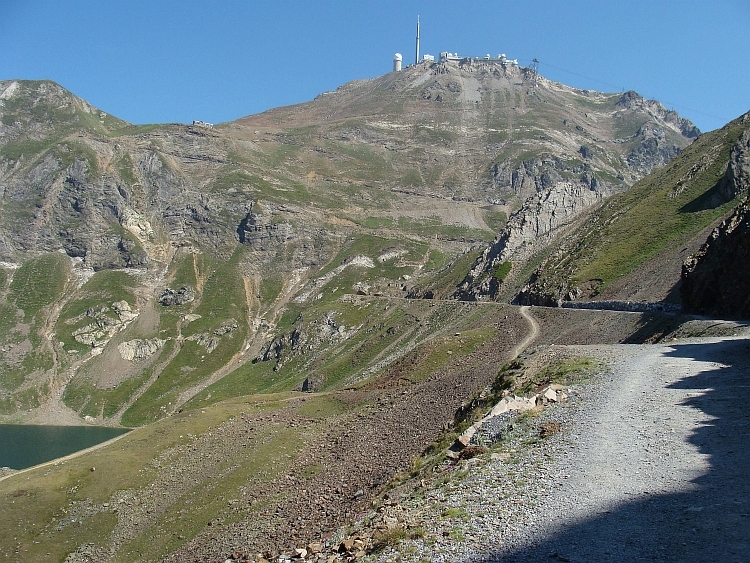 Which cyclist can resist the temptations of the big cols like the Aubisque or the Tourmalet?